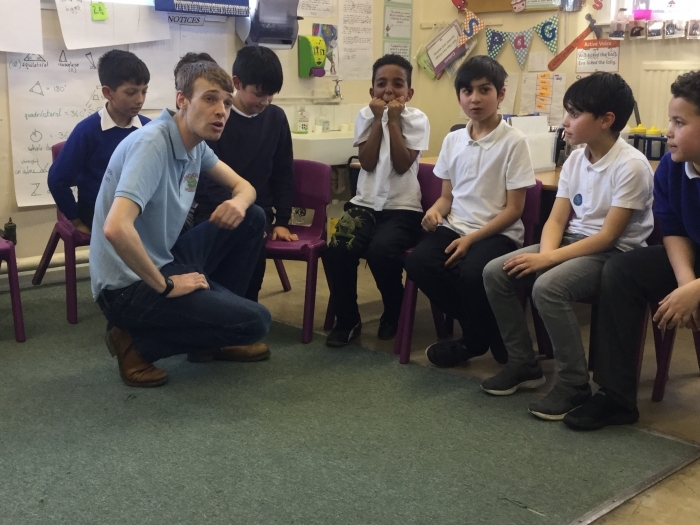 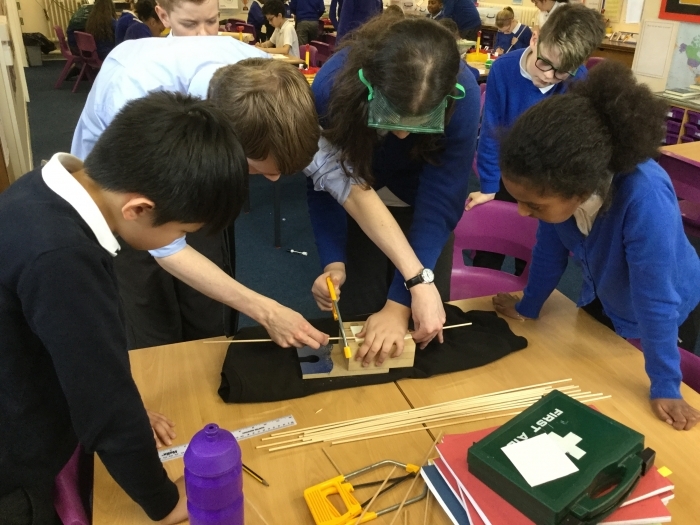 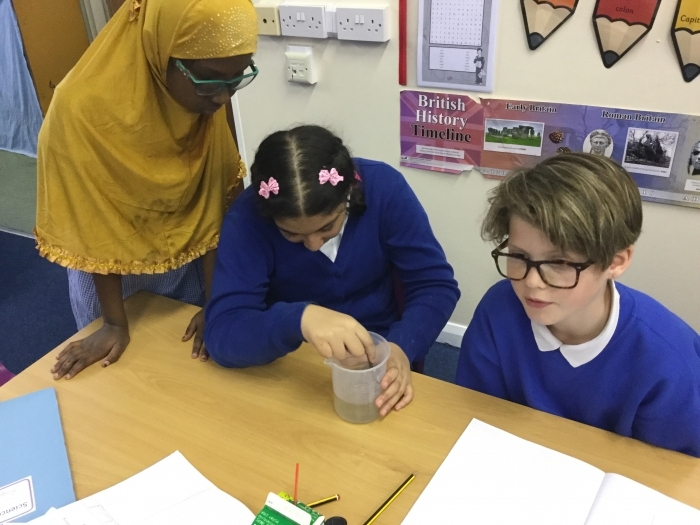 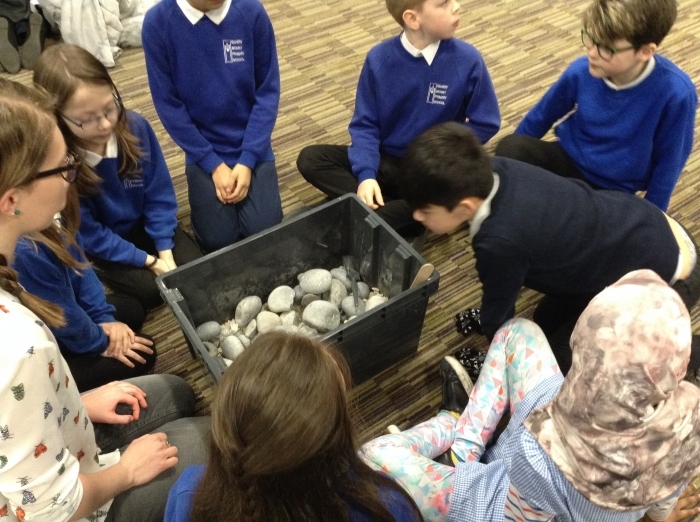 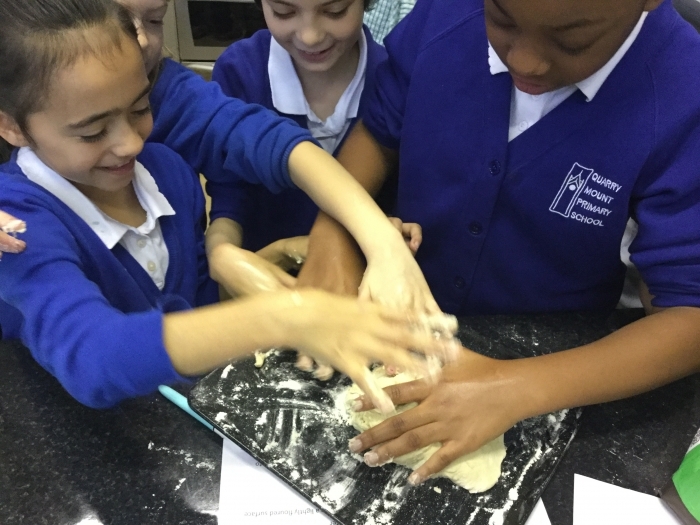 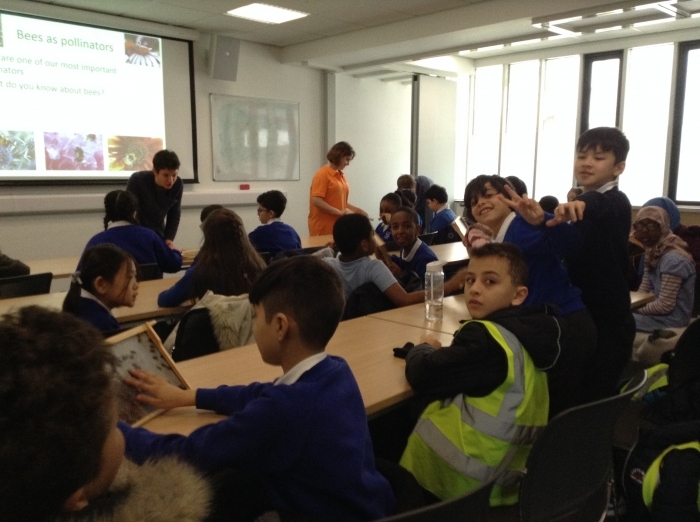 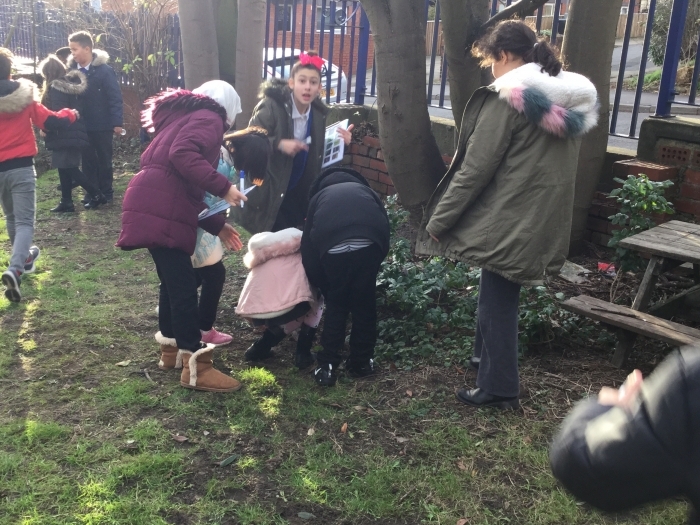 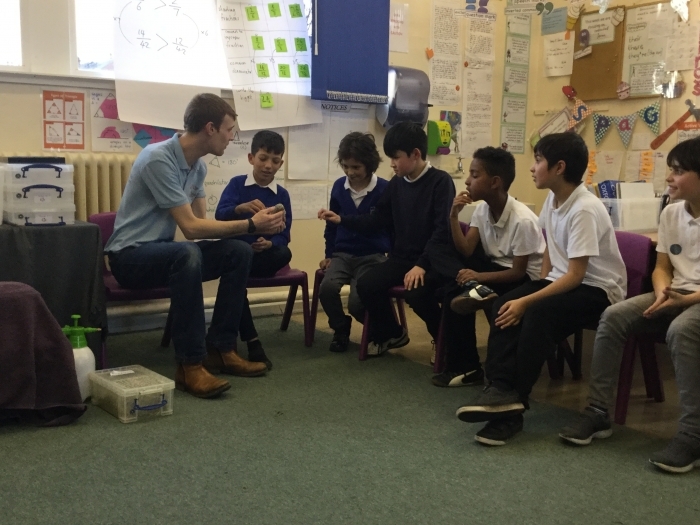 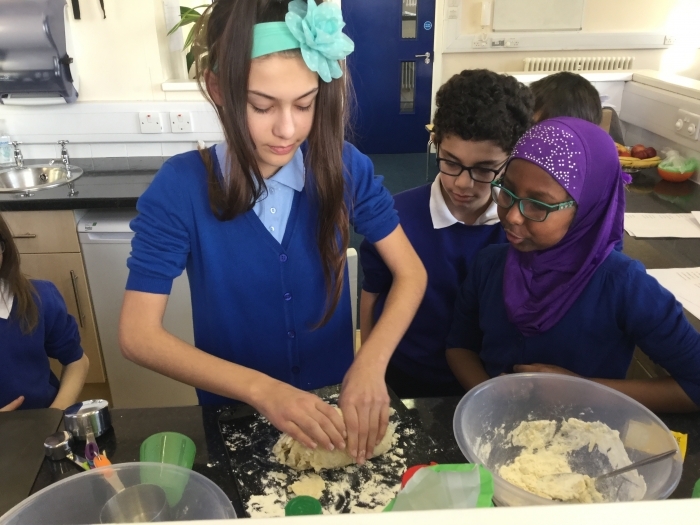 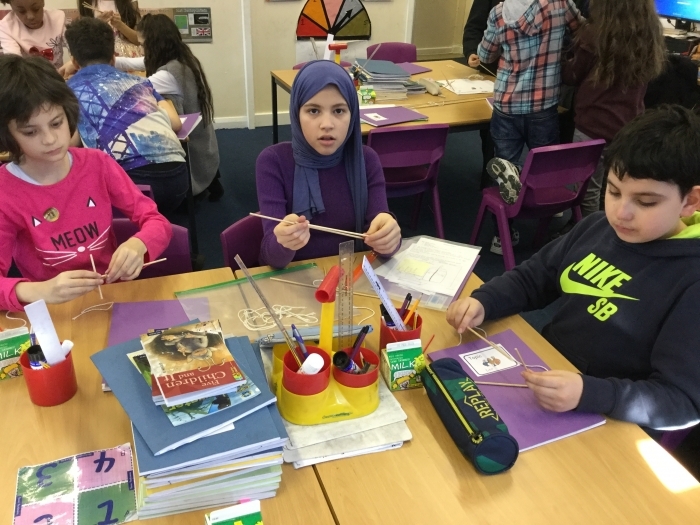 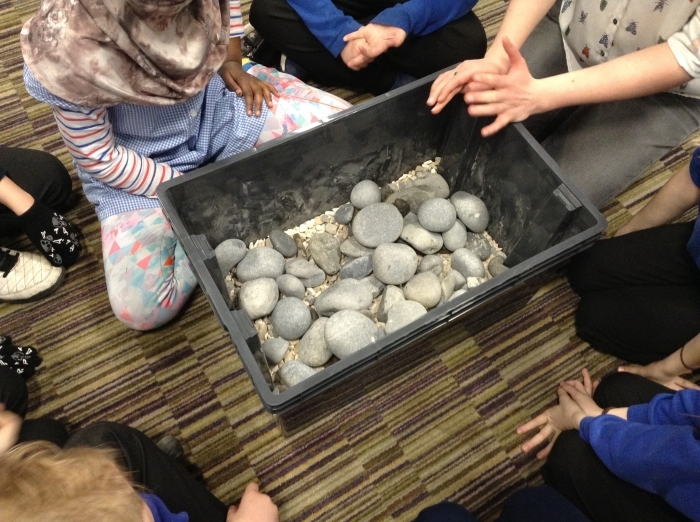 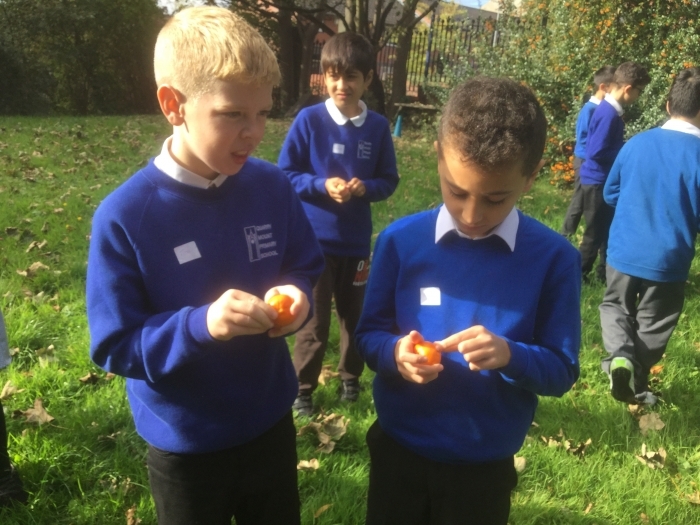 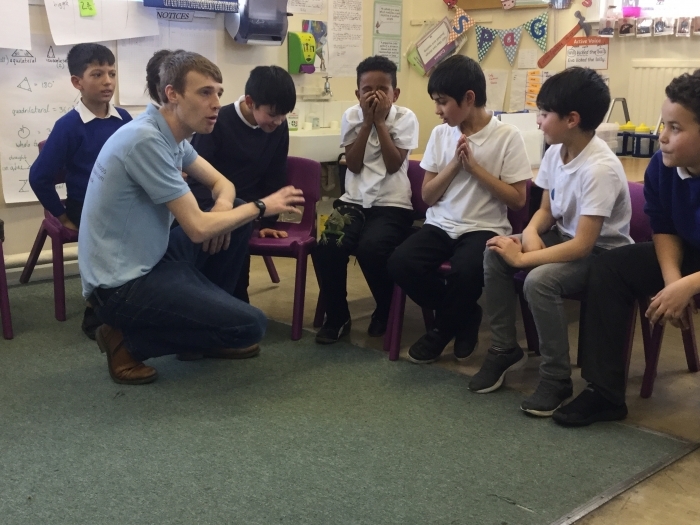 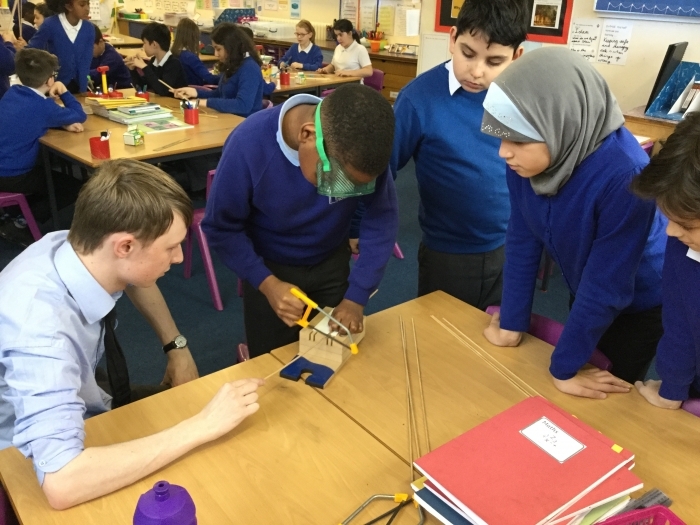 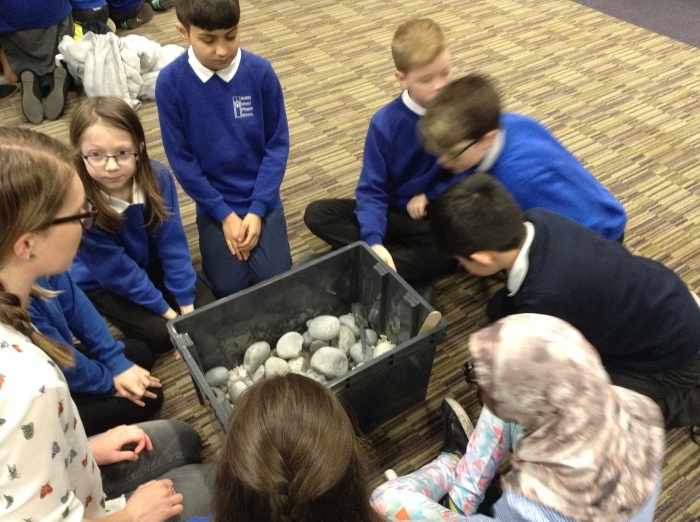 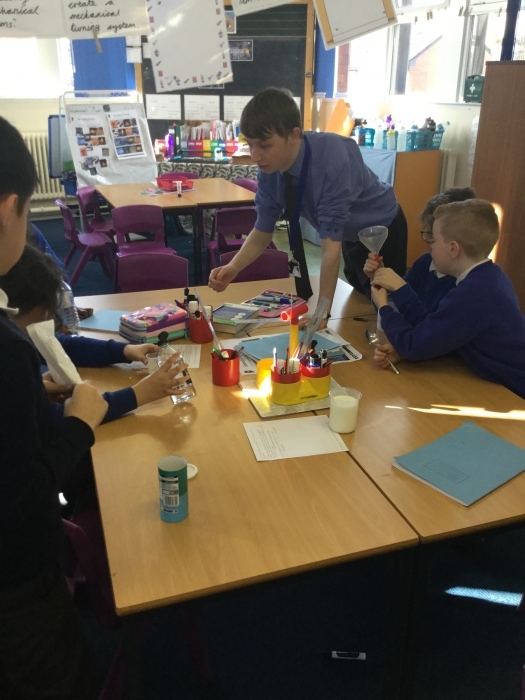 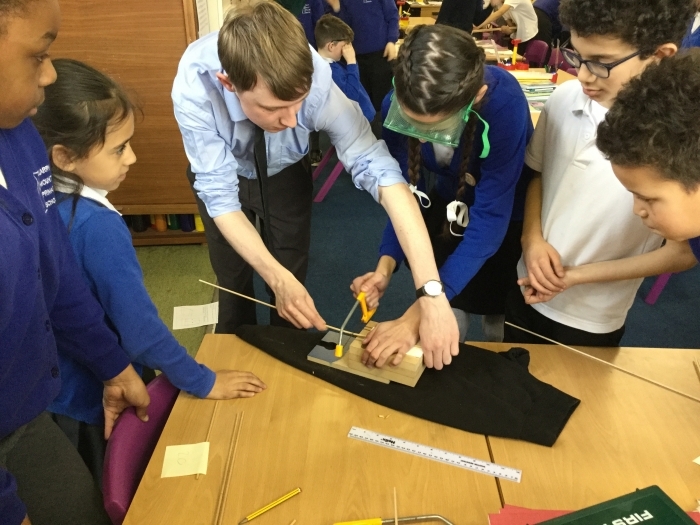 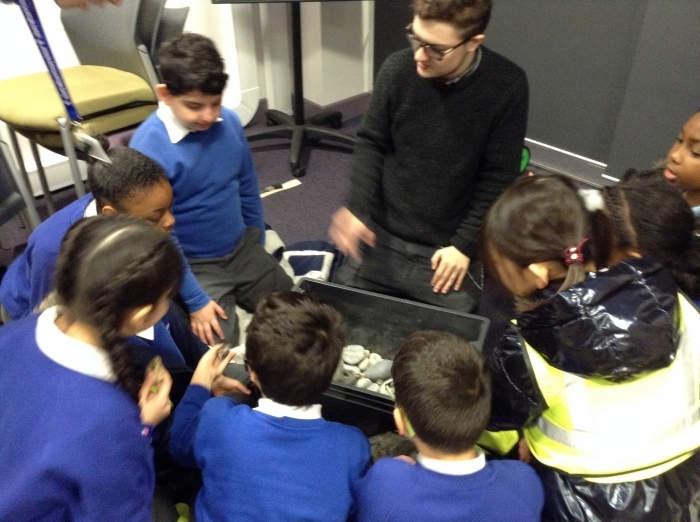 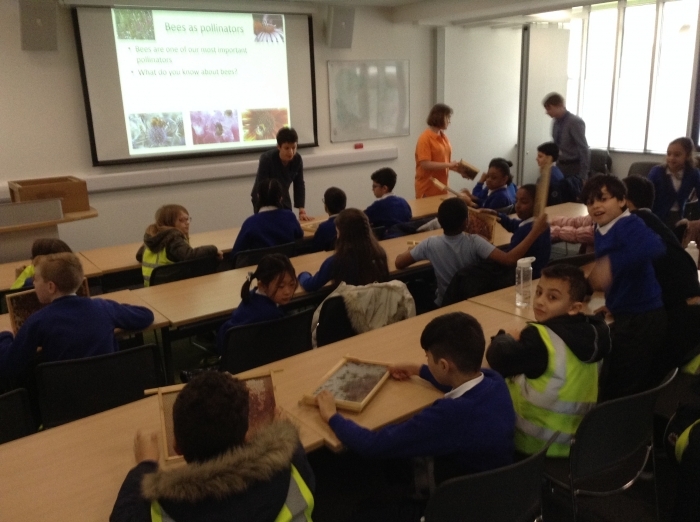 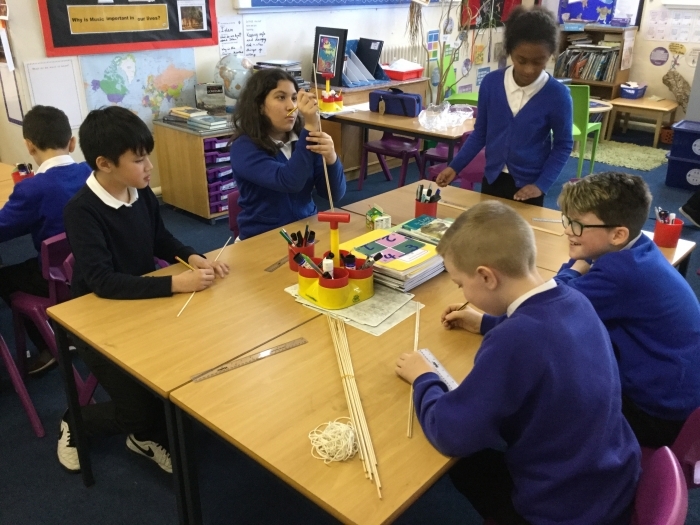 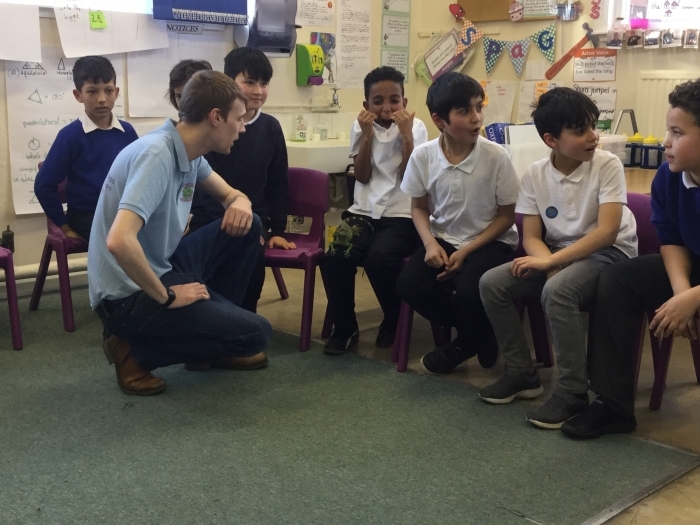 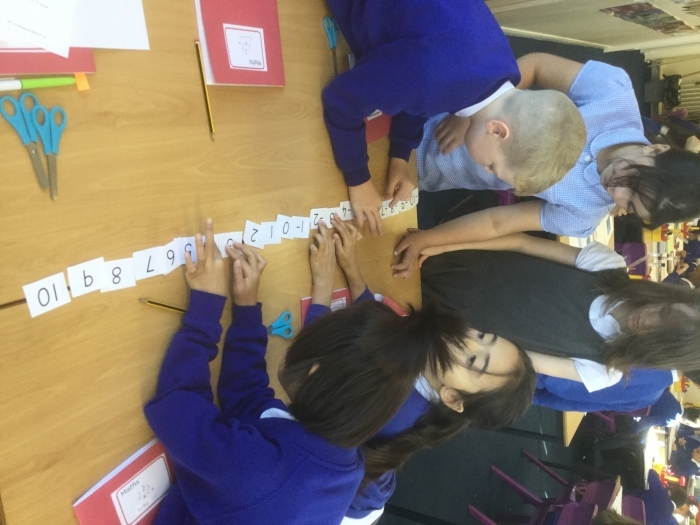 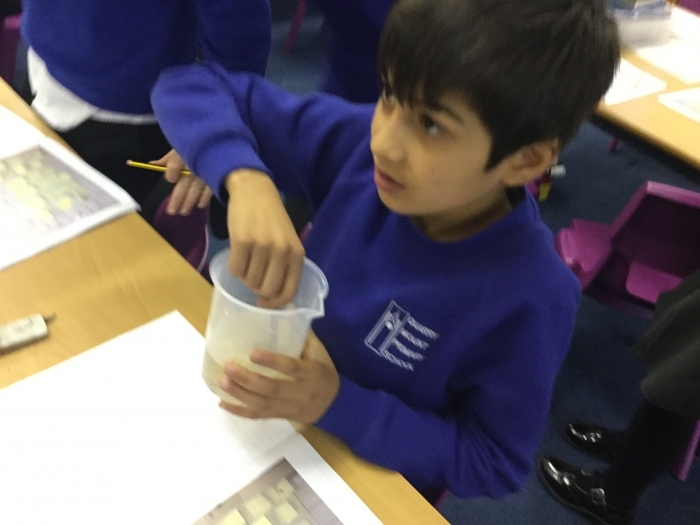 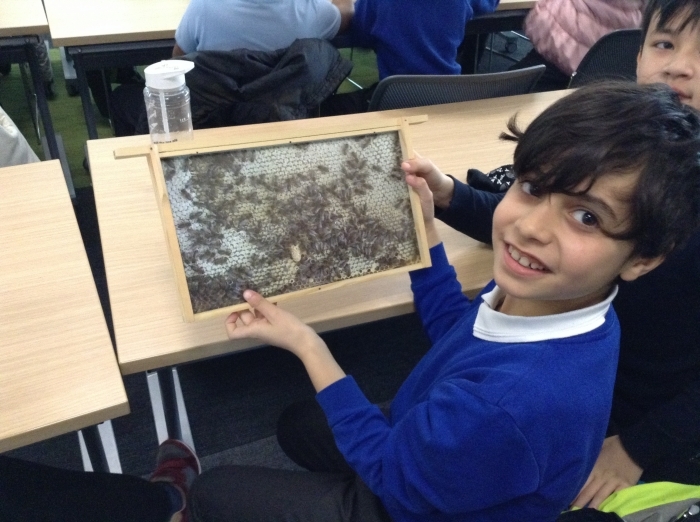 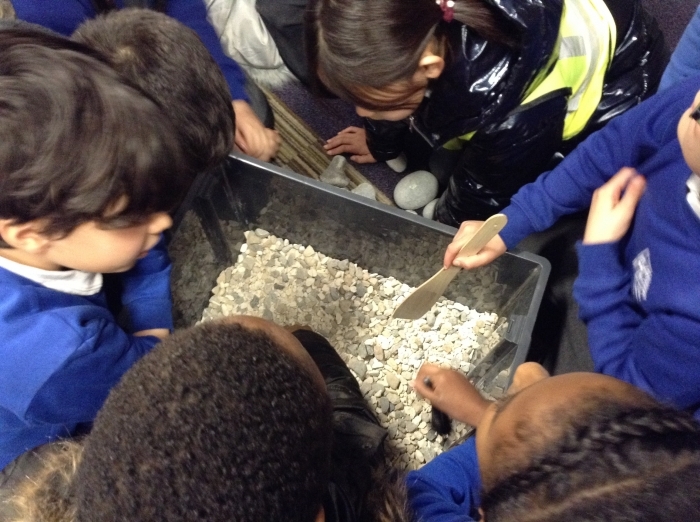 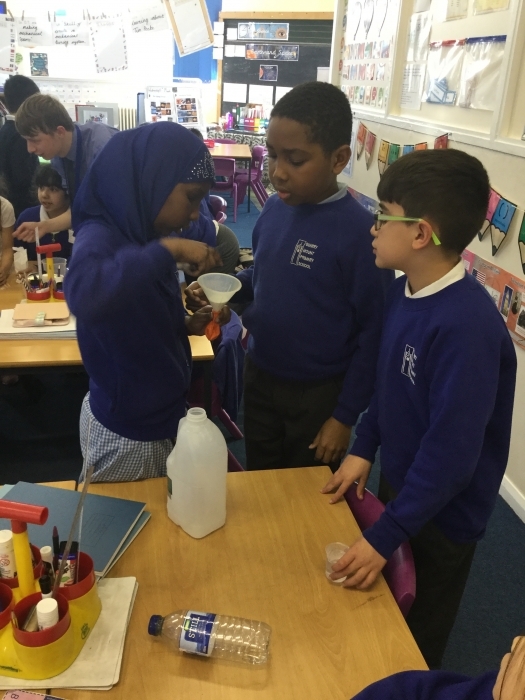 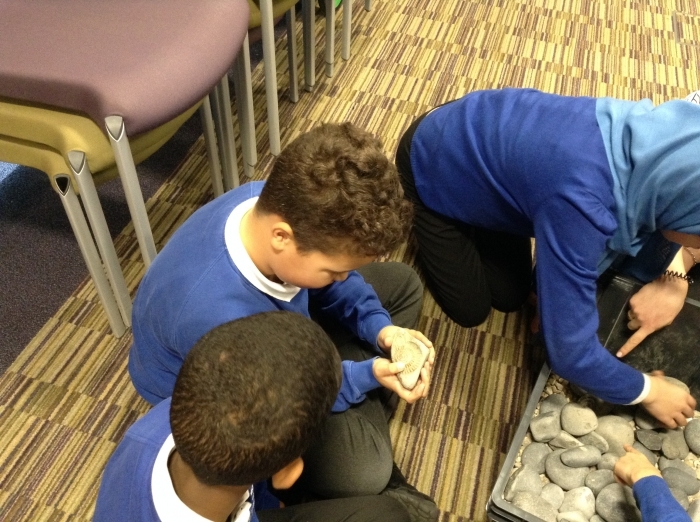 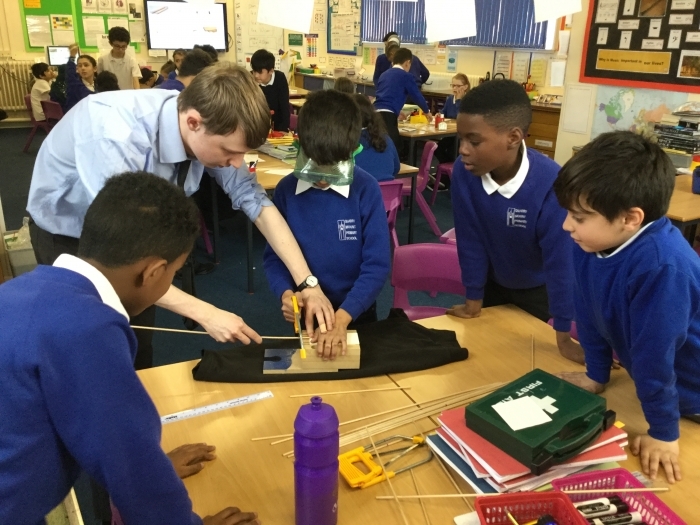 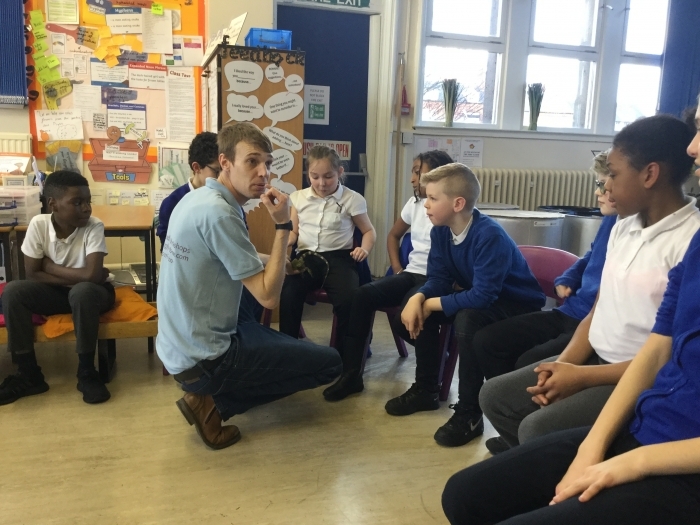 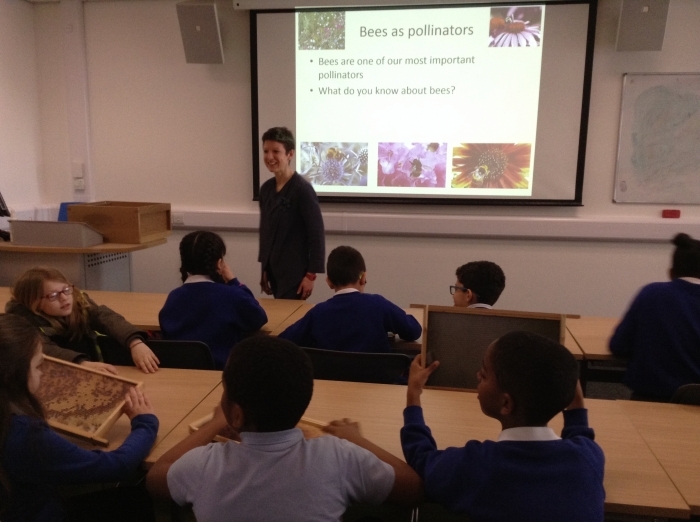 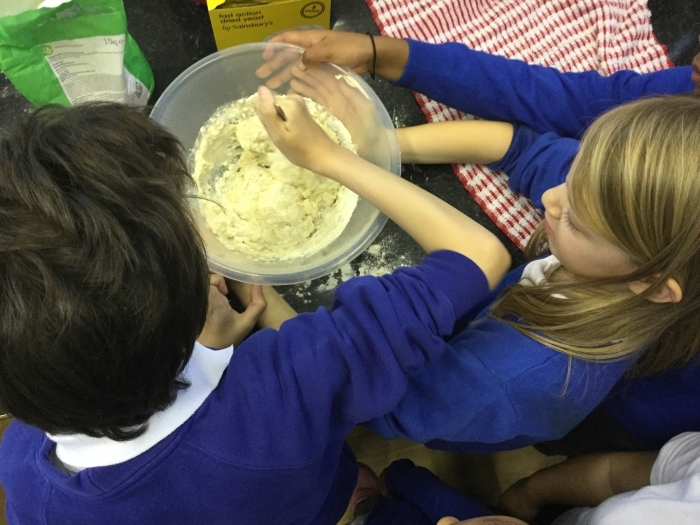 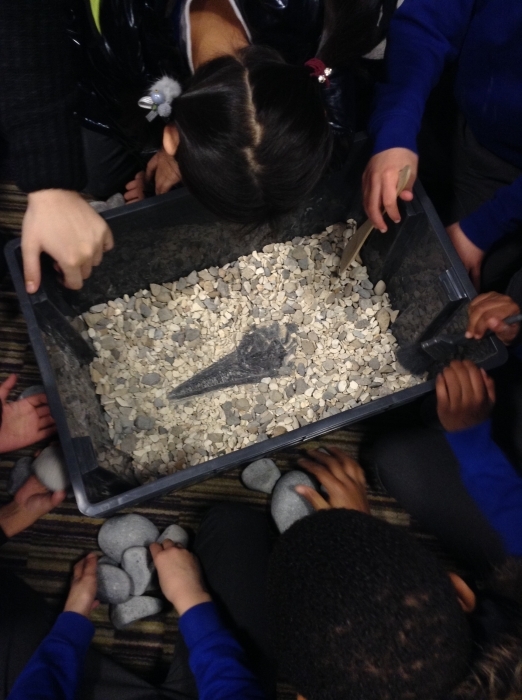 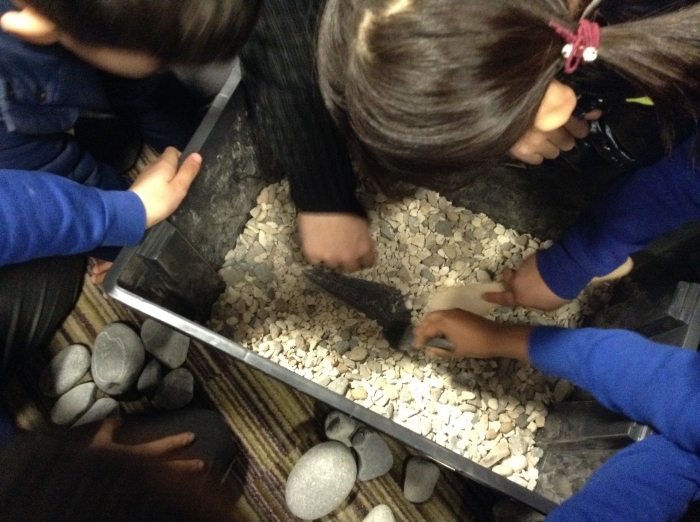 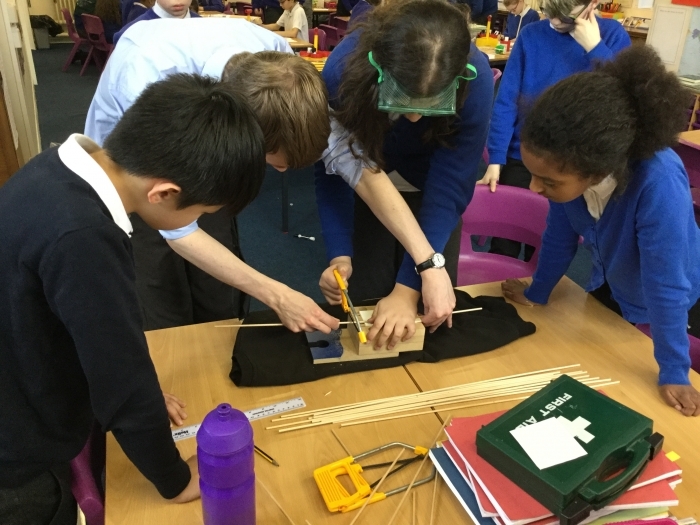 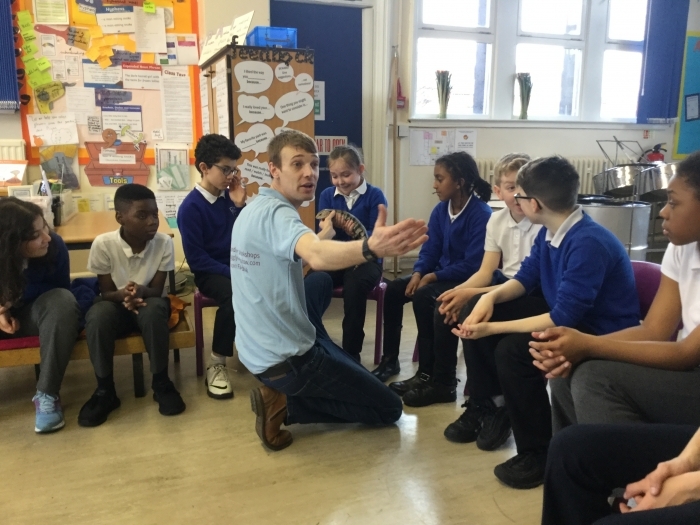 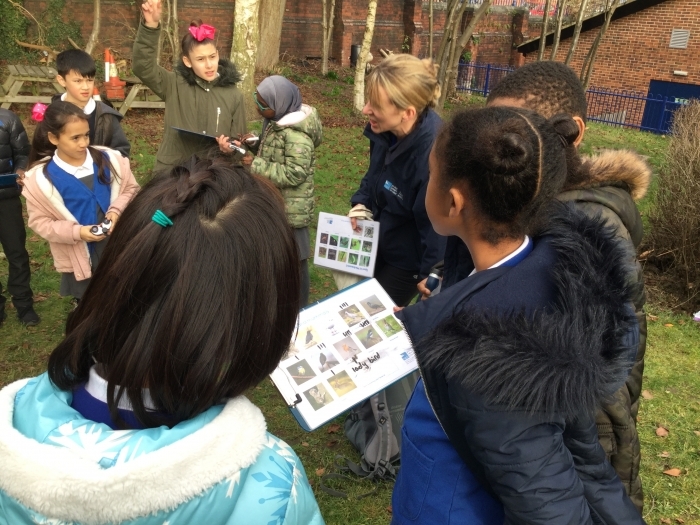 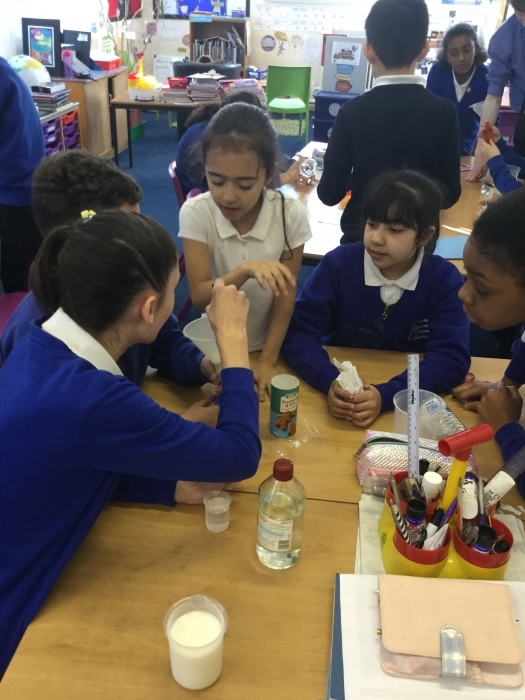 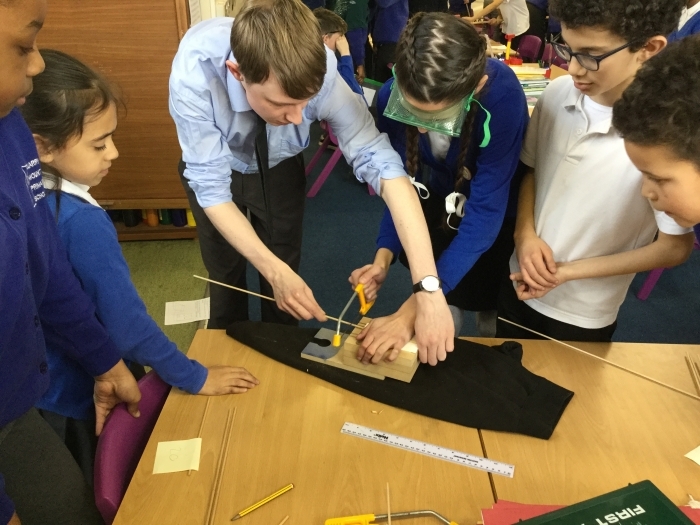 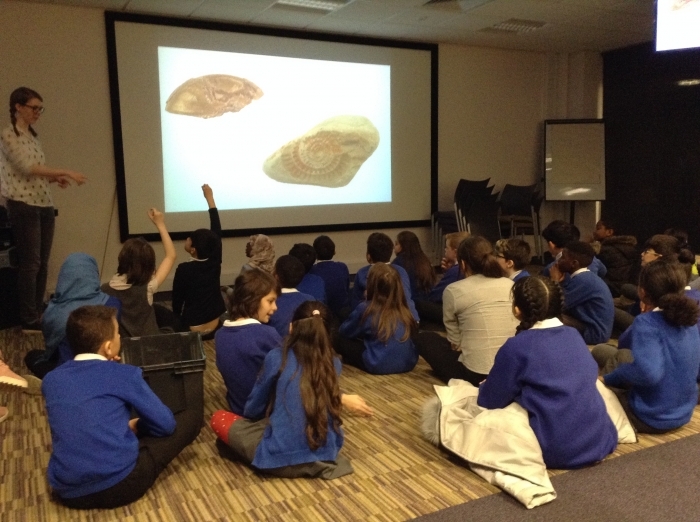 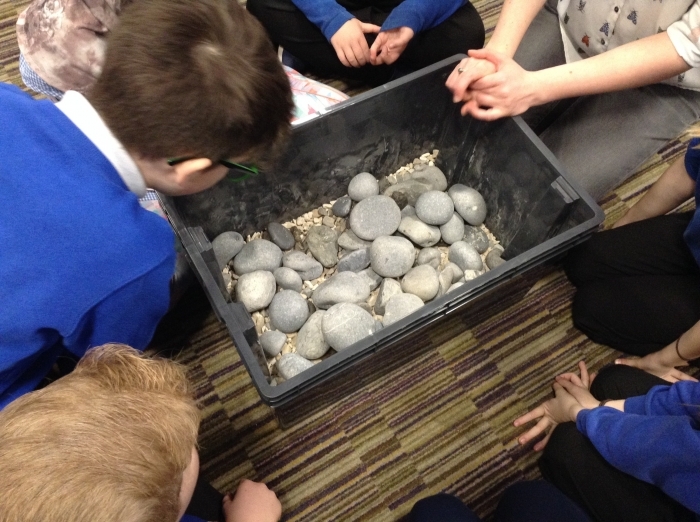 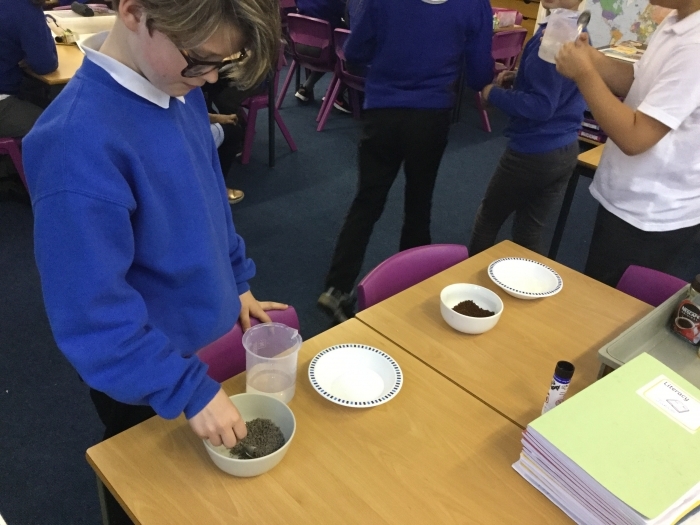 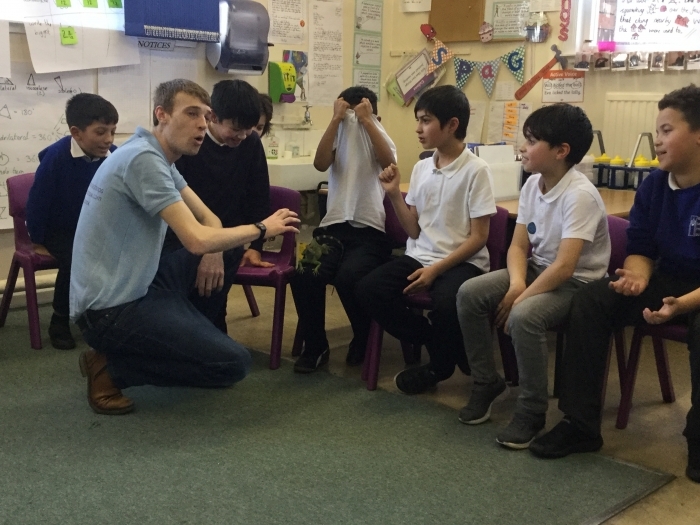 Year 5 attended the Festival of Science at the University of Leeds where they took part in a "Bee is for biodiversity" and "Fossil hunting" workshop. 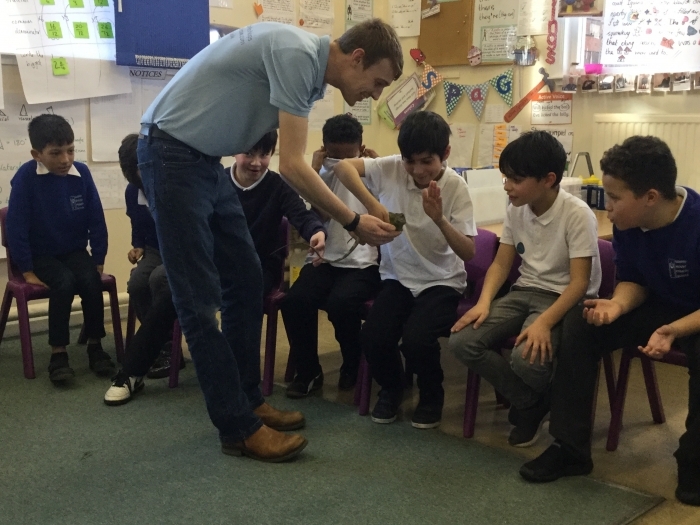 We learned lots of interesting facts, including the fact that it takes a honey bee it's entire lifetime to create less than one teaspoon of honey. 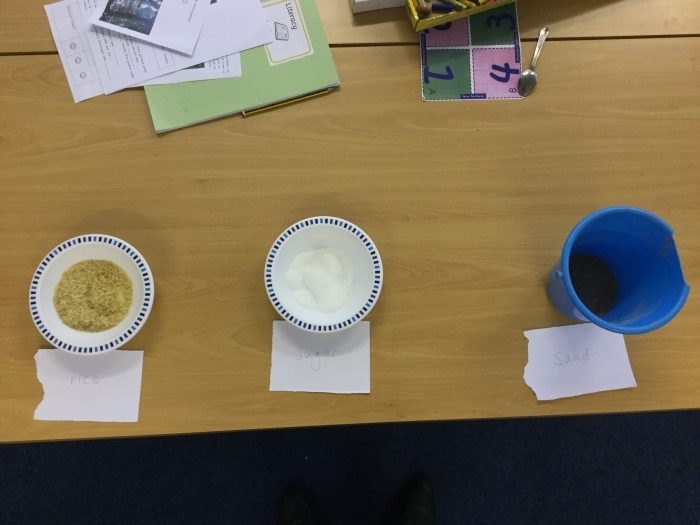 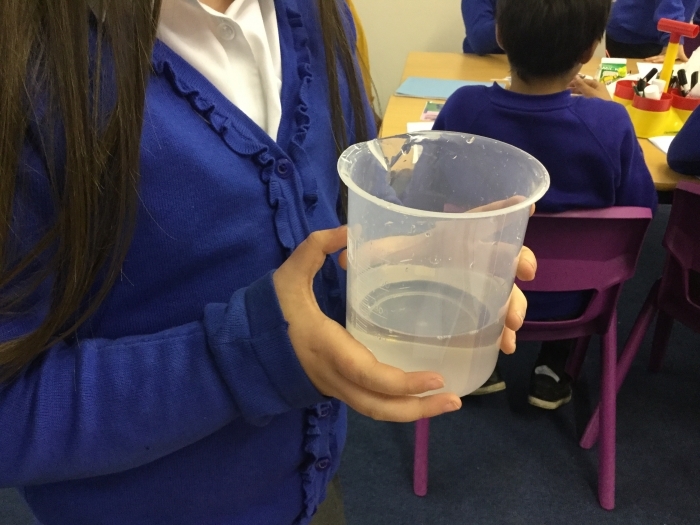 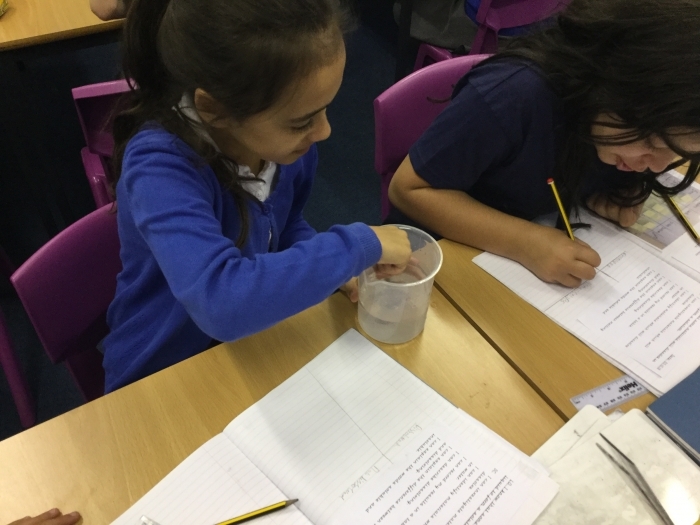 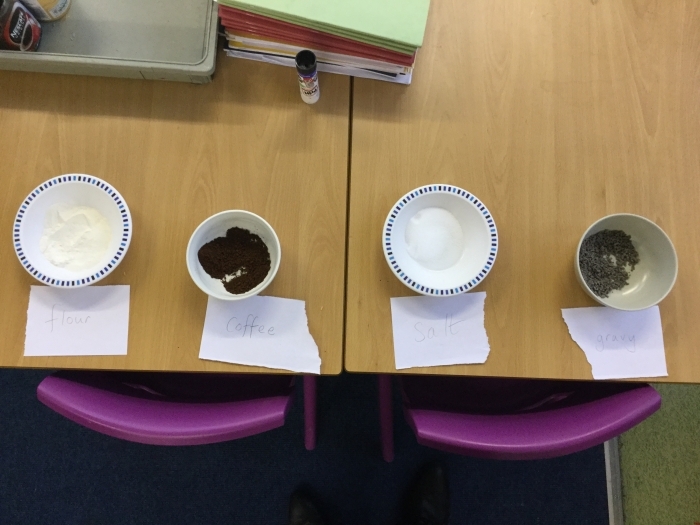 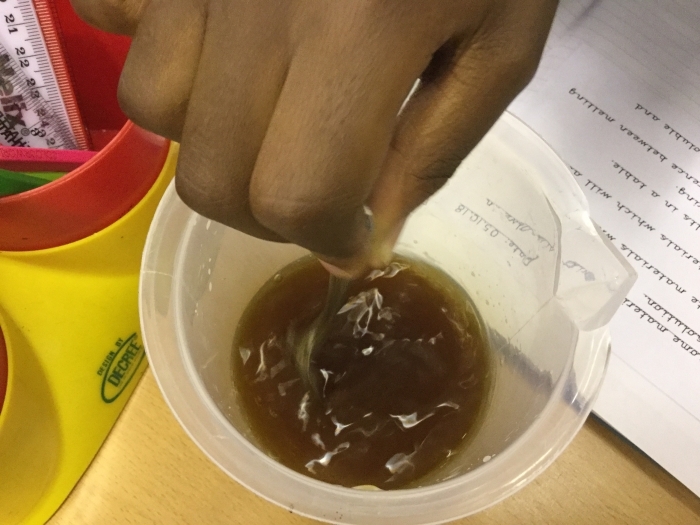 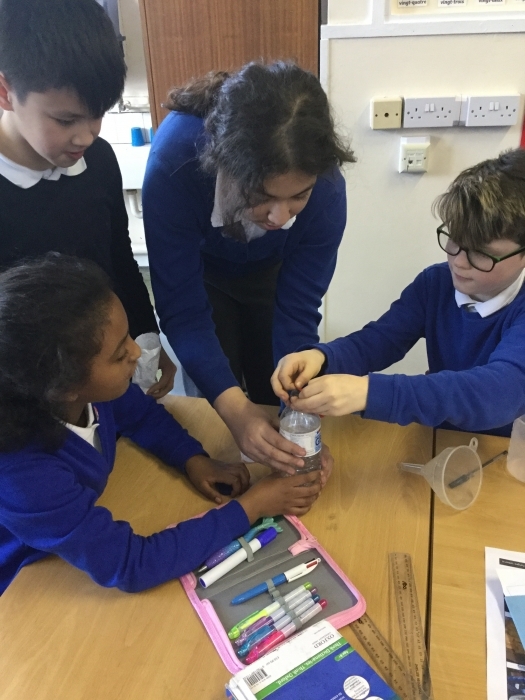 In one of our Science lessons, we conducted some experiments to see how new materials were created. 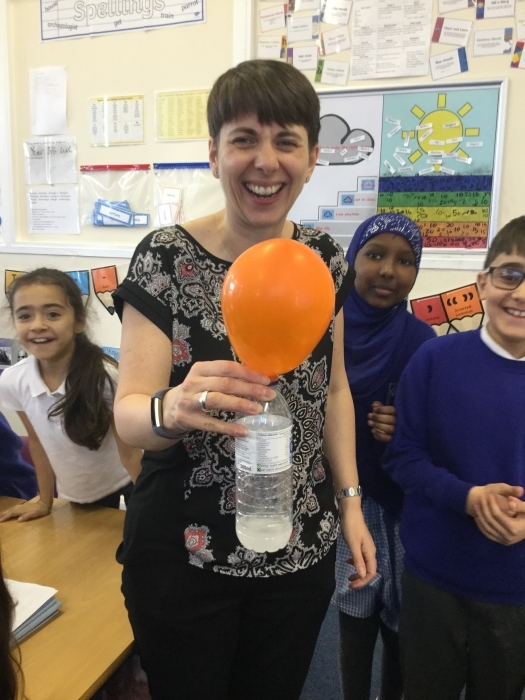 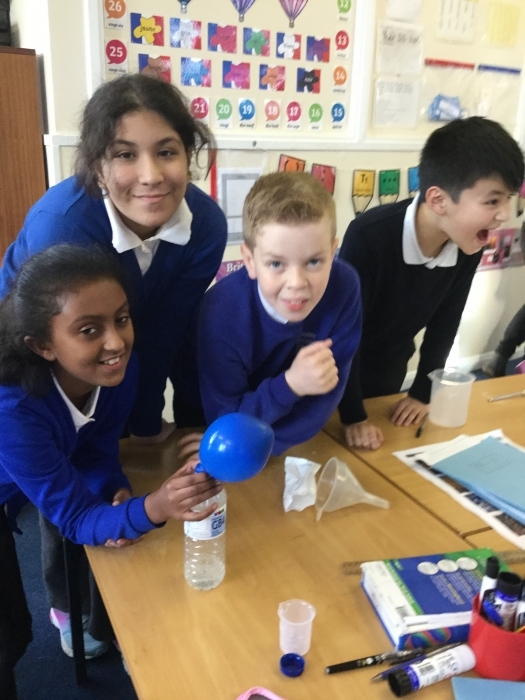 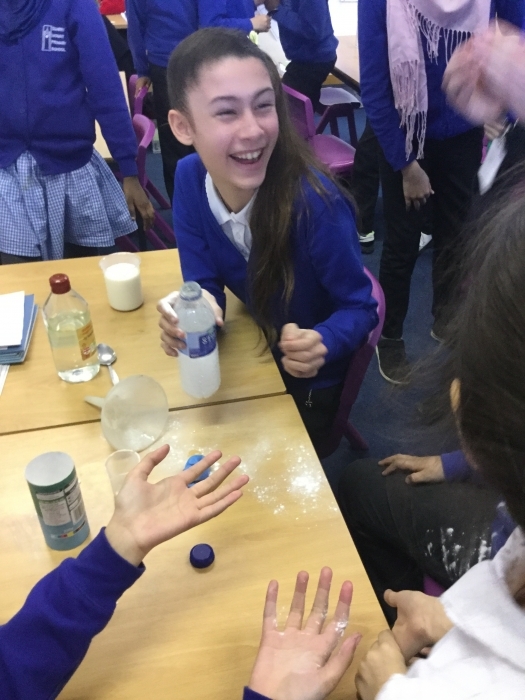 We discovered that warm milk and bicarbonate of soda create a new type of plastic, while bicarbonate of soda and vinegar produce carbon dioxide... enough to inflate a balloon! 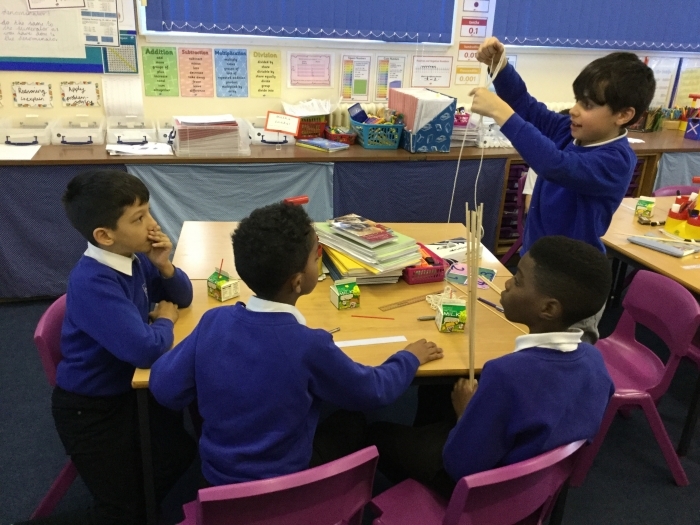 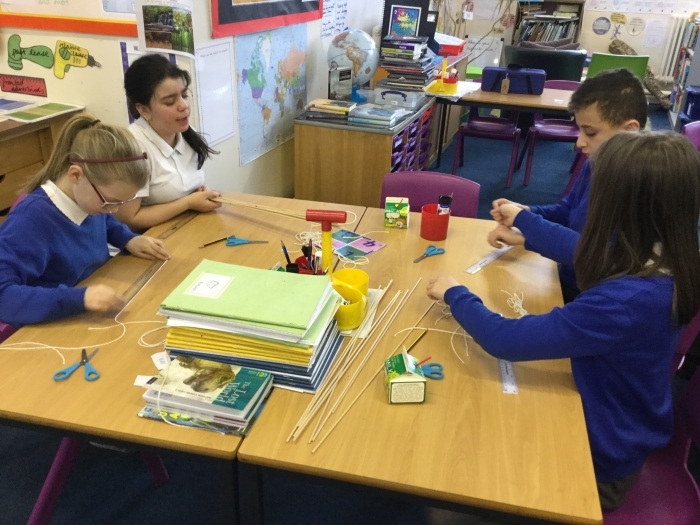 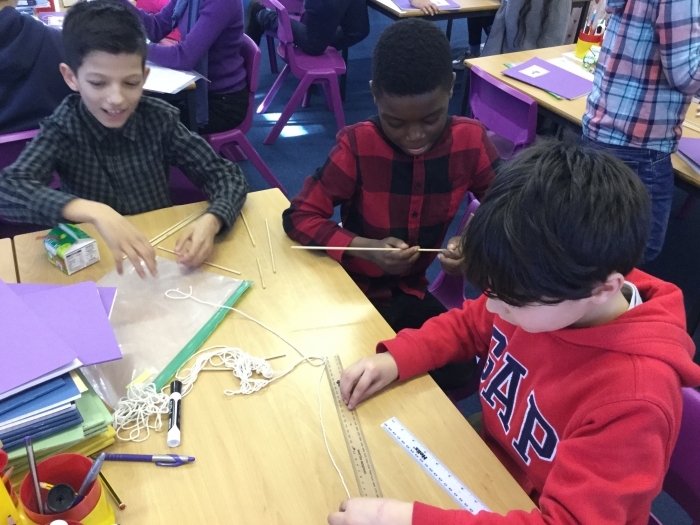 As part of our Design & Technology work, we had to use dowel and string to create wardrobes in small groups. 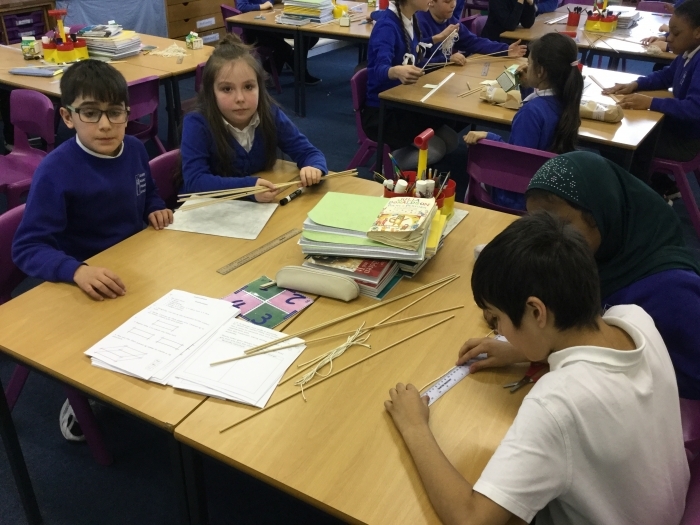 This involved: measuring dowel and string, sawing the wood to the appropriate length and fixing each piece of dowel together with a special tying method. 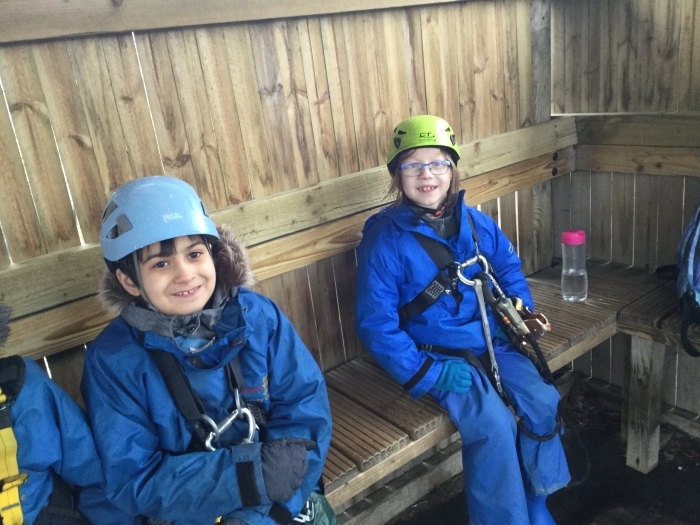 We found it difficult but enjoyable! 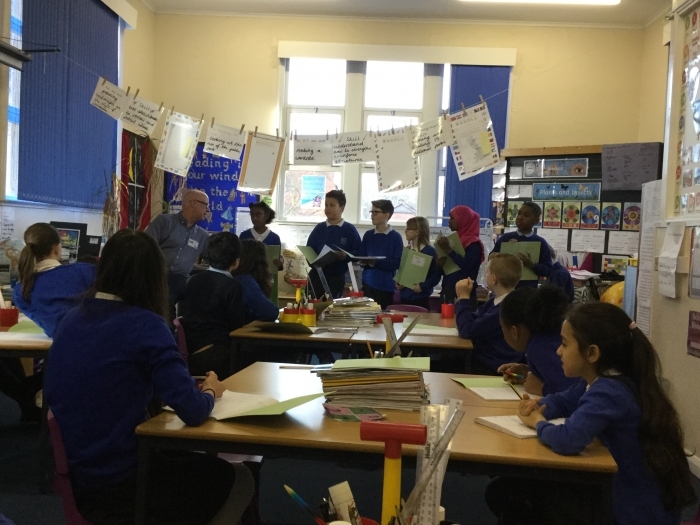 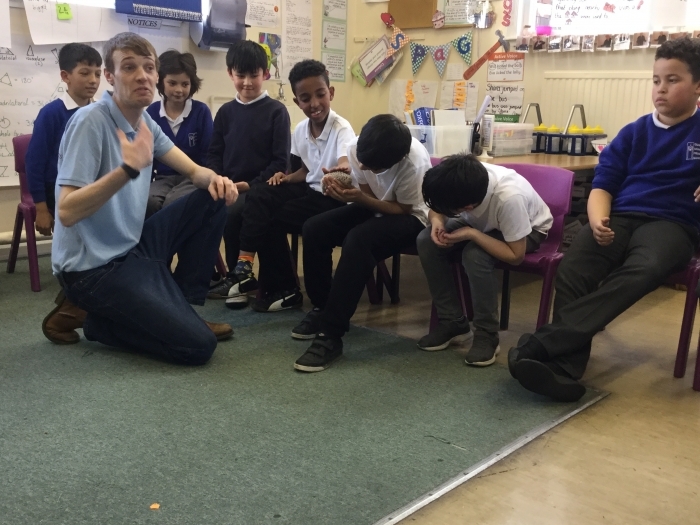 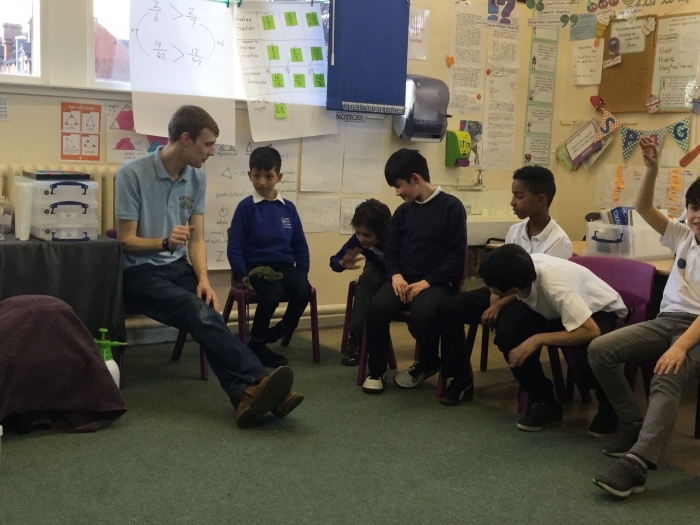 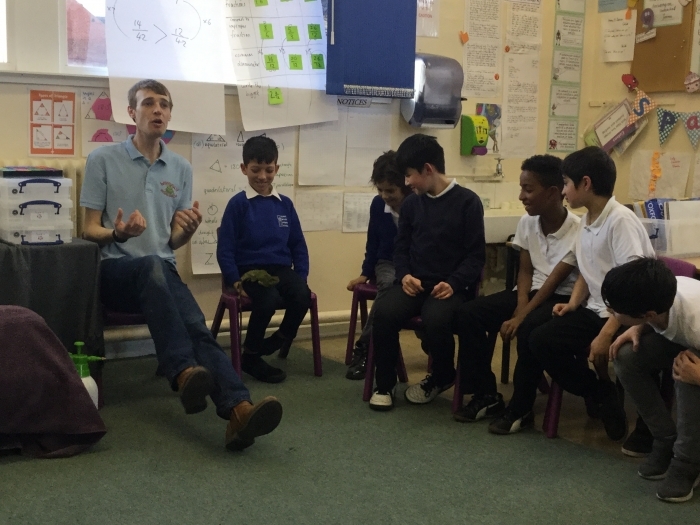 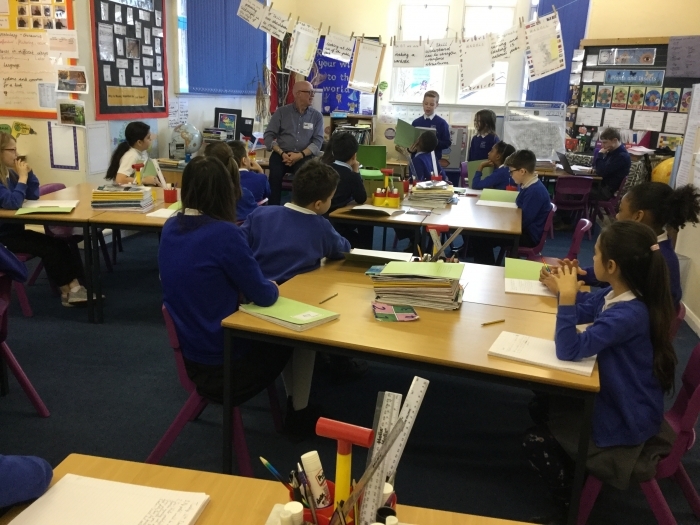 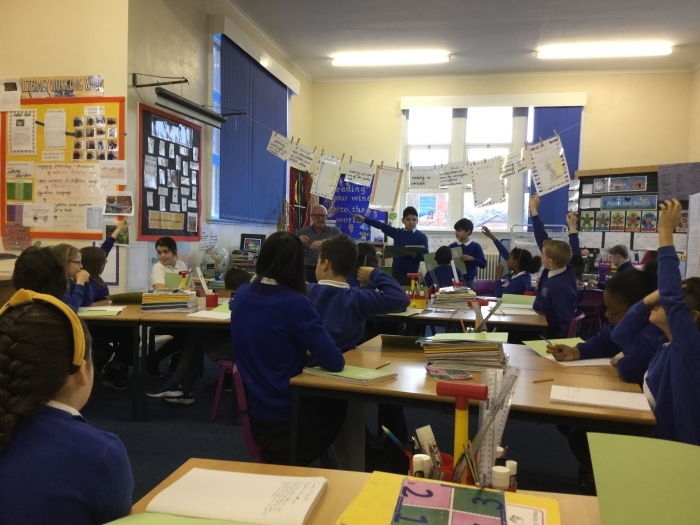 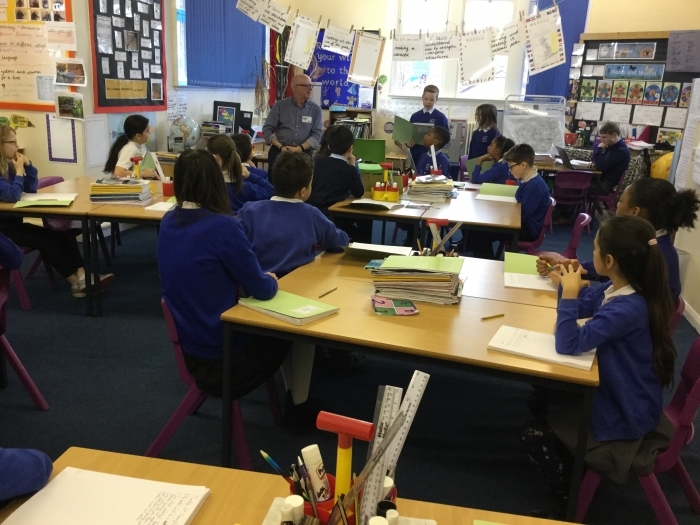 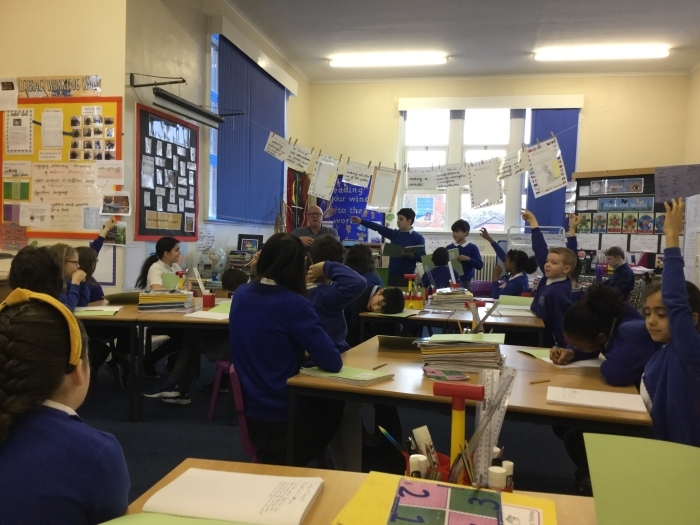 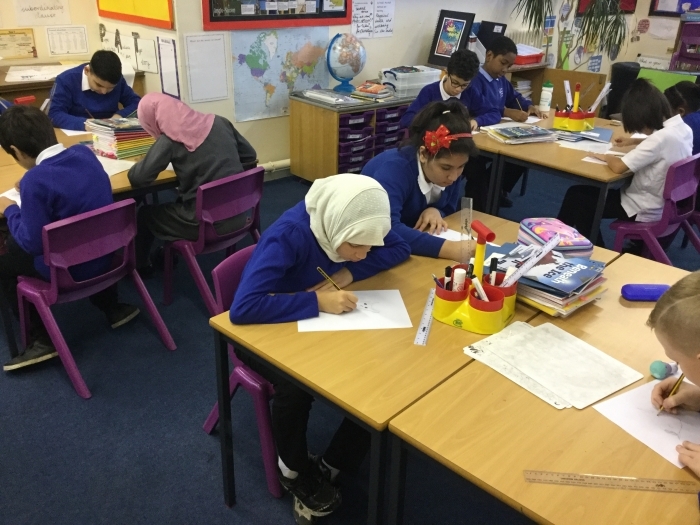 Year 5 worked with the poet James Nash to create some poetry of their own. 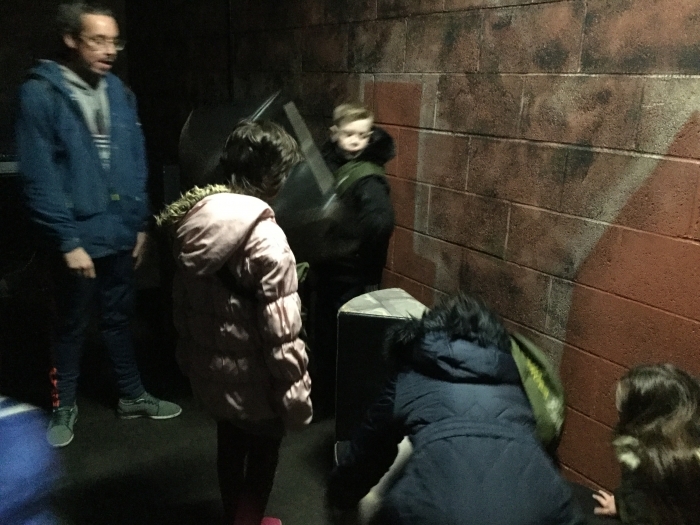 They used the idea of the wardrobe in 'The Lion, The Witch and The Wardrobe' as inspiration for the idea of "a portal" to another world. 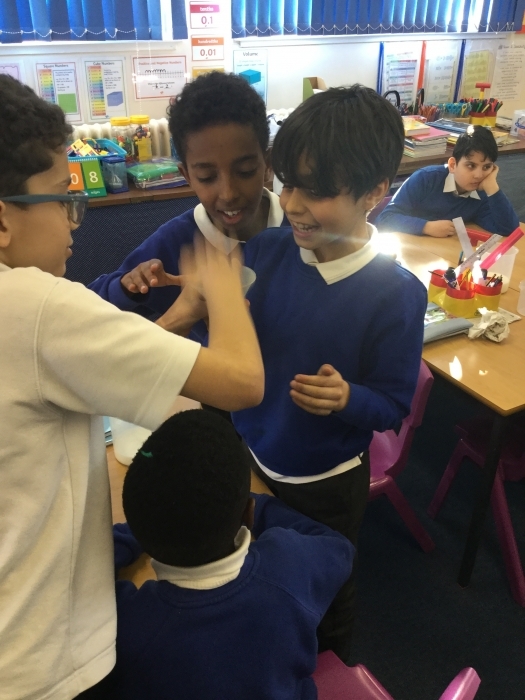 We had some fantastic ideas, including: magical glasses that transported you to other lands, globes that span you to other planets and paintings that sucked you into other dimensions. 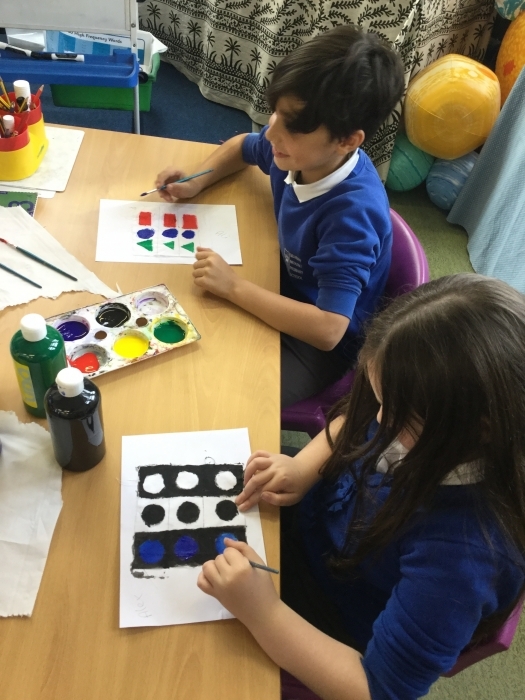 We loved being creative! 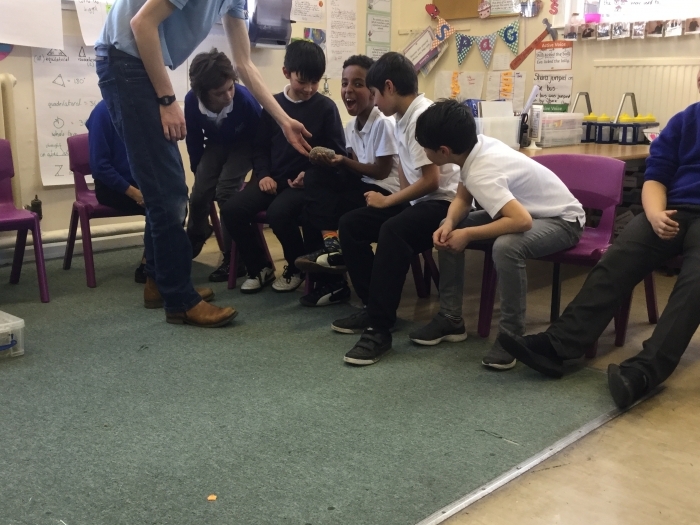 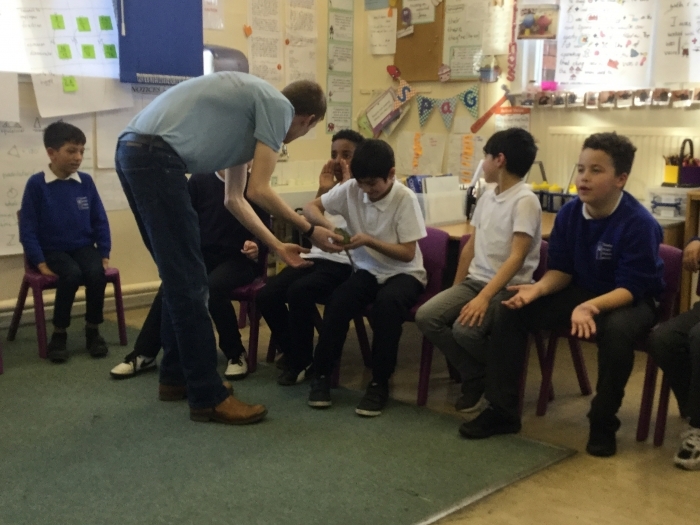 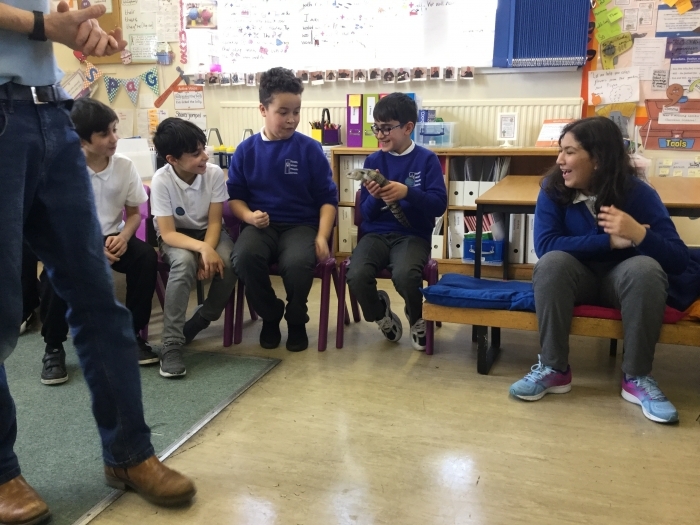 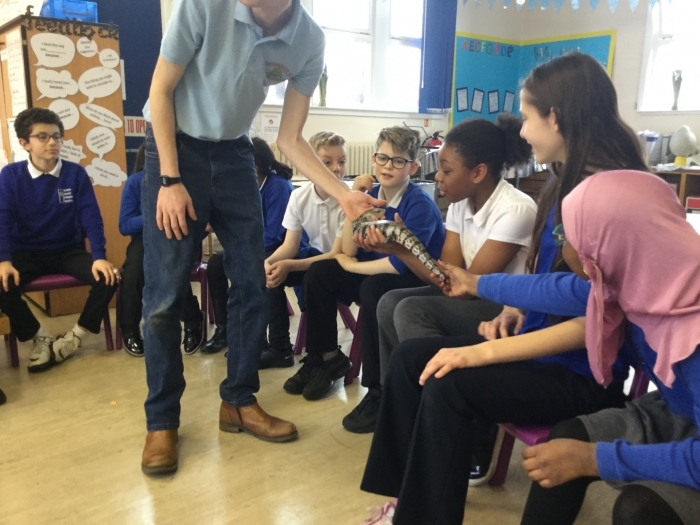 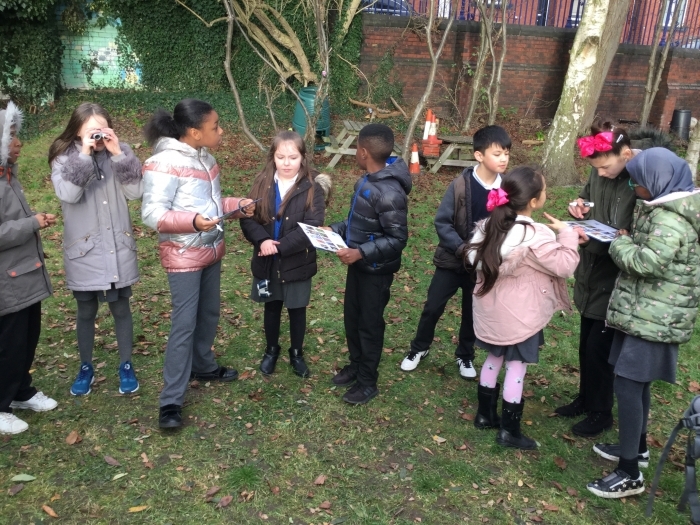 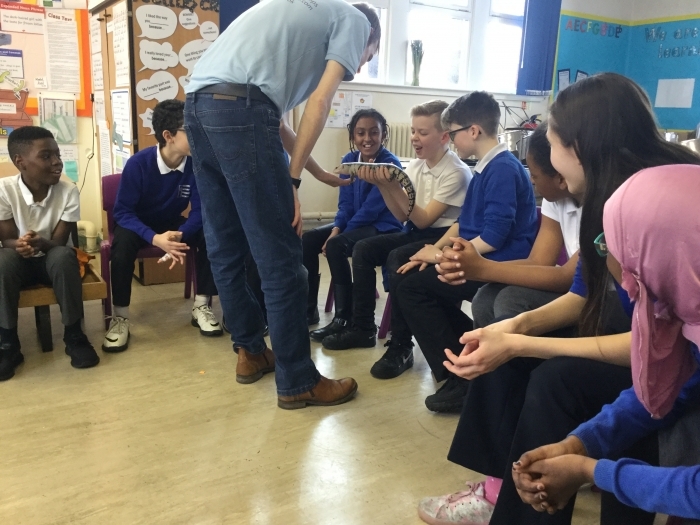 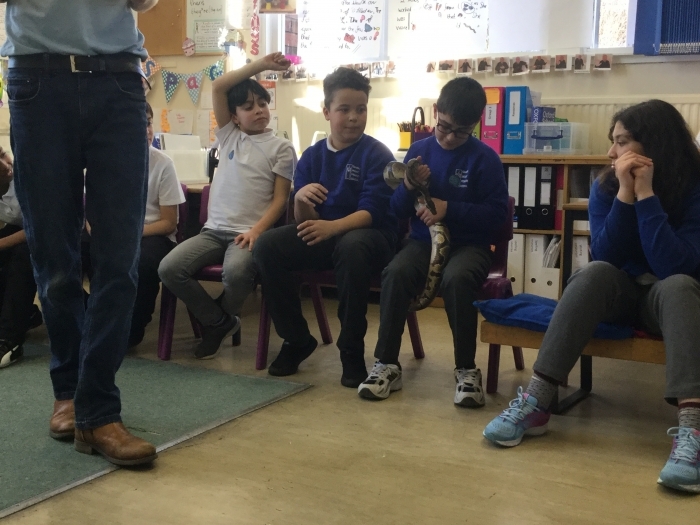 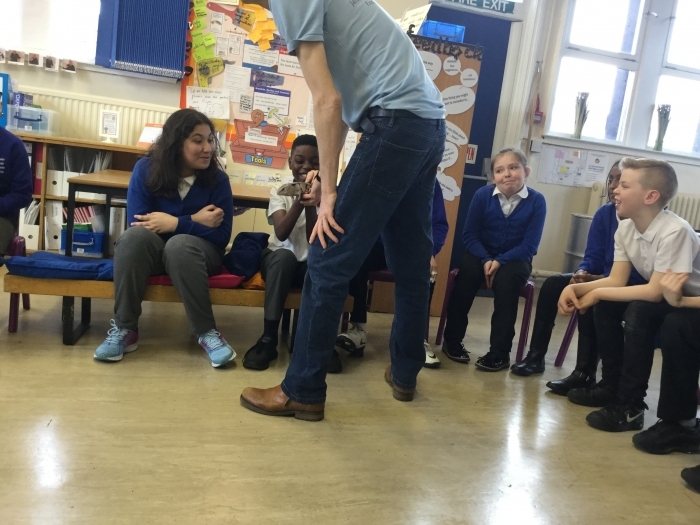 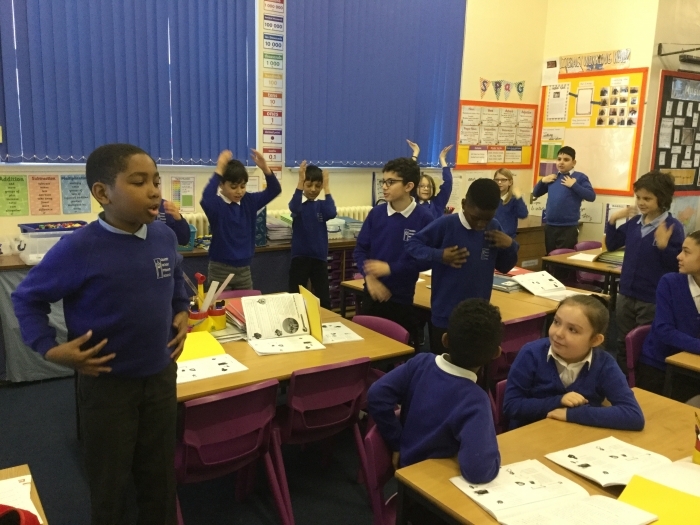 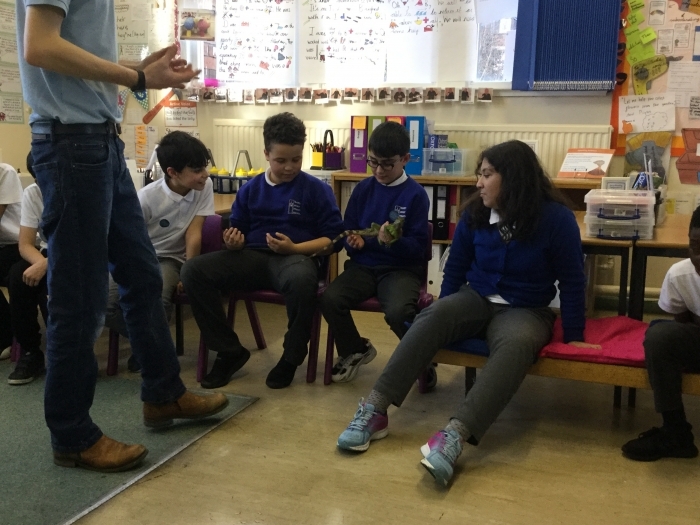 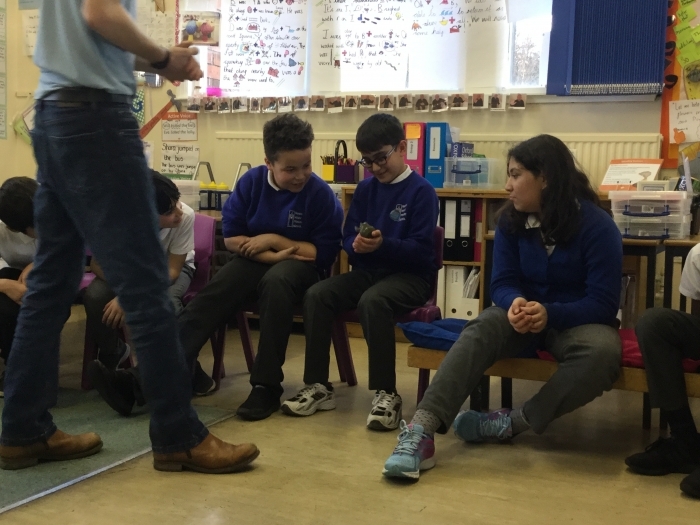 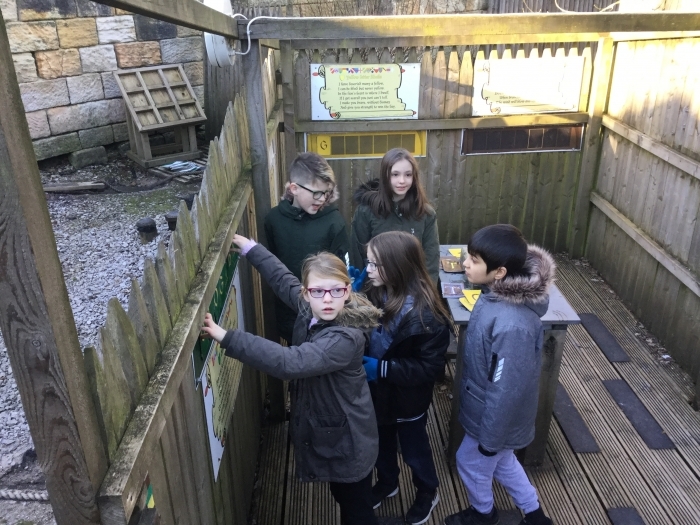 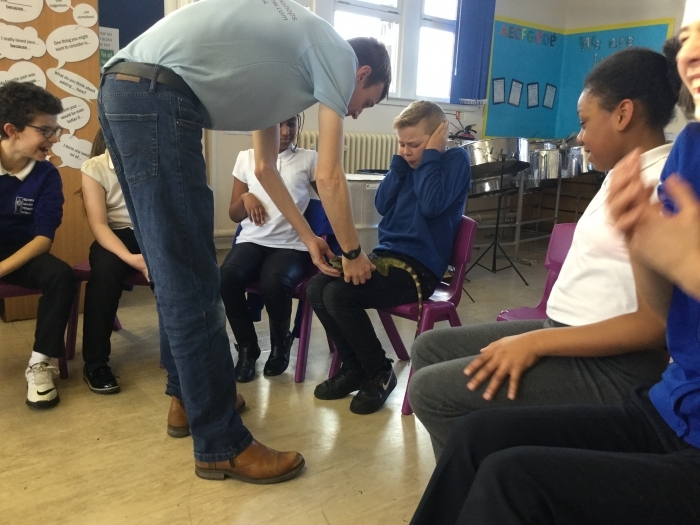 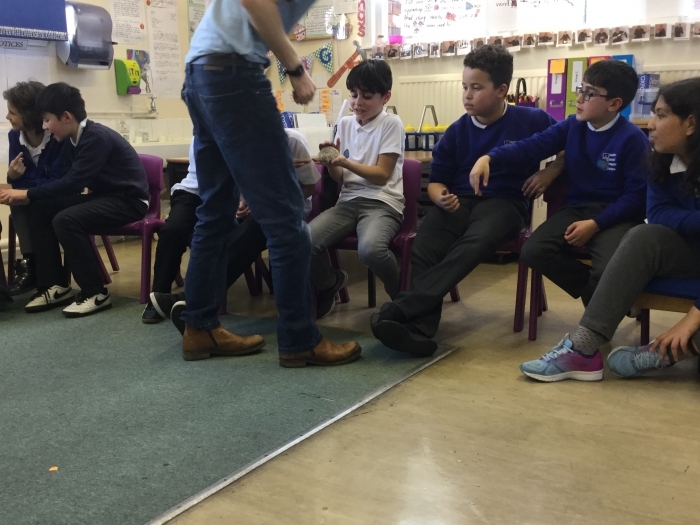 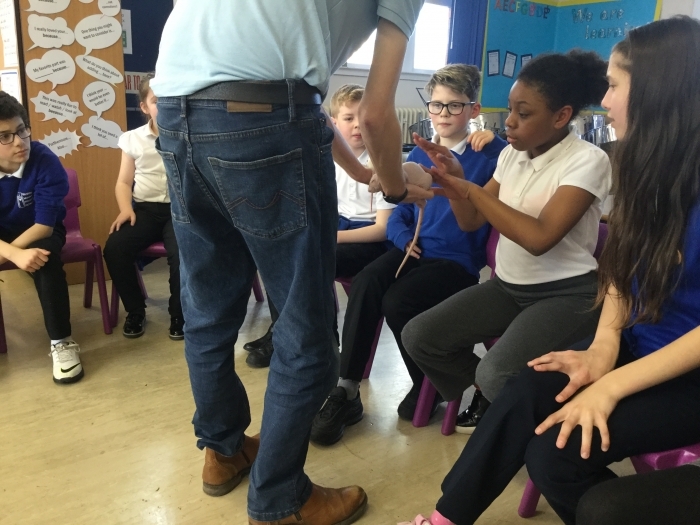 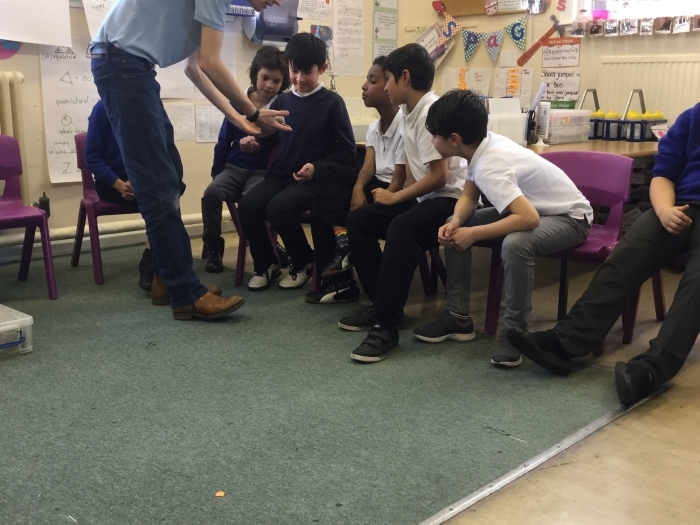 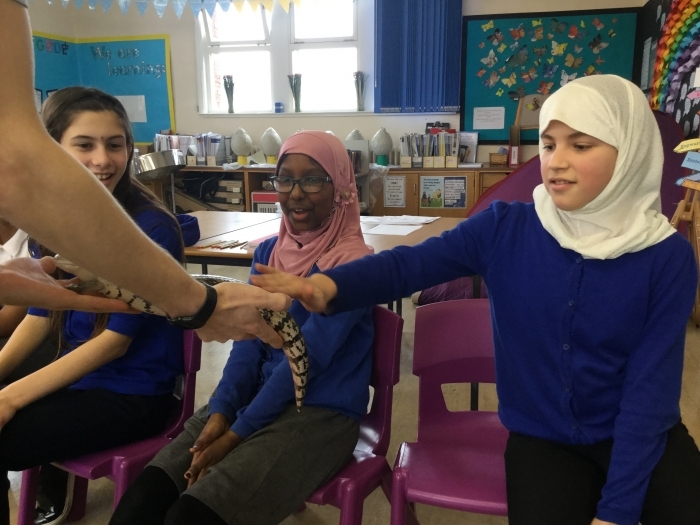 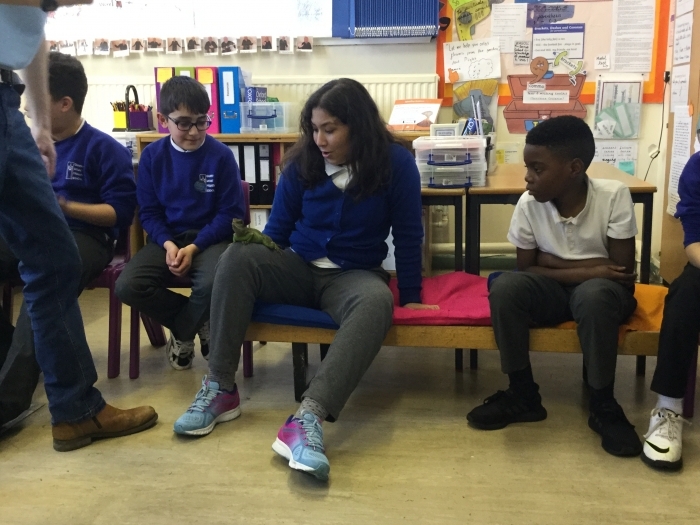 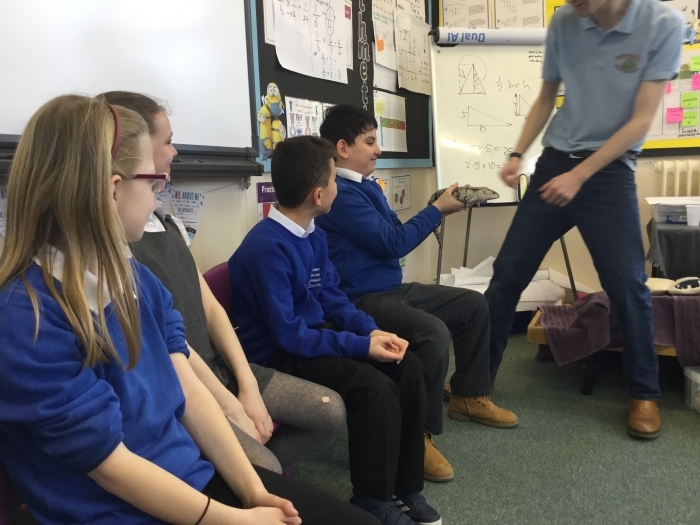 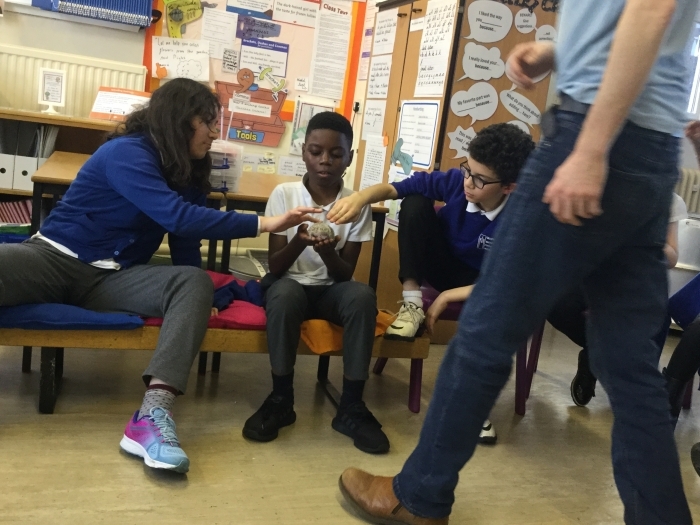 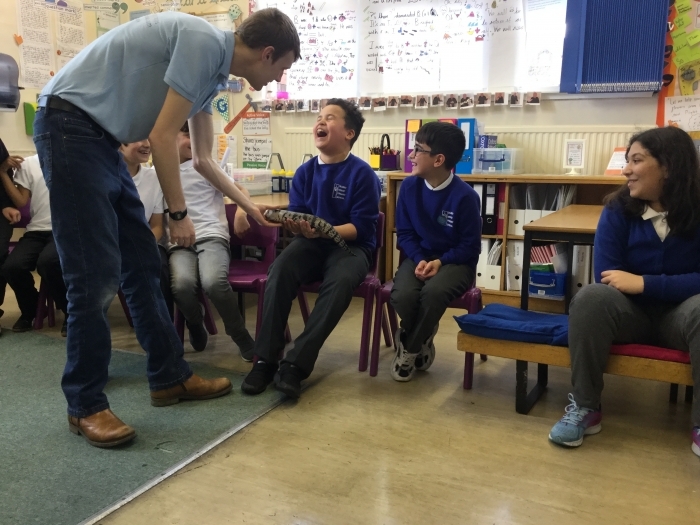 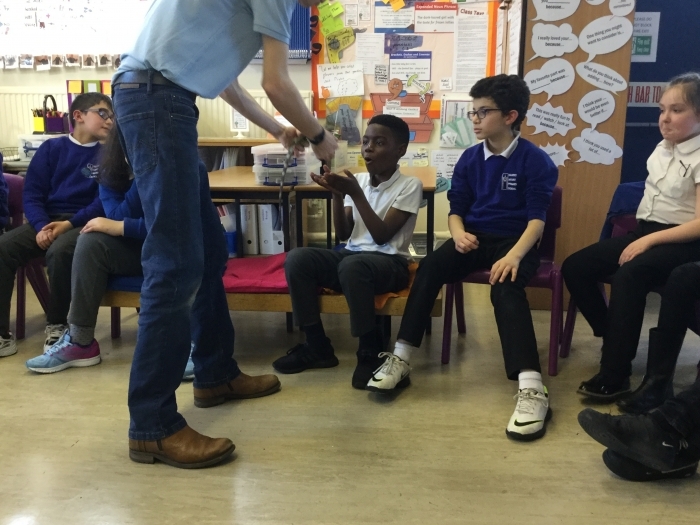 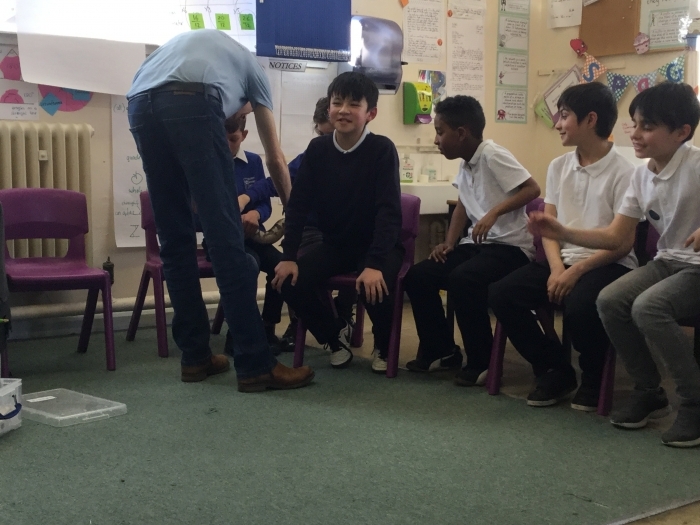 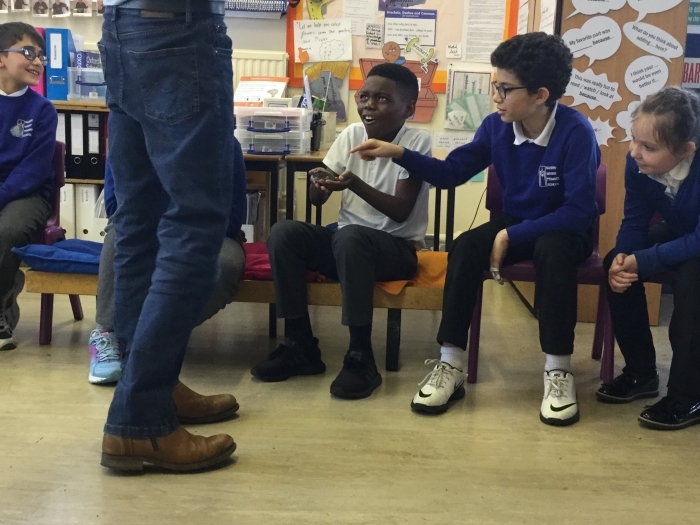 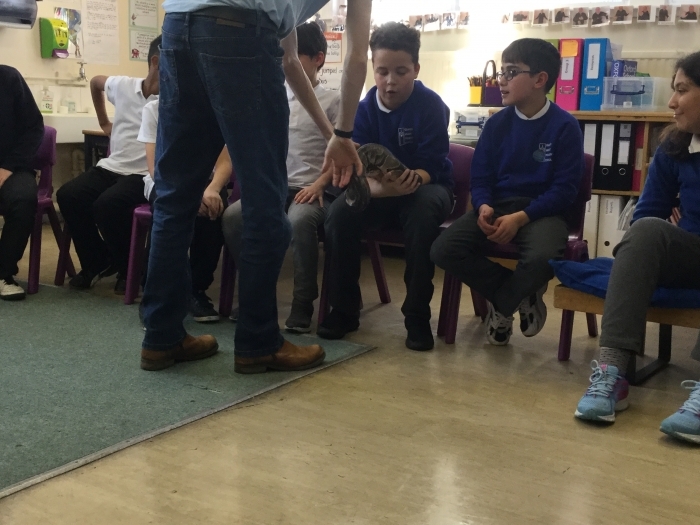 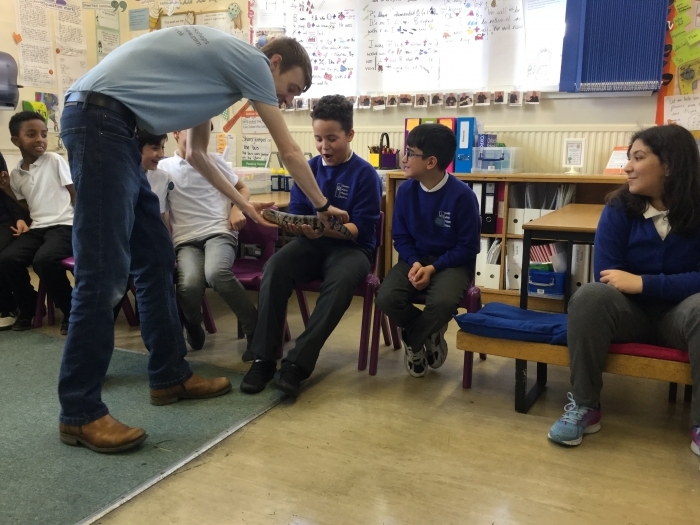 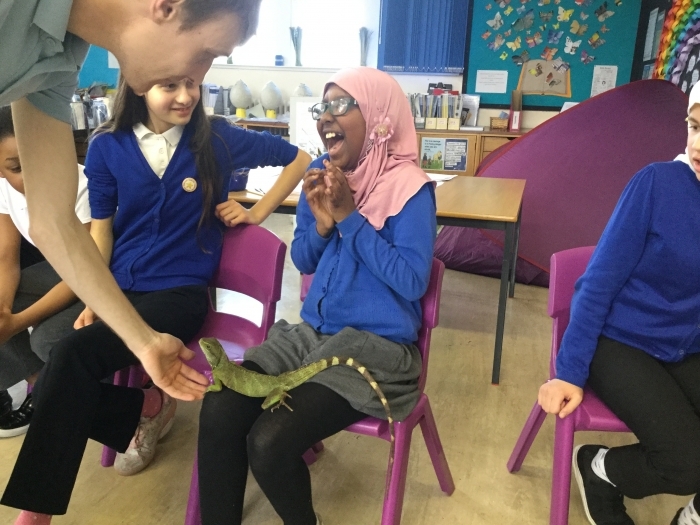 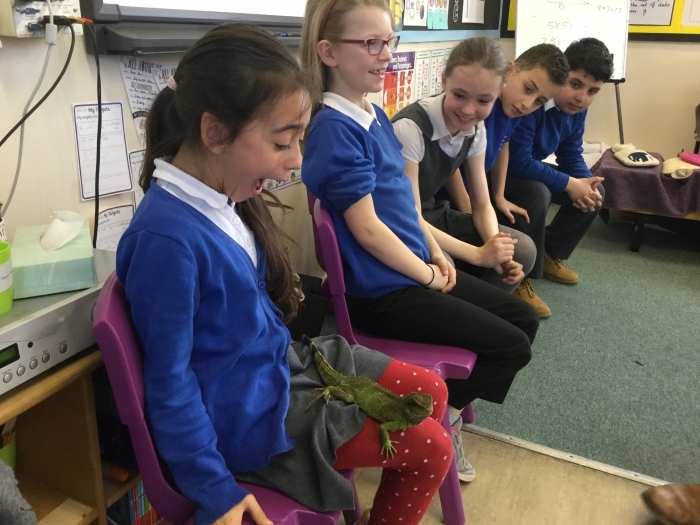 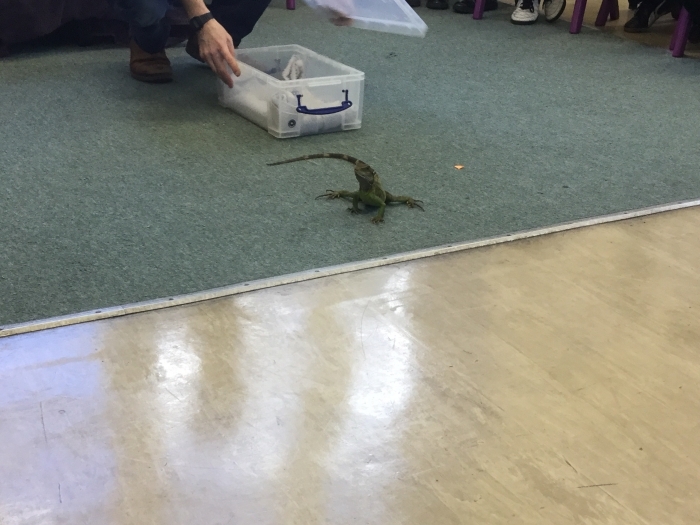 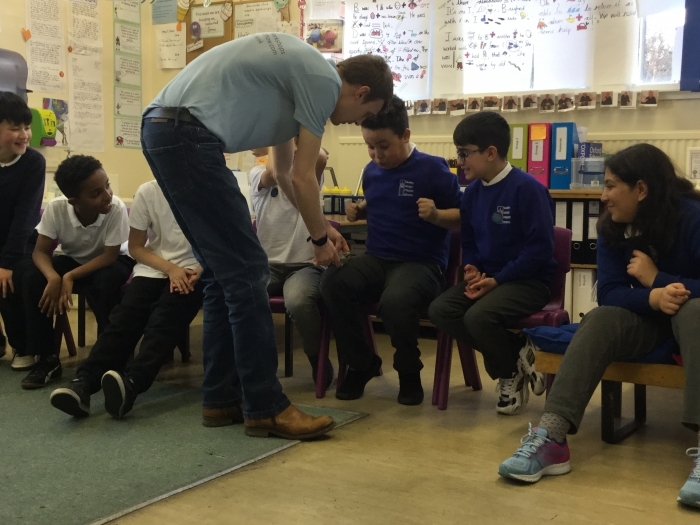 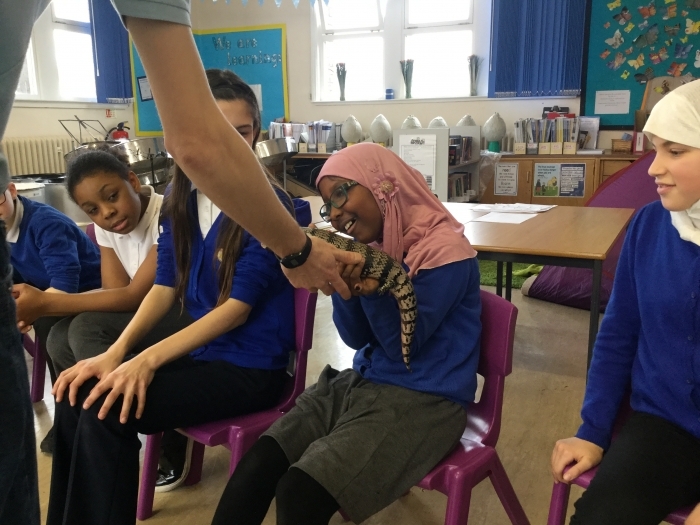 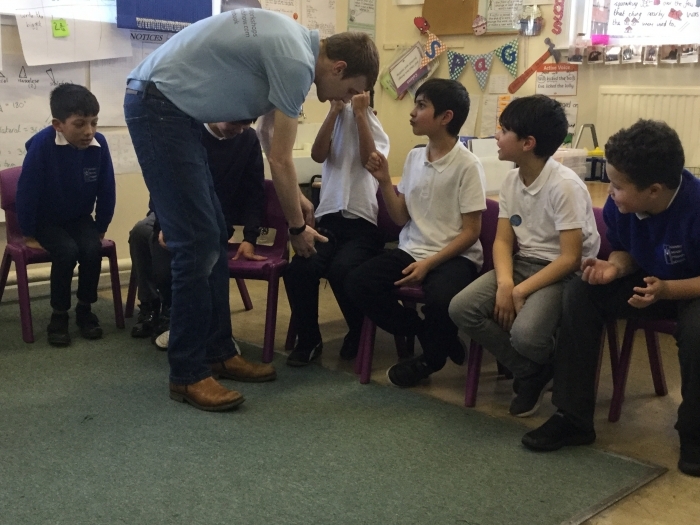 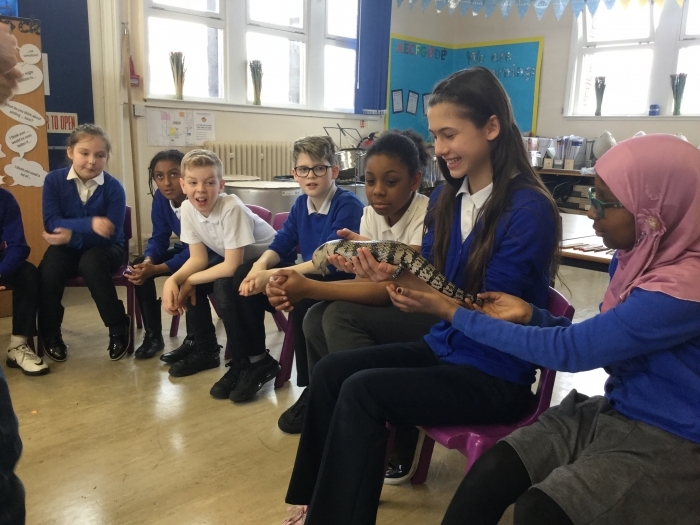 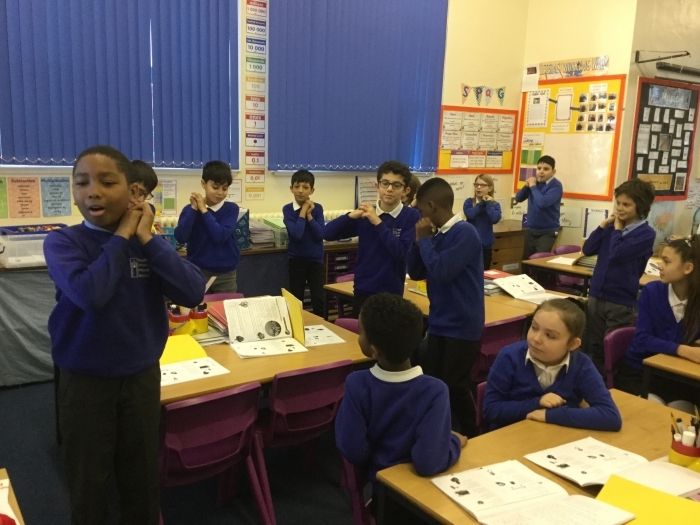 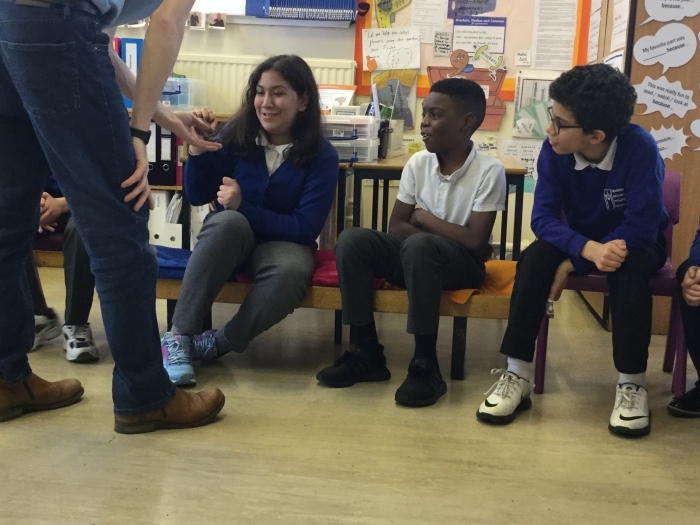 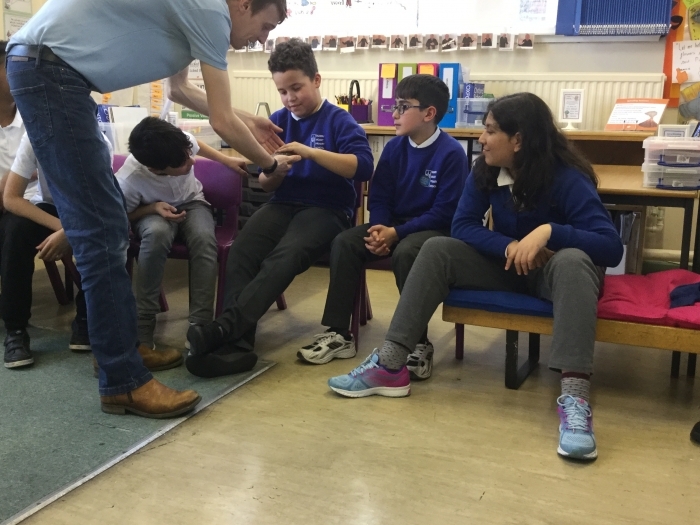 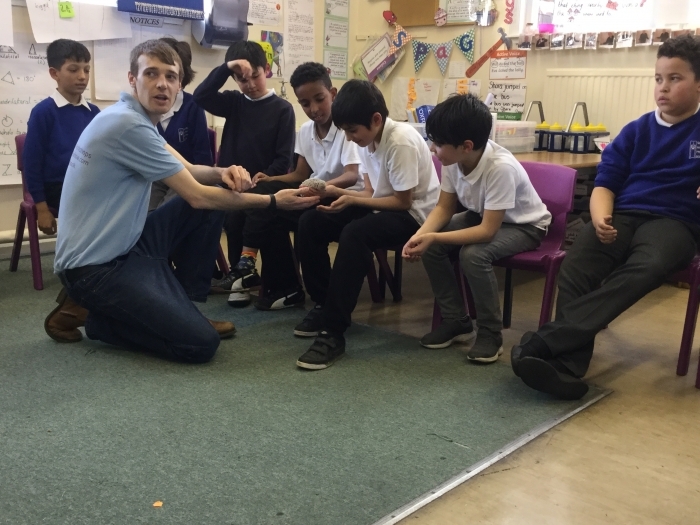 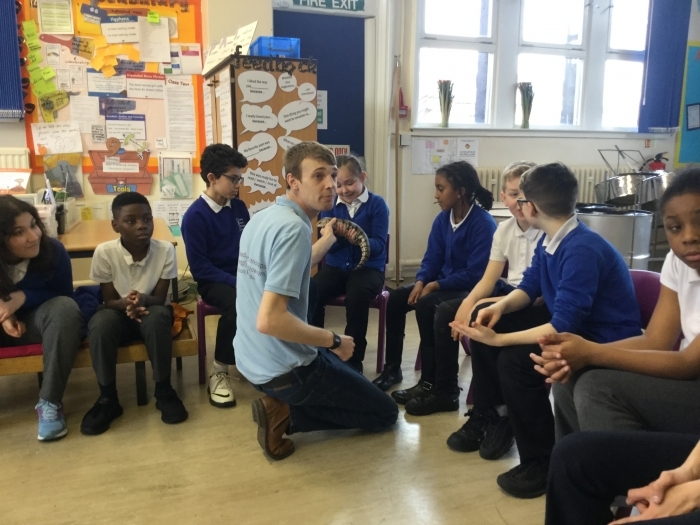 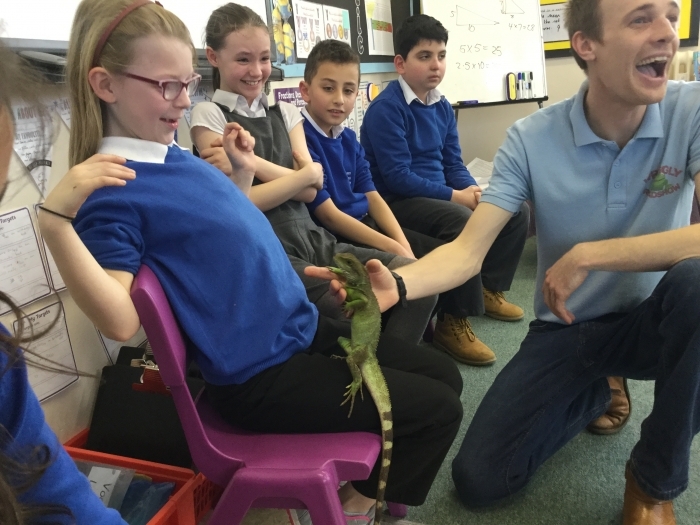 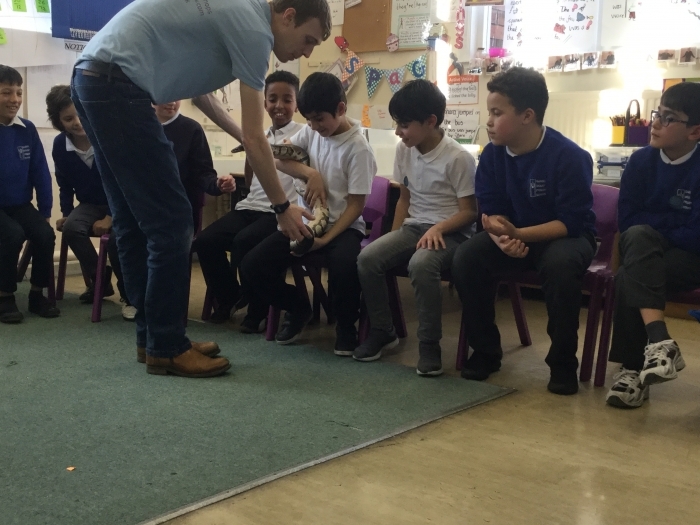 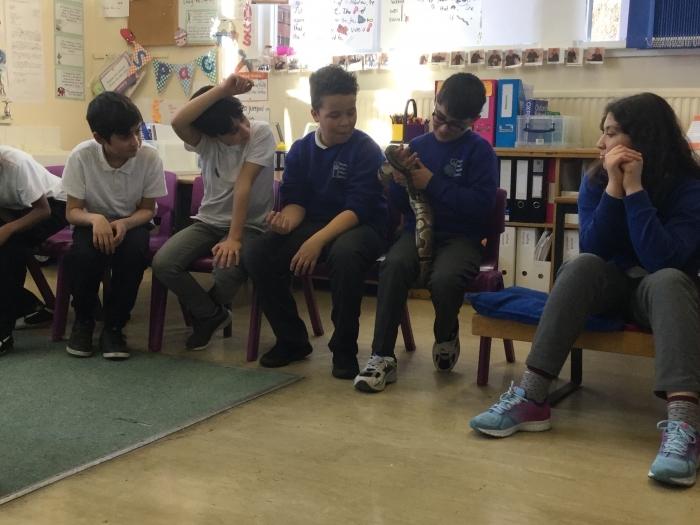 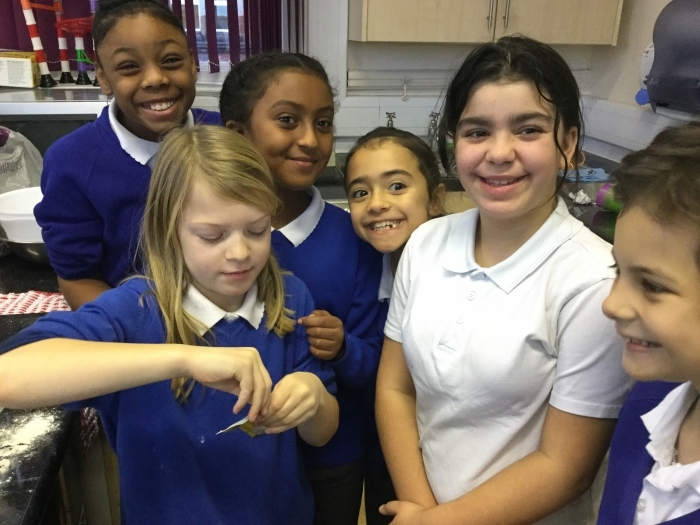 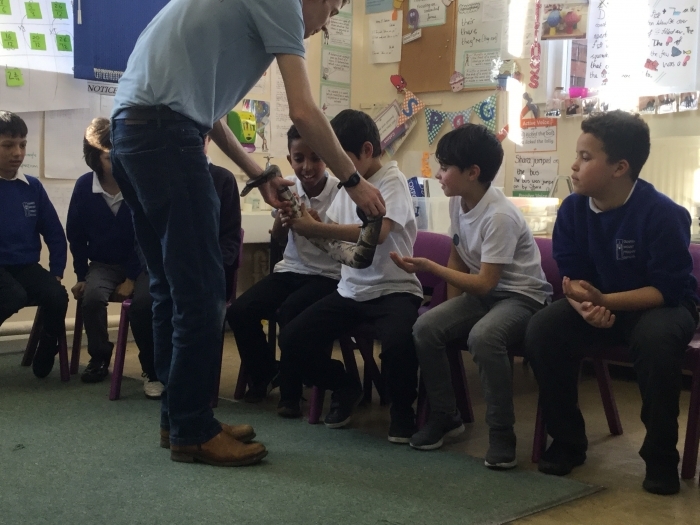 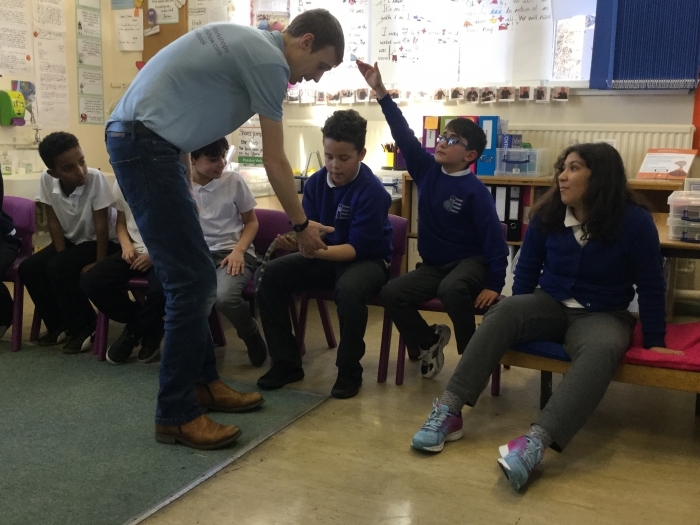 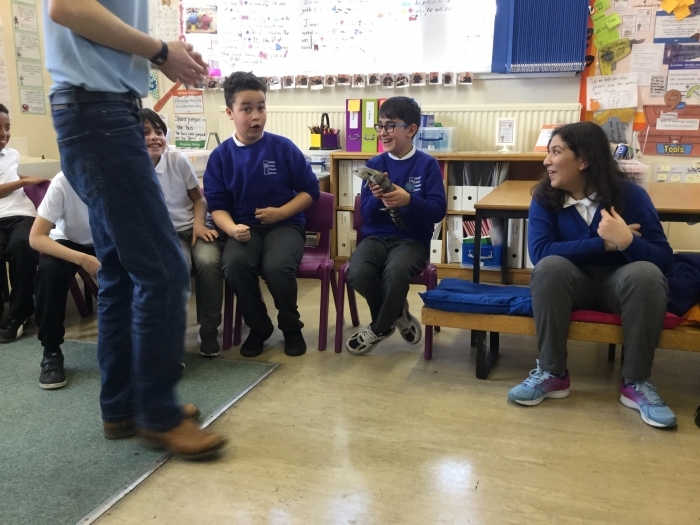 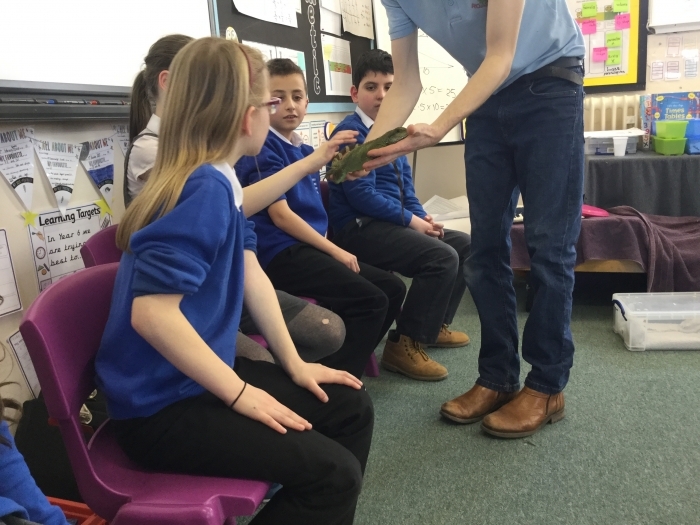 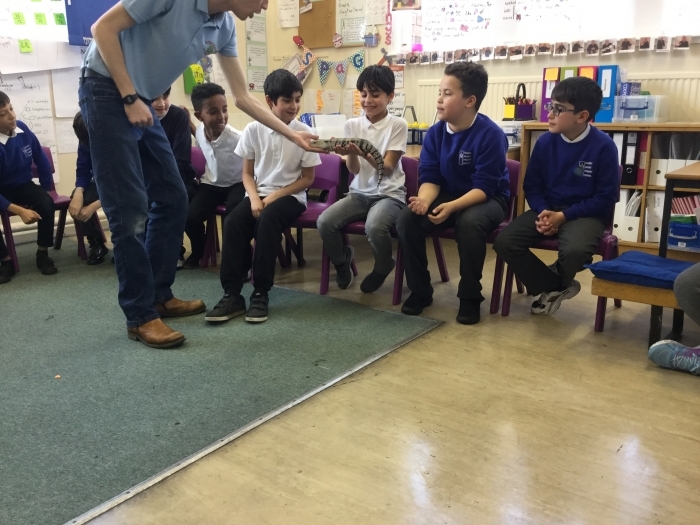 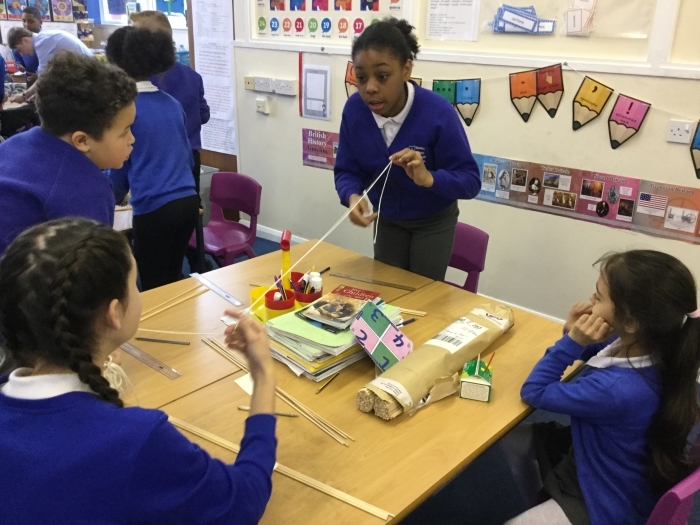 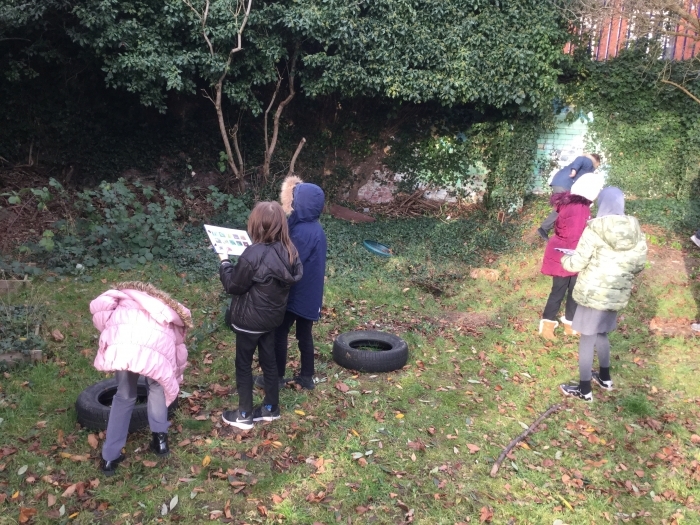 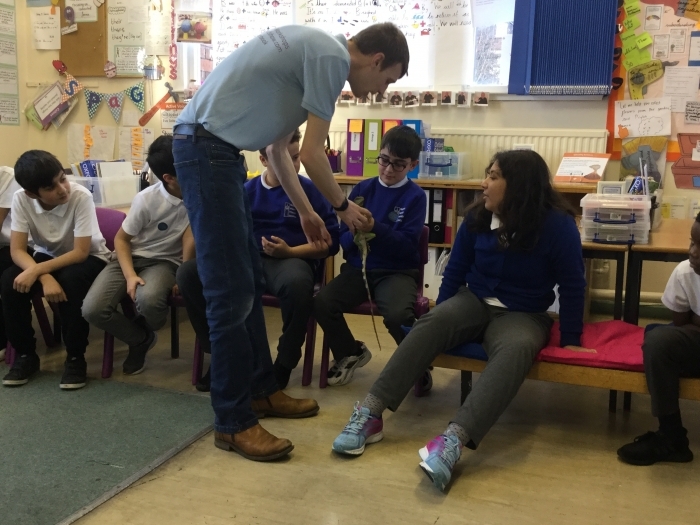 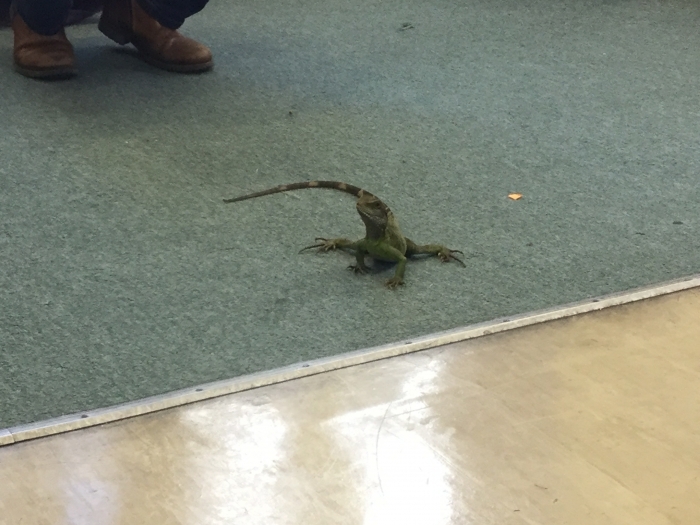 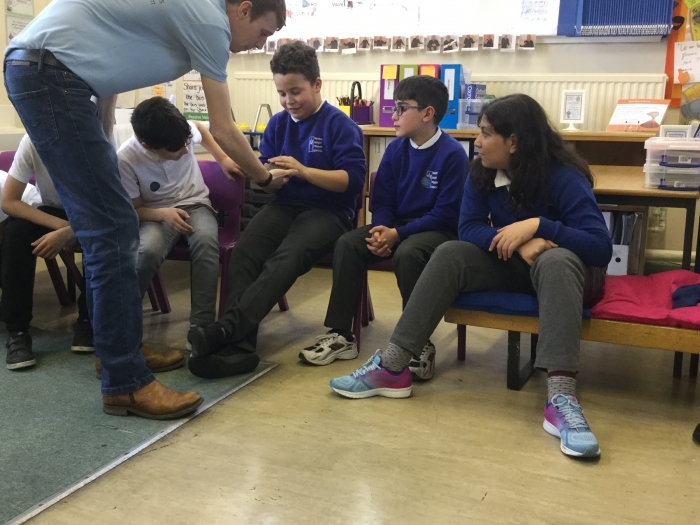 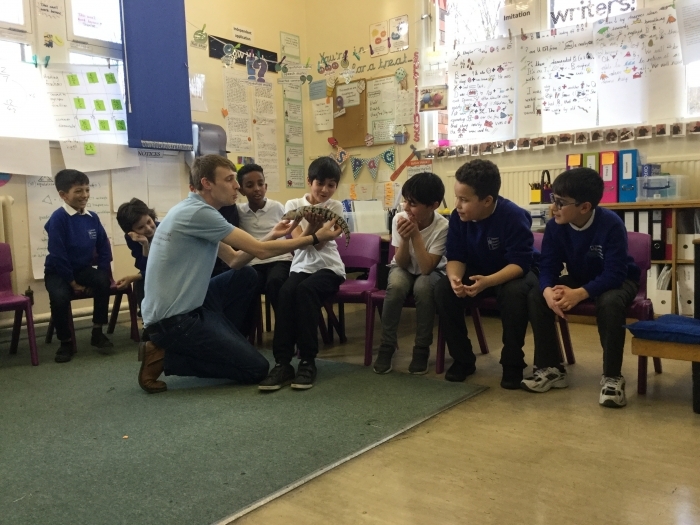 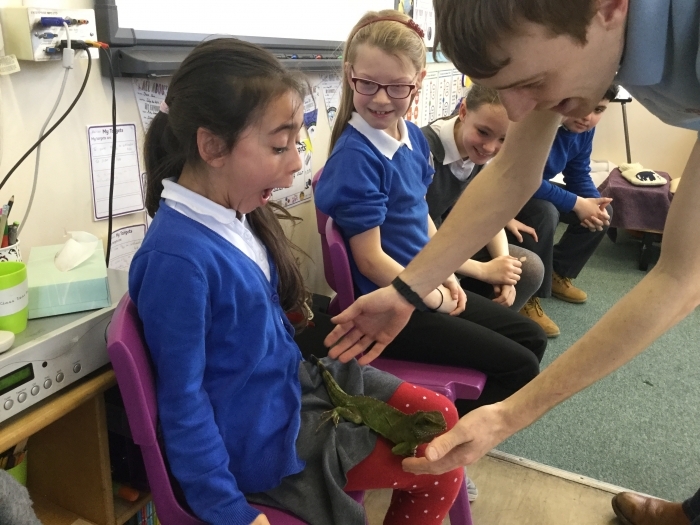 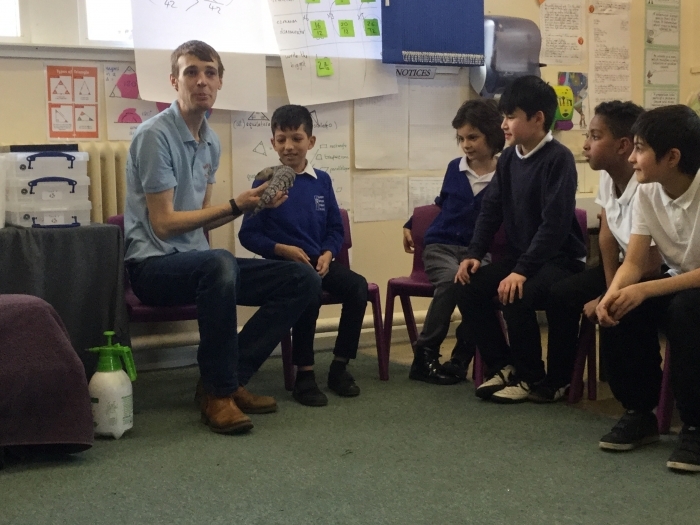 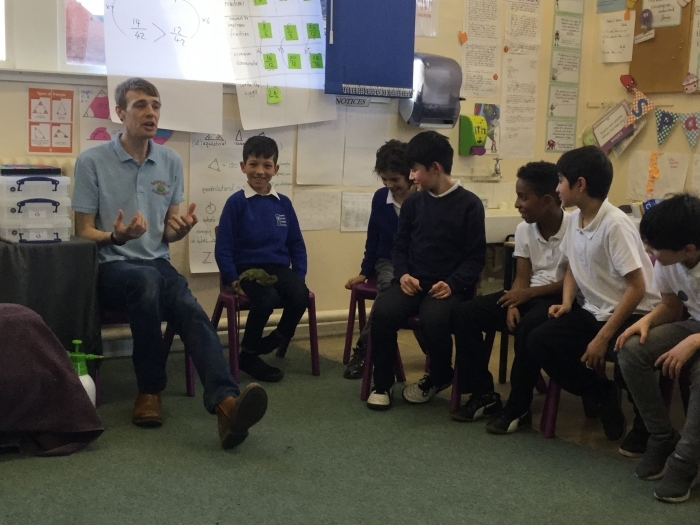 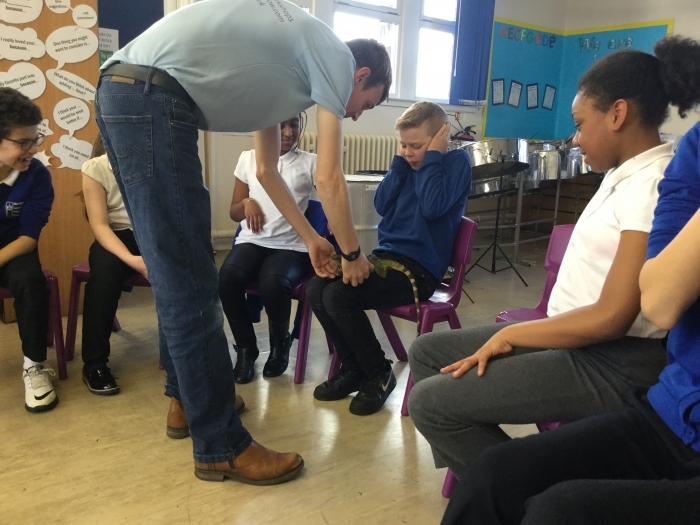 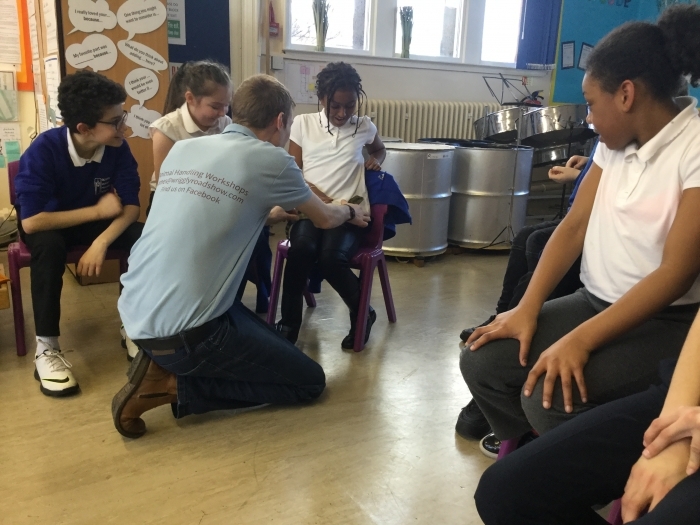 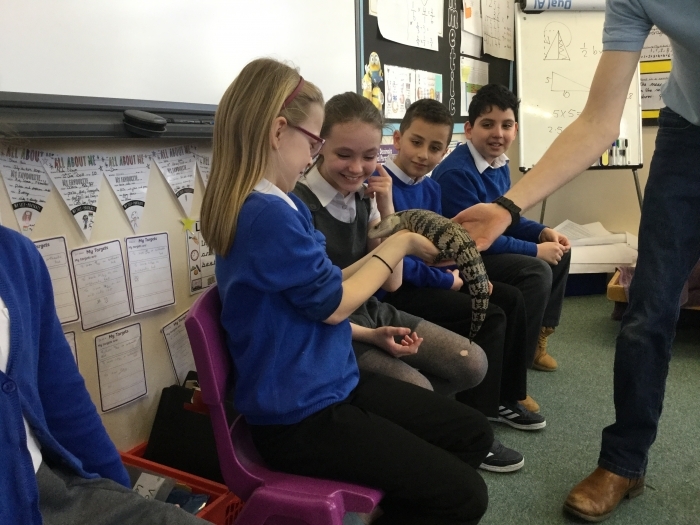 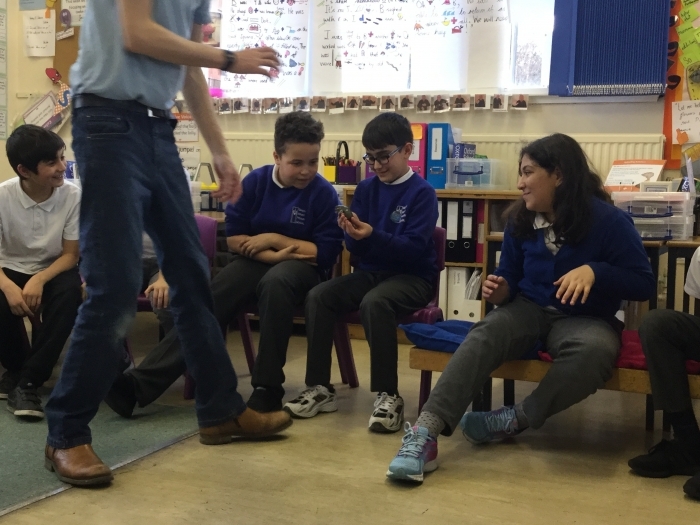 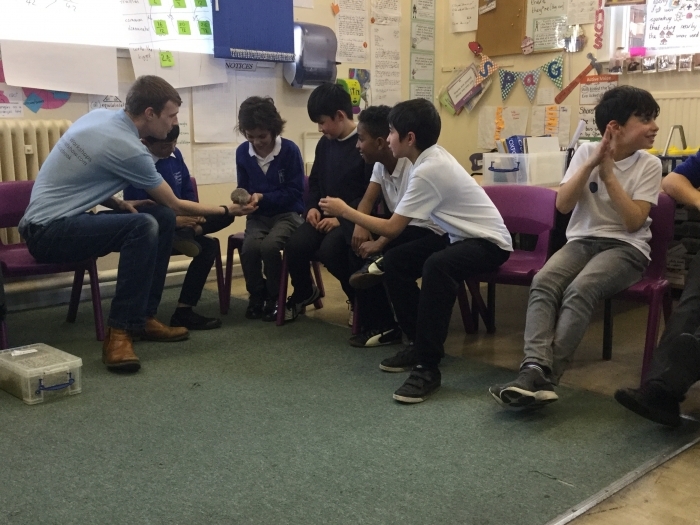 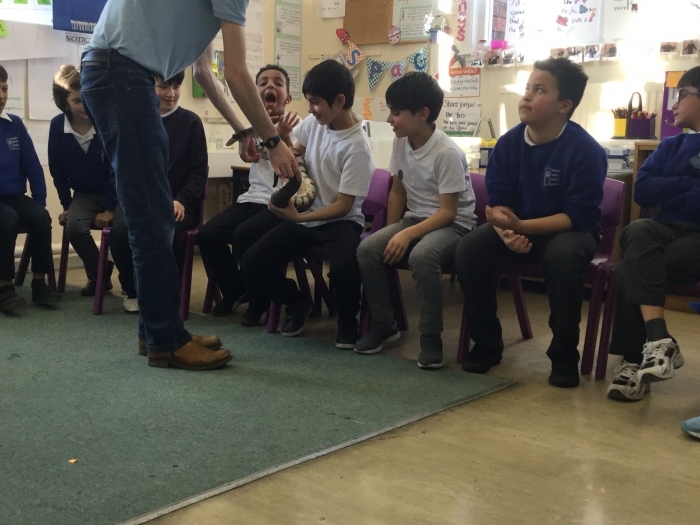 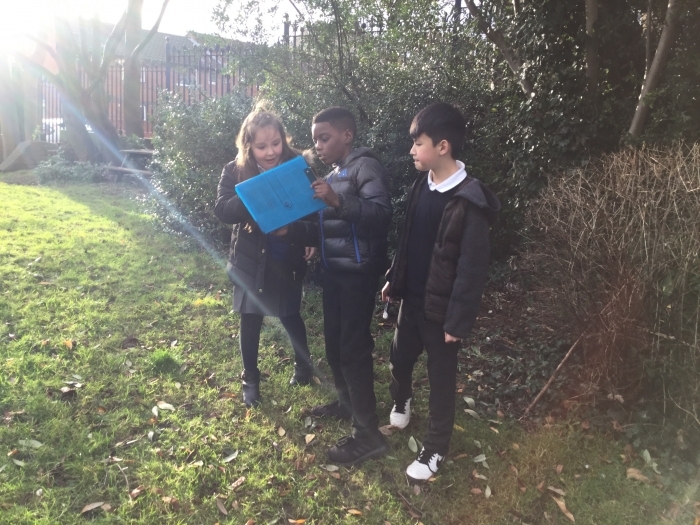 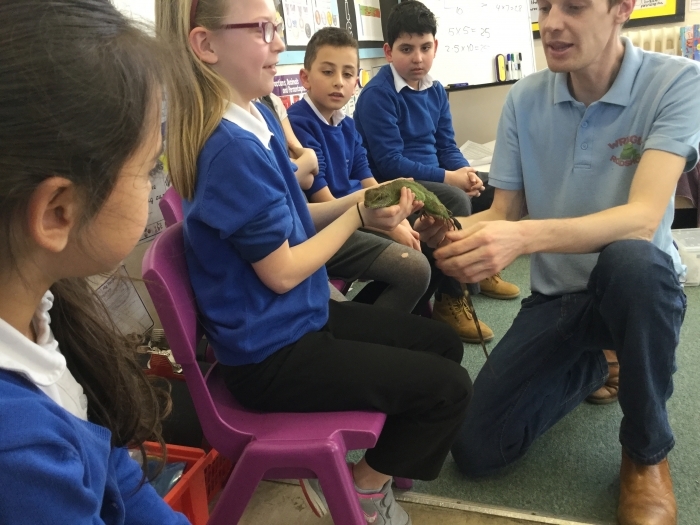 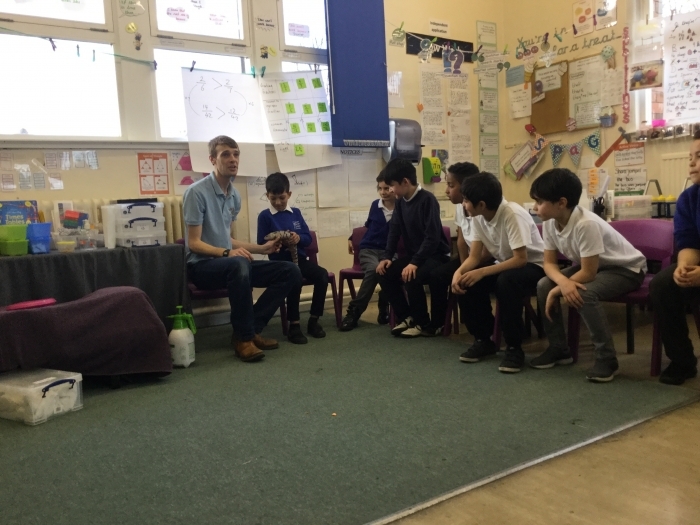 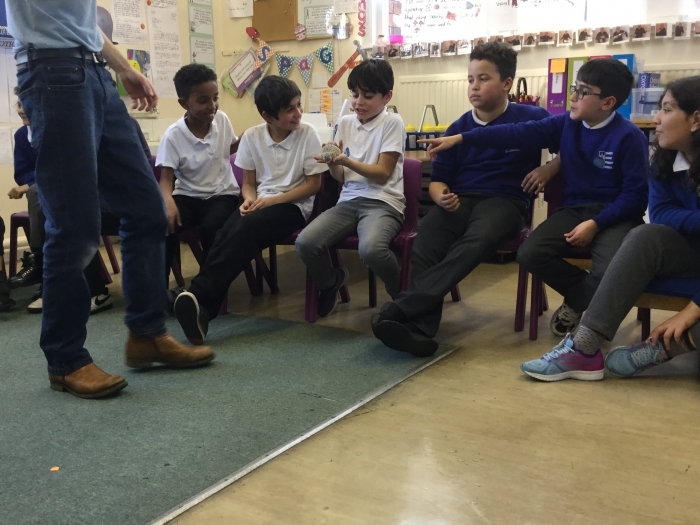 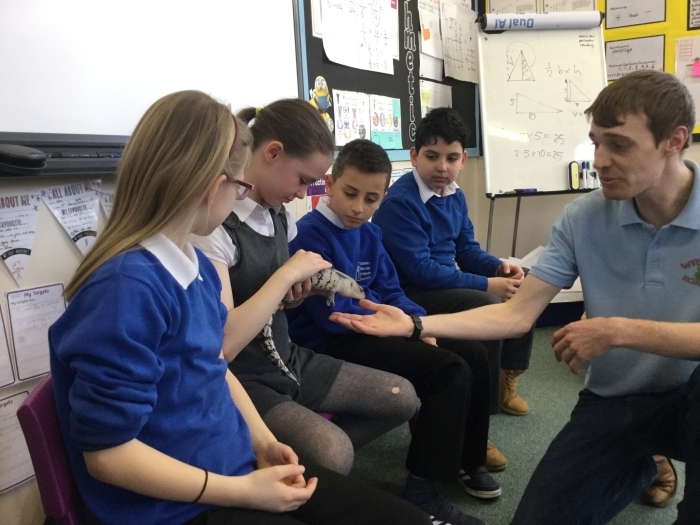 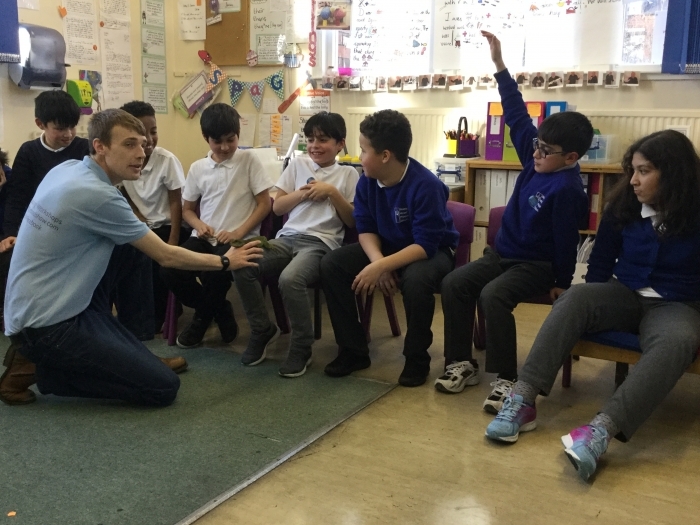 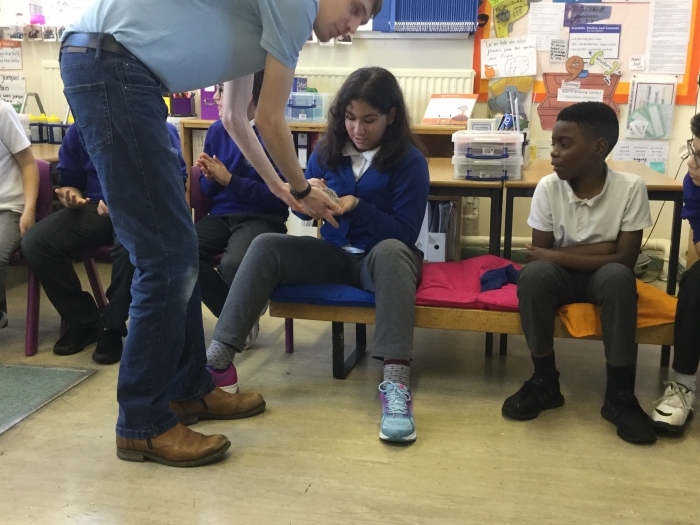 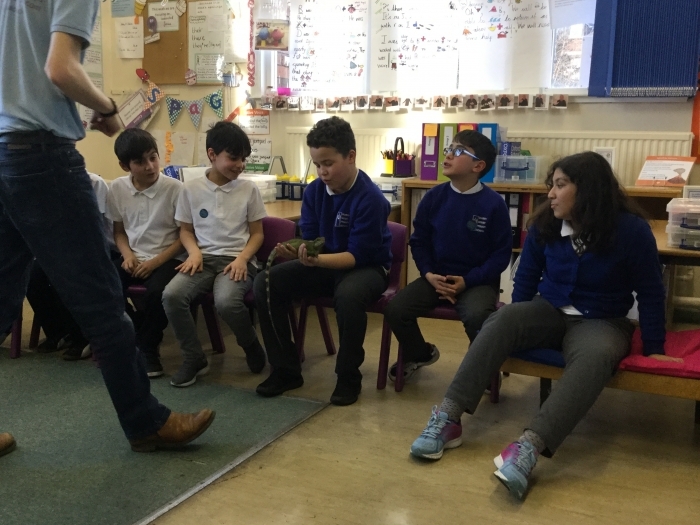 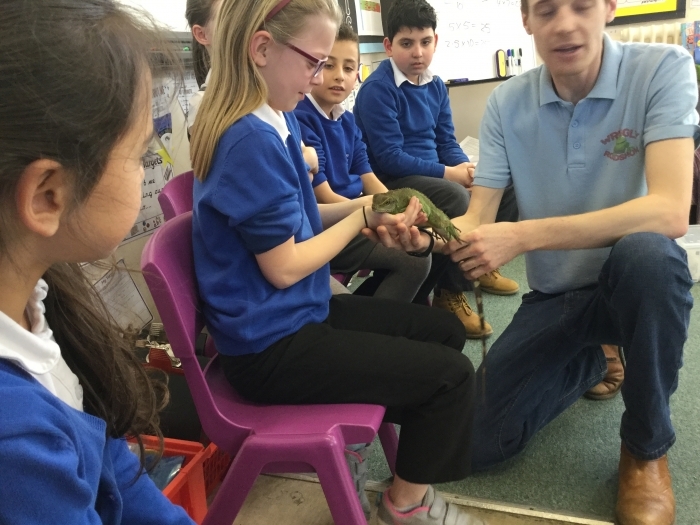 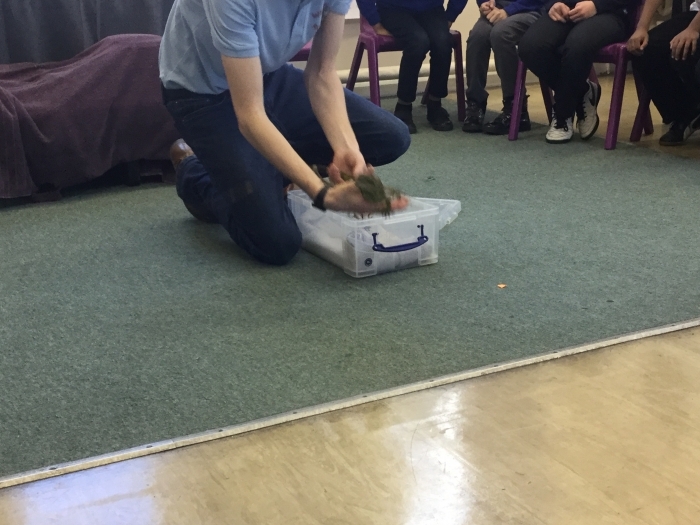 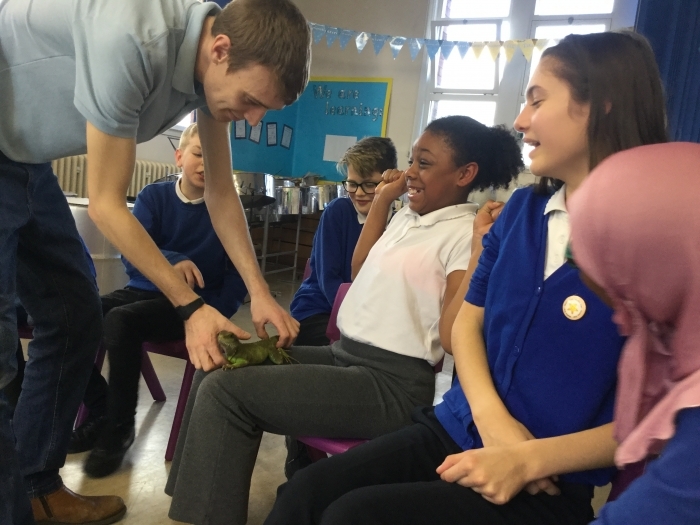 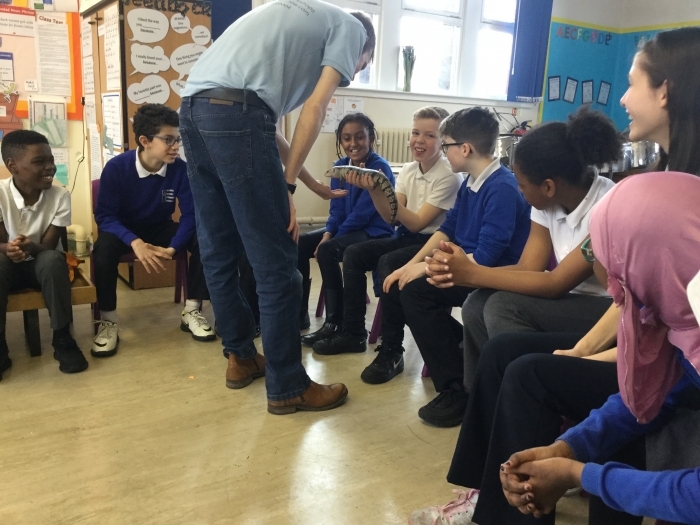 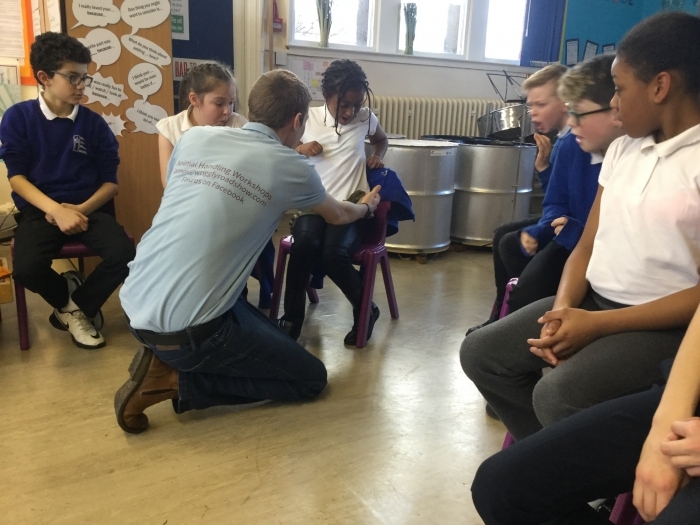 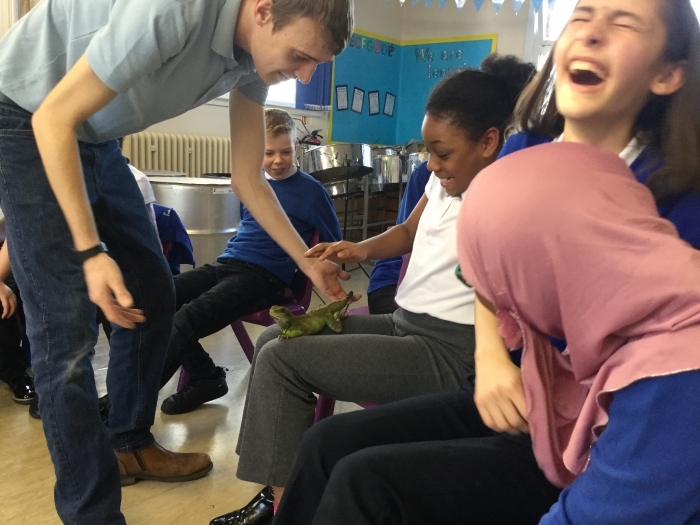 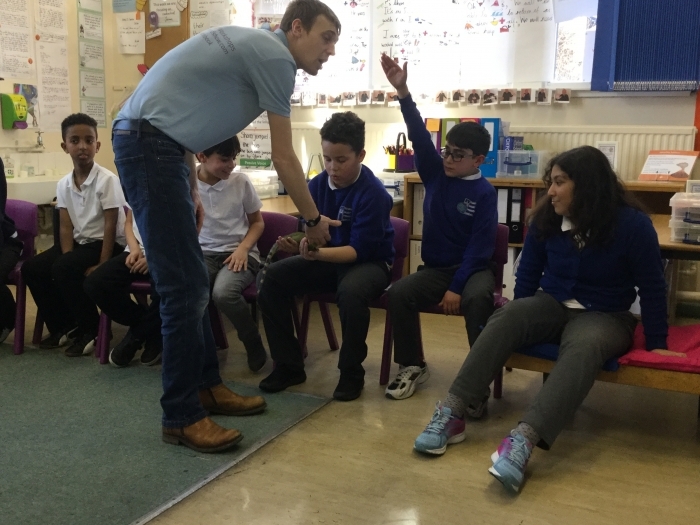 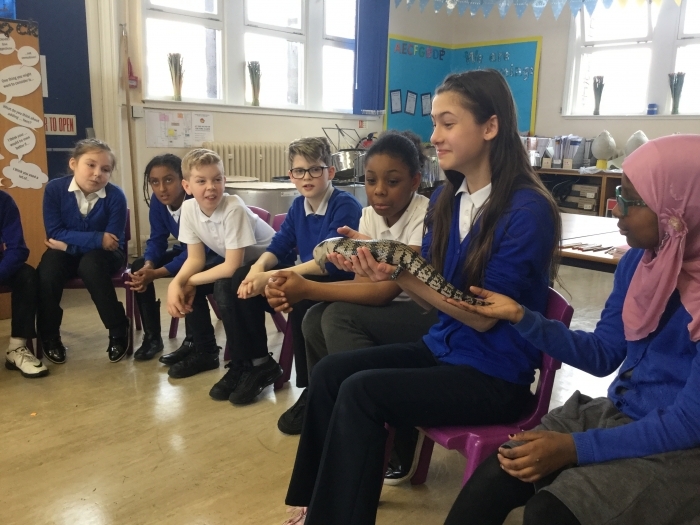 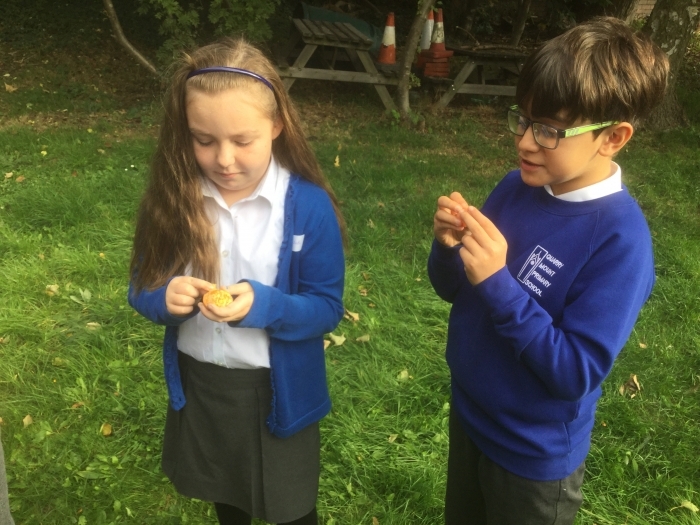 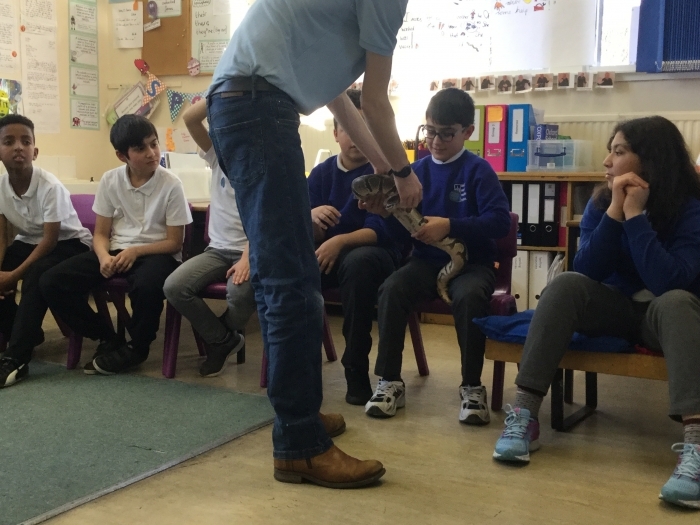 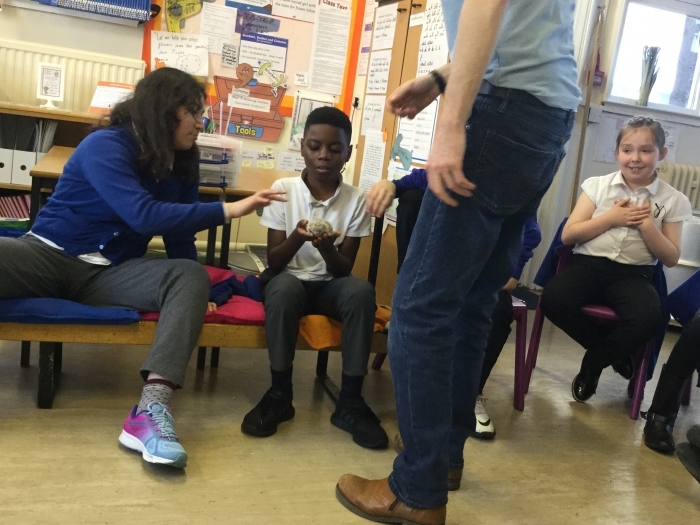 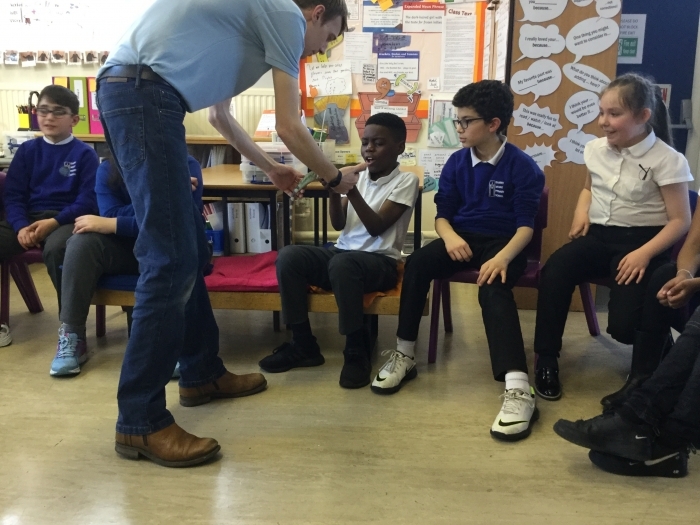 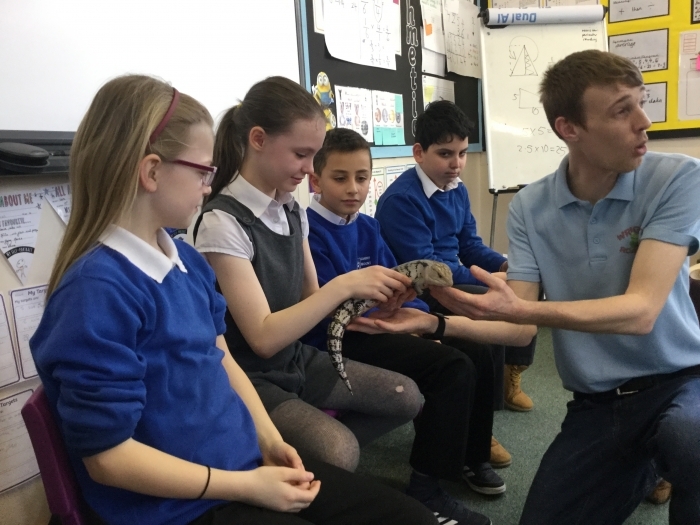 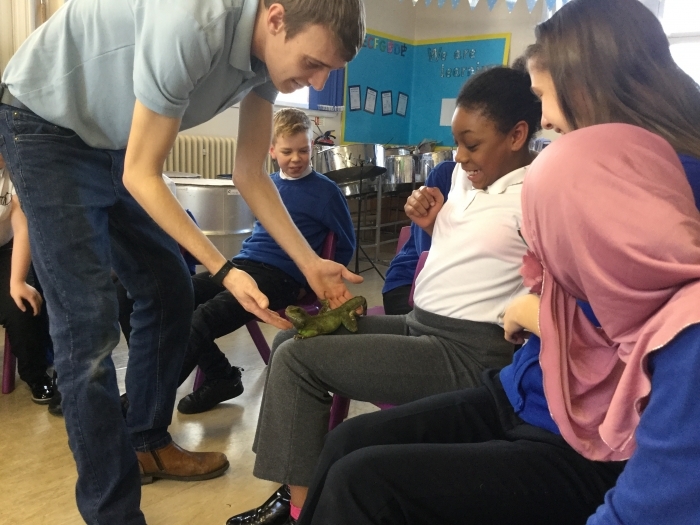 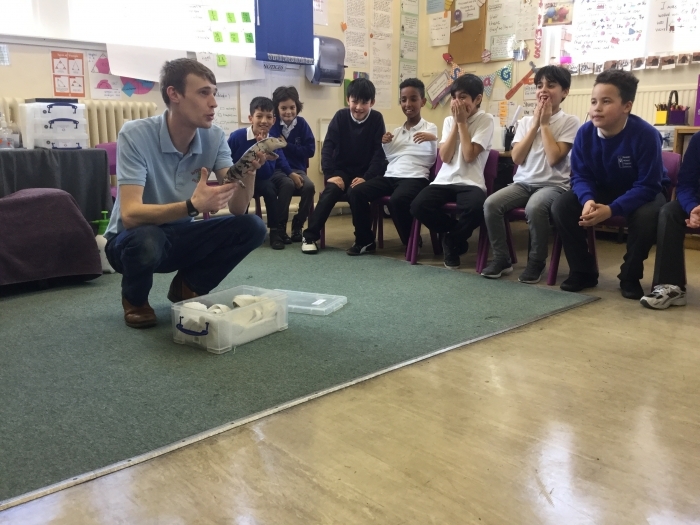 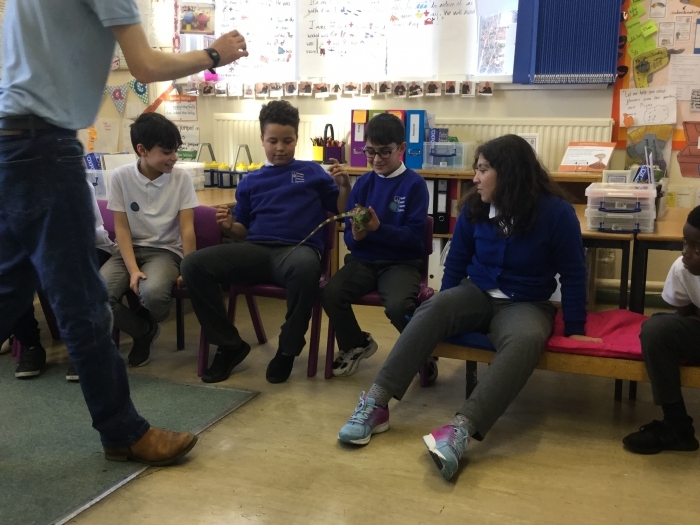 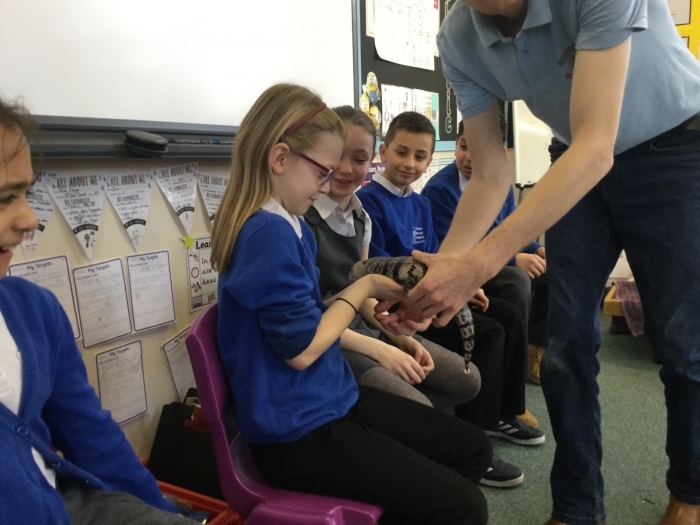 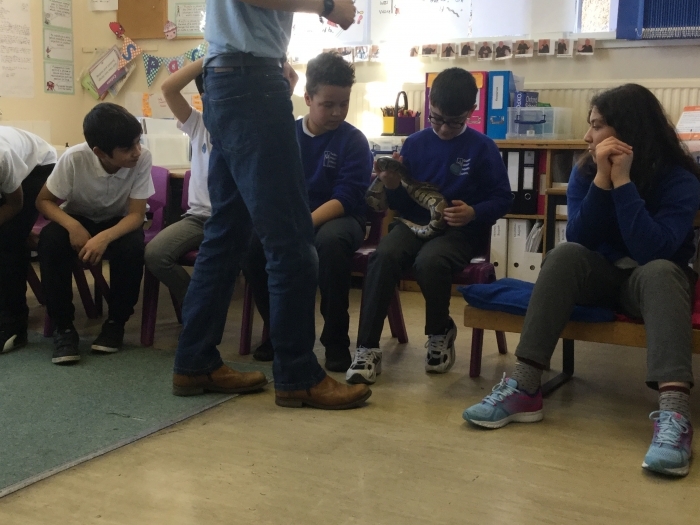 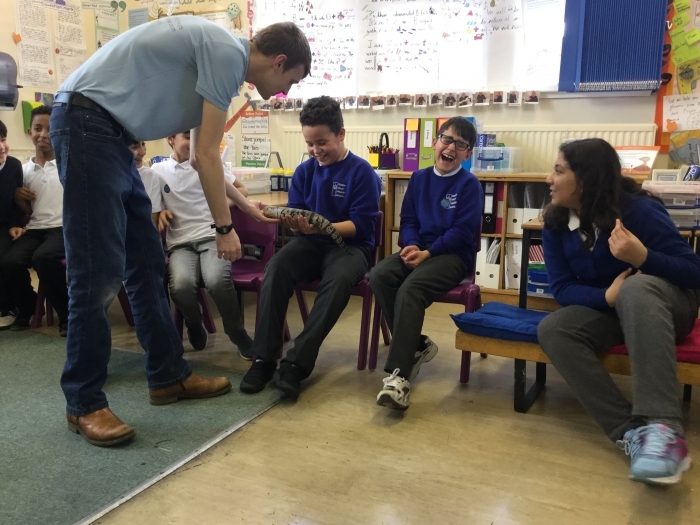 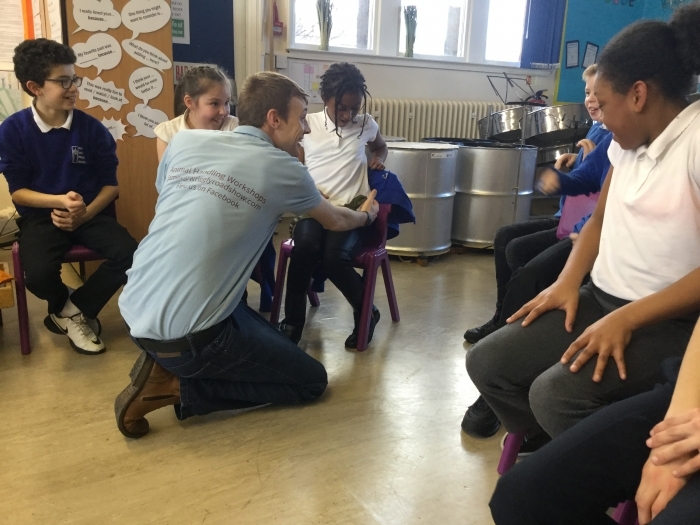 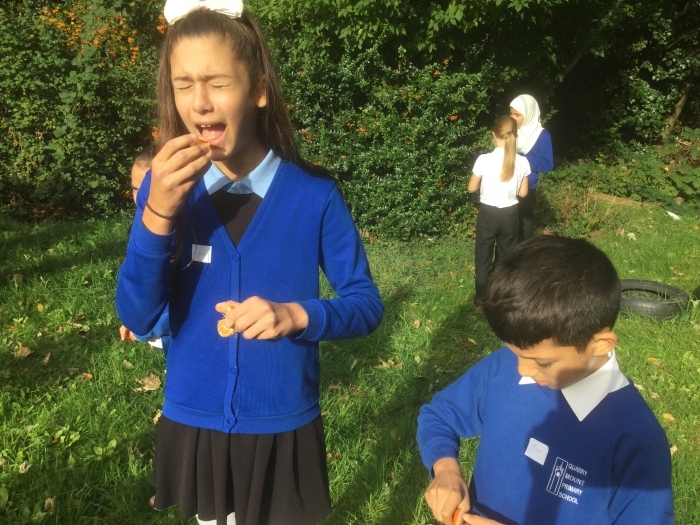 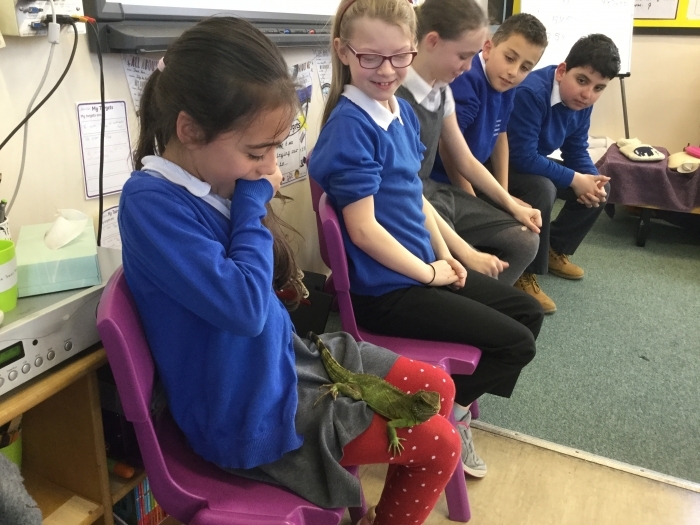 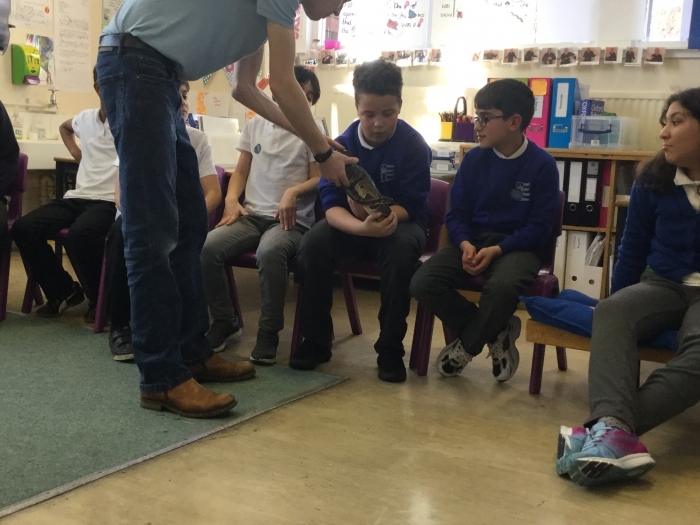 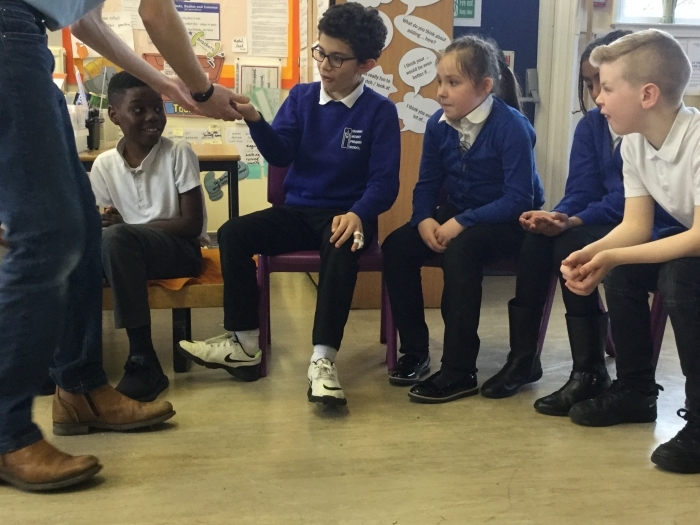 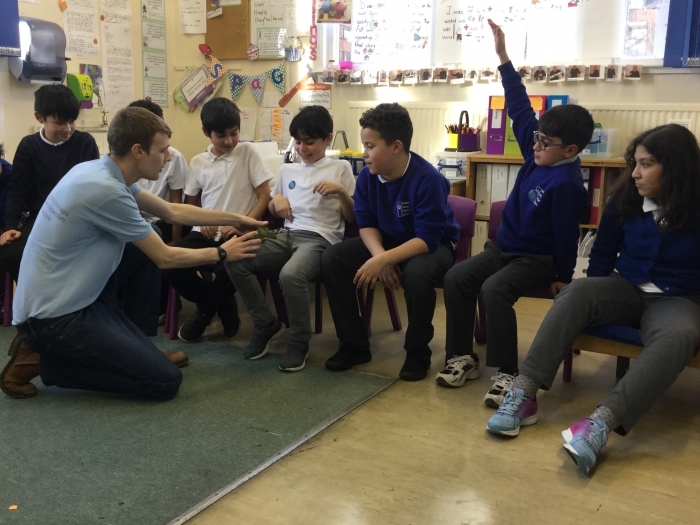 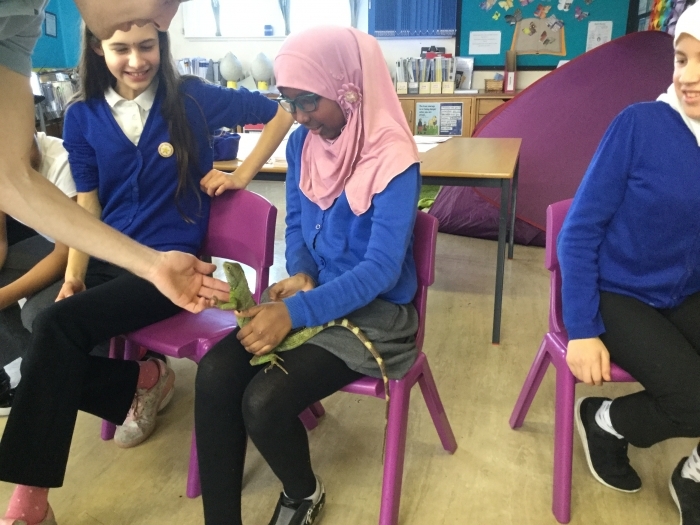 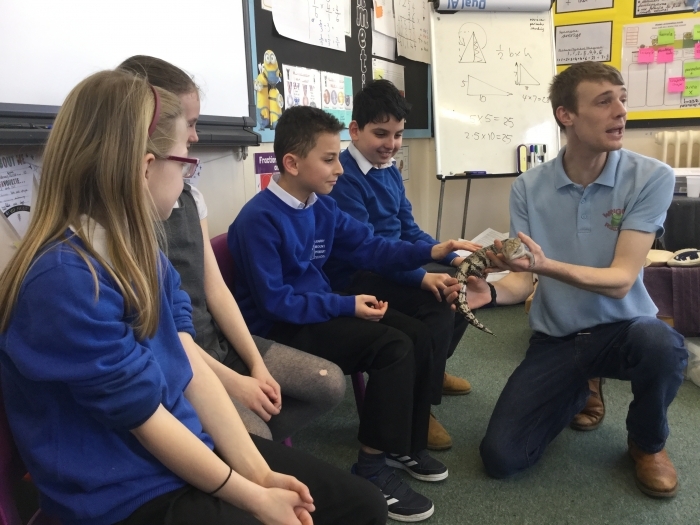 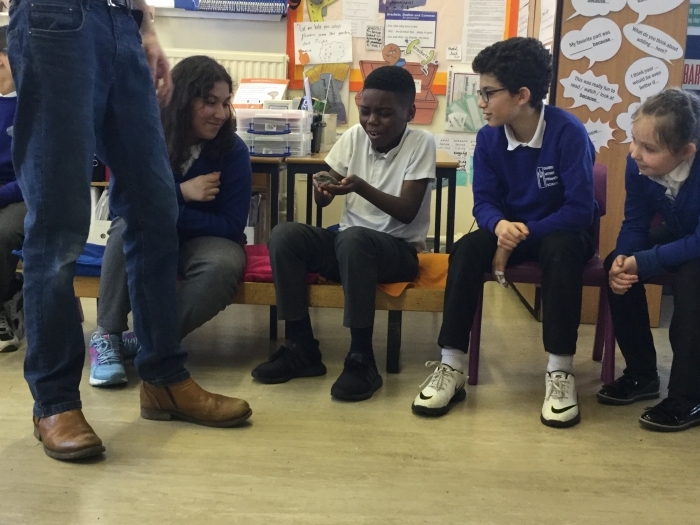 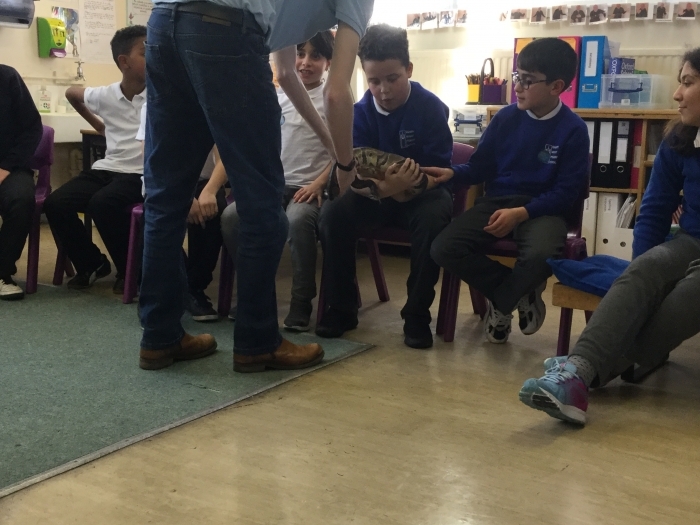 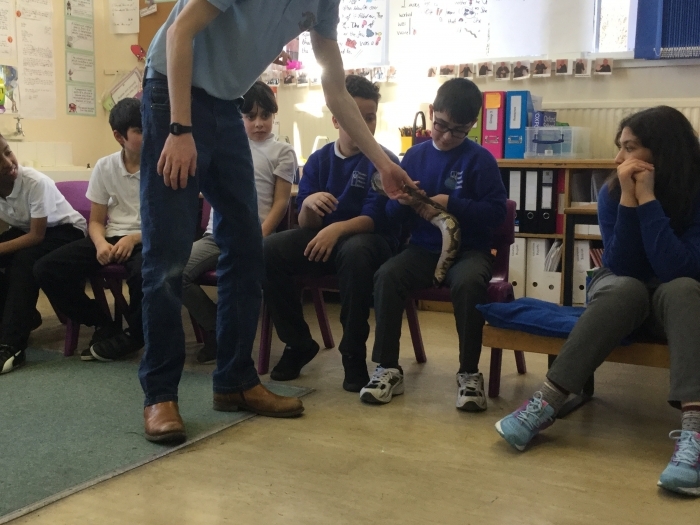 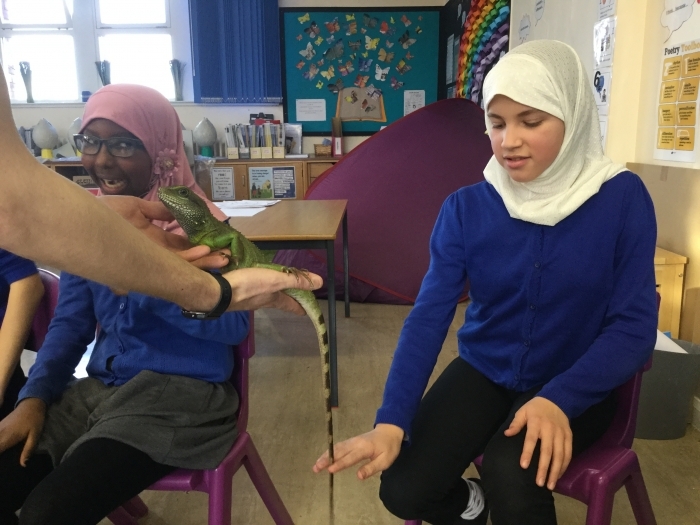 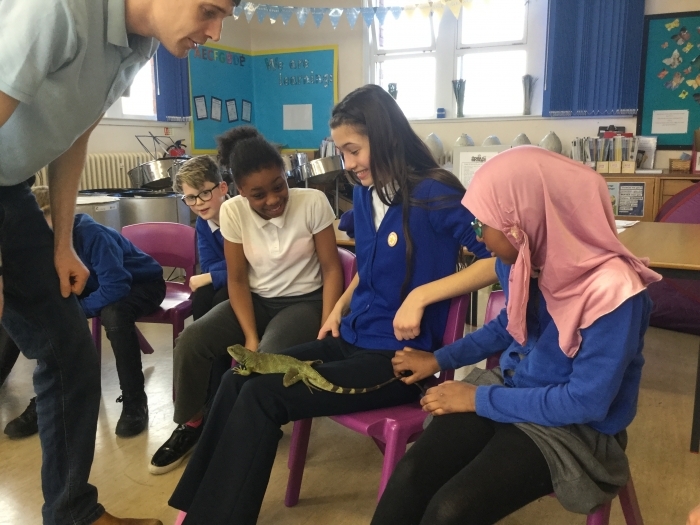 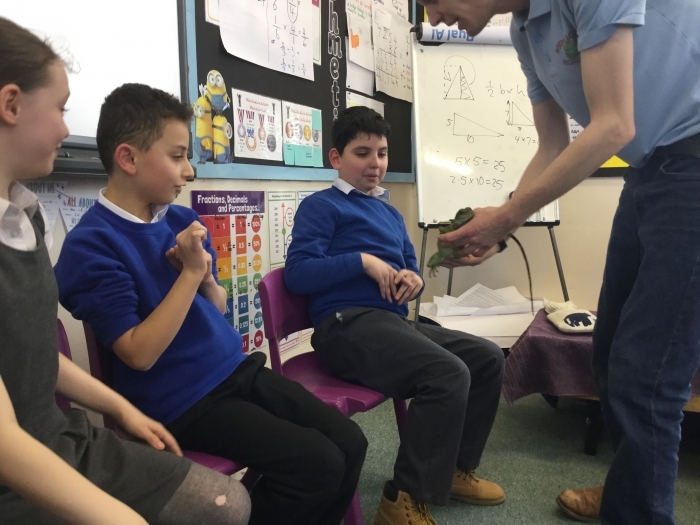 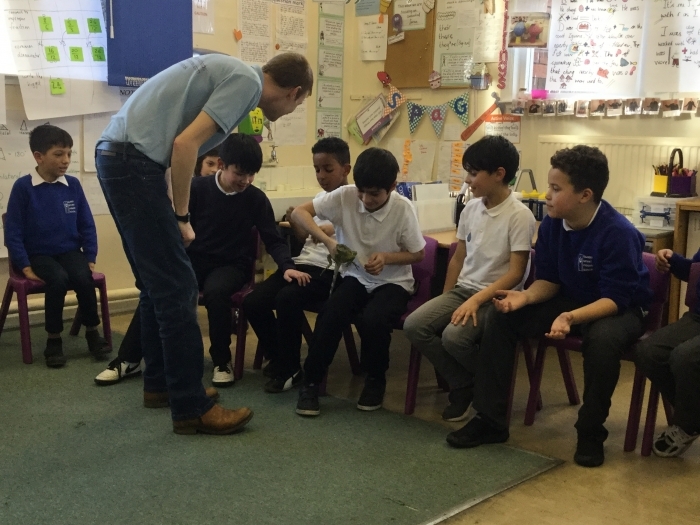 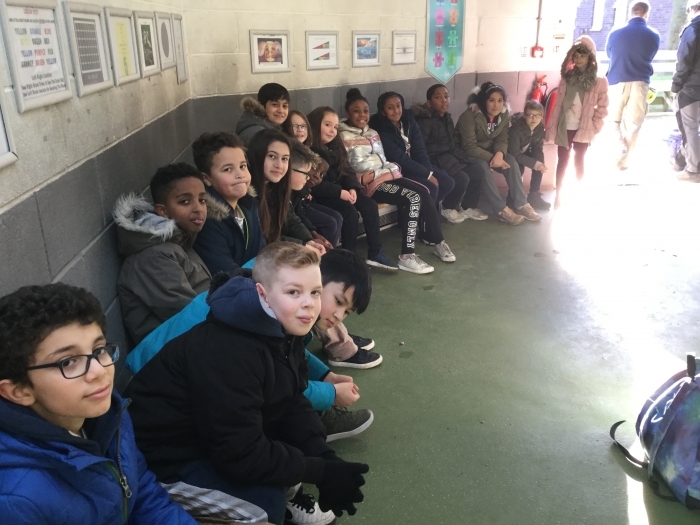 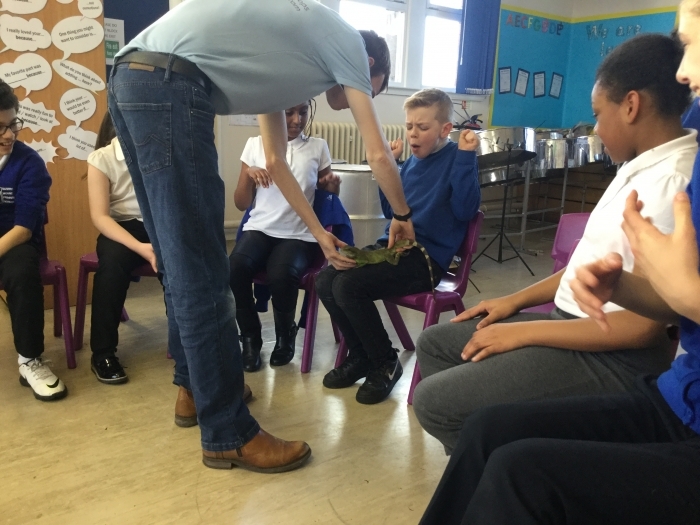 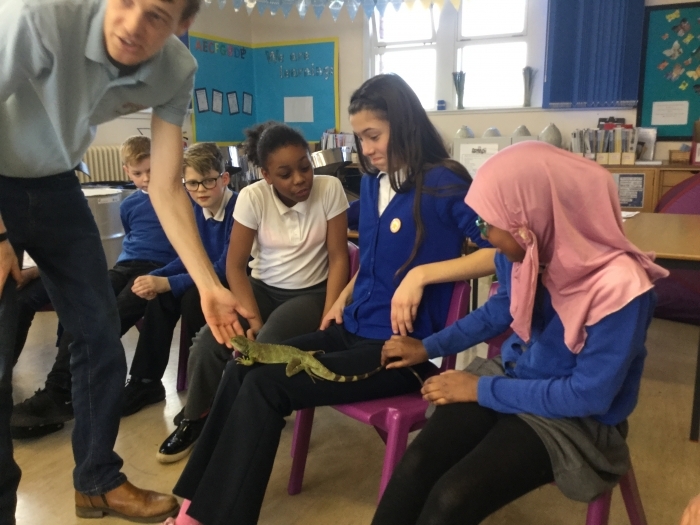 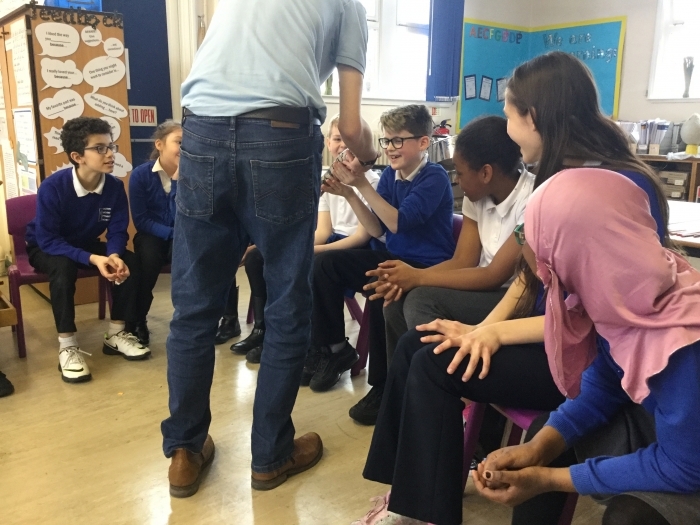 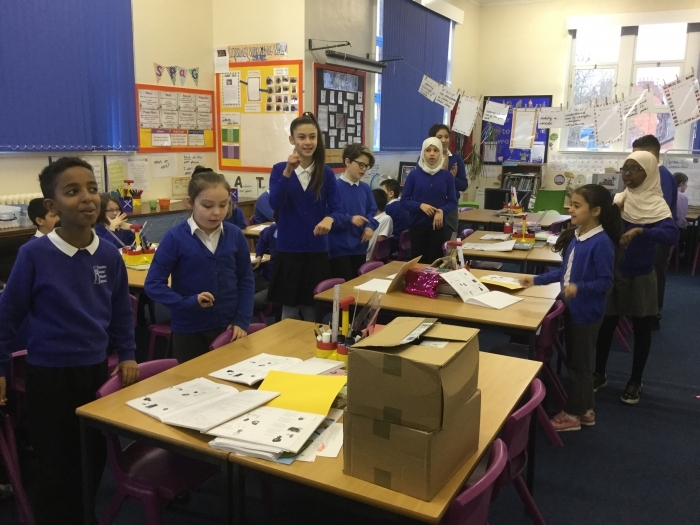 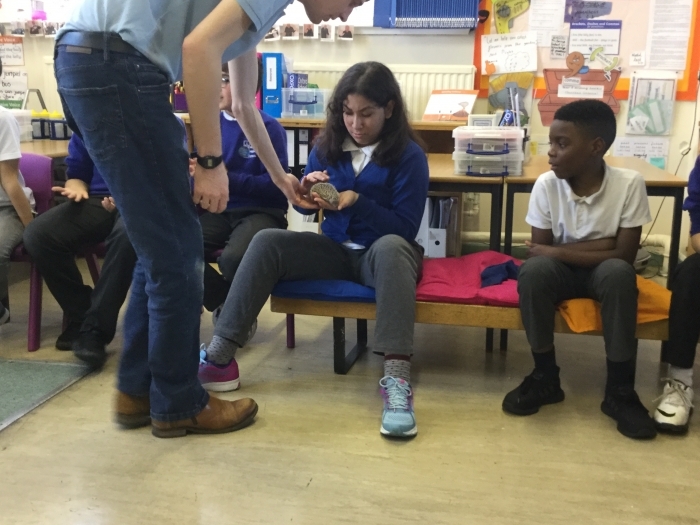 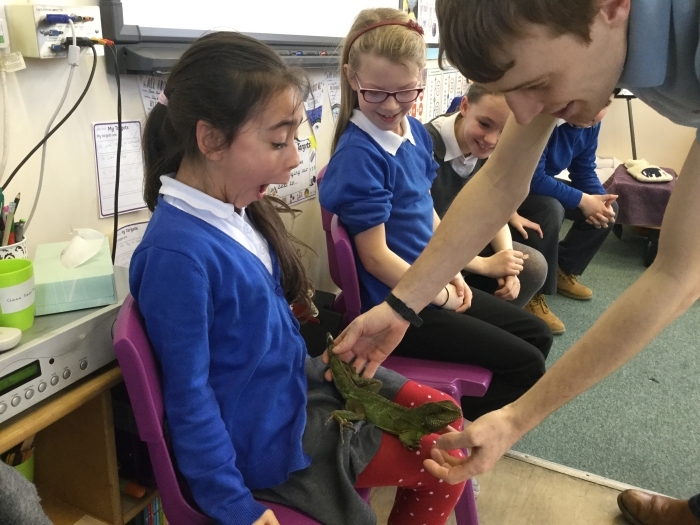 In February, Year 5 took part in the "Wriggly Roadshow" where they got to learn about, hold and stroke a variety of interesting animals including: a skink, a snake, lizards, a tenrec, a frog and more. 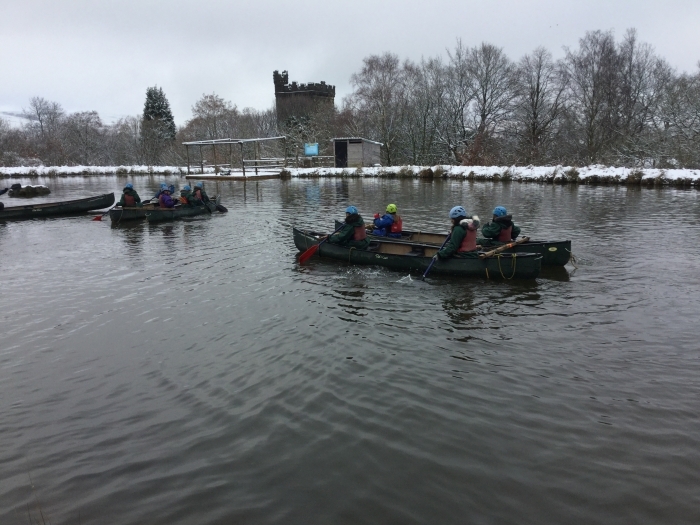 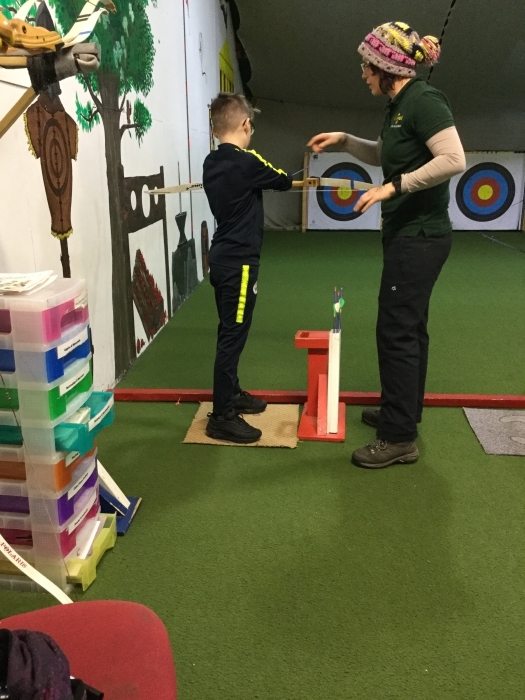 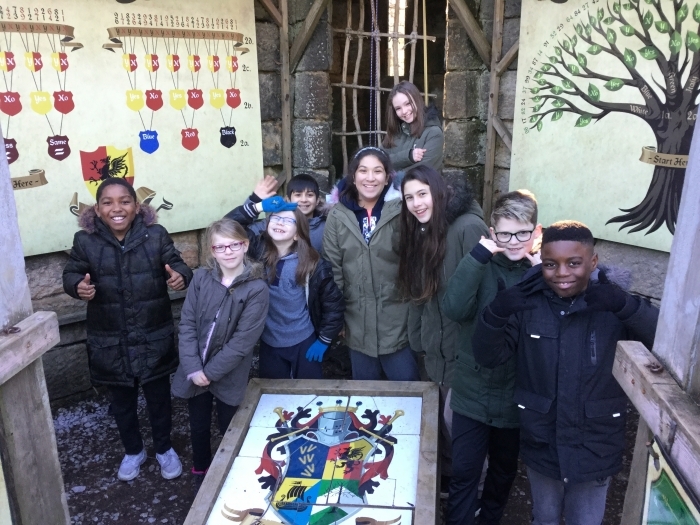 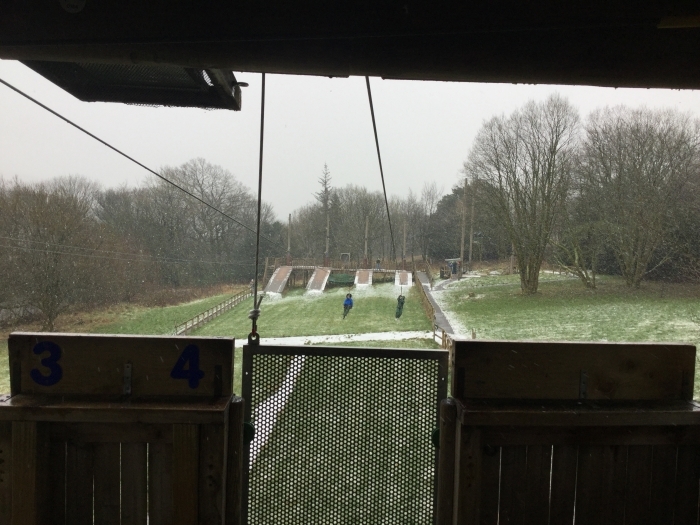 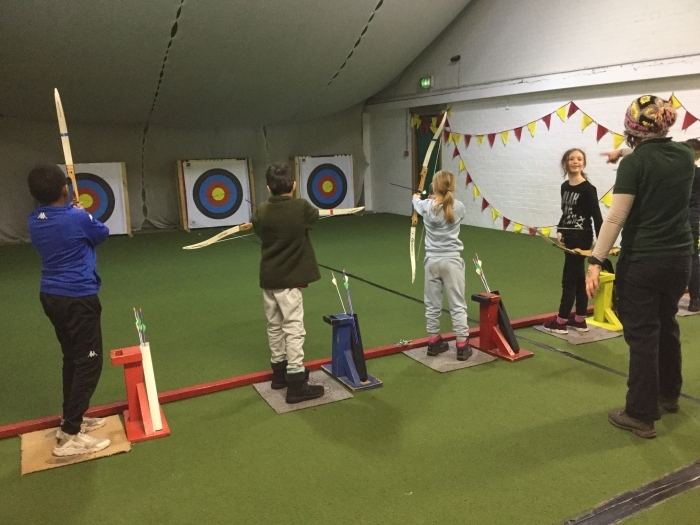 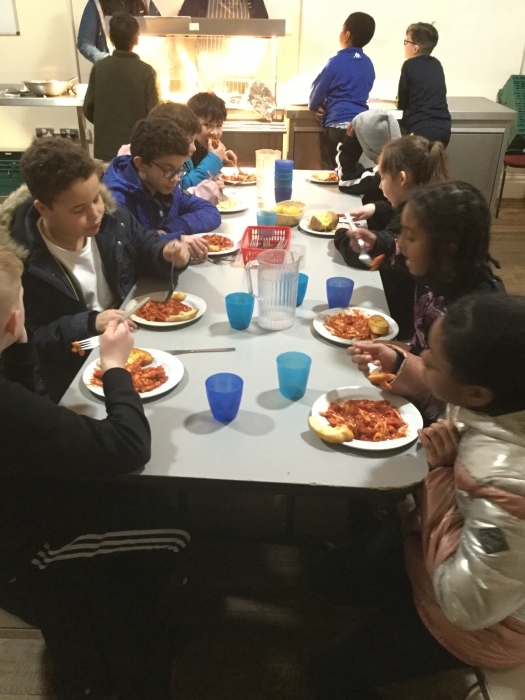 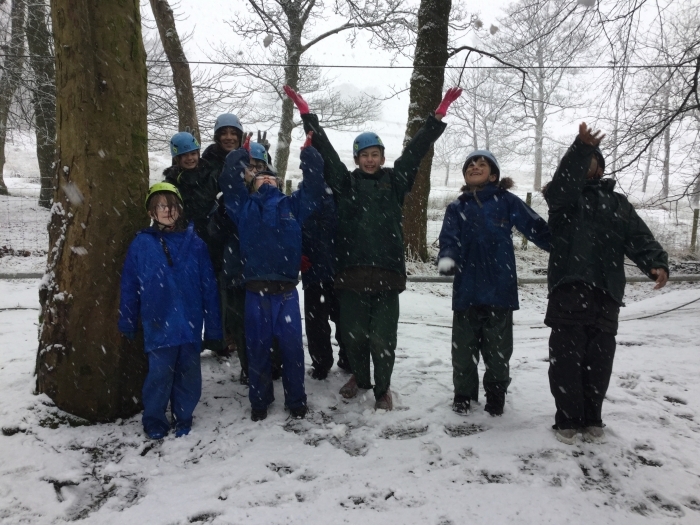 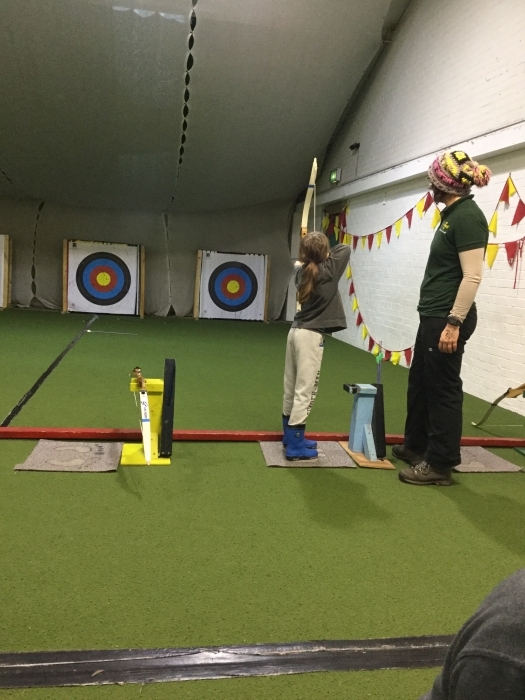 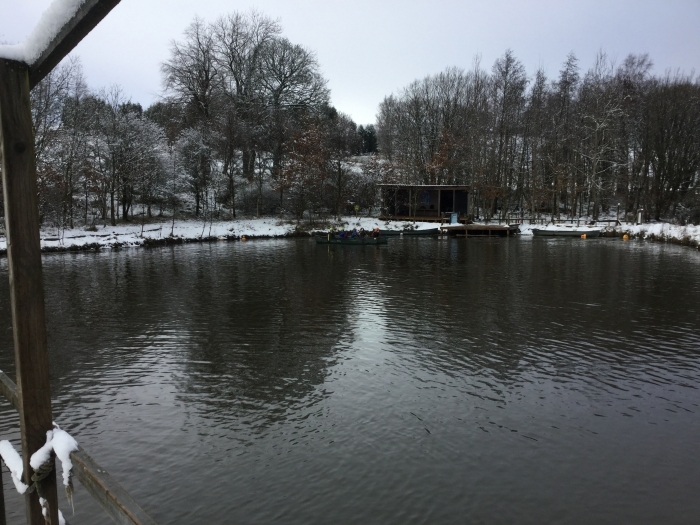 18 children from Year 5 took part in a residential trip to Robinwood Acitvity centre at Dobroyd Castle with Miss Blackstone and Miss Boyd. 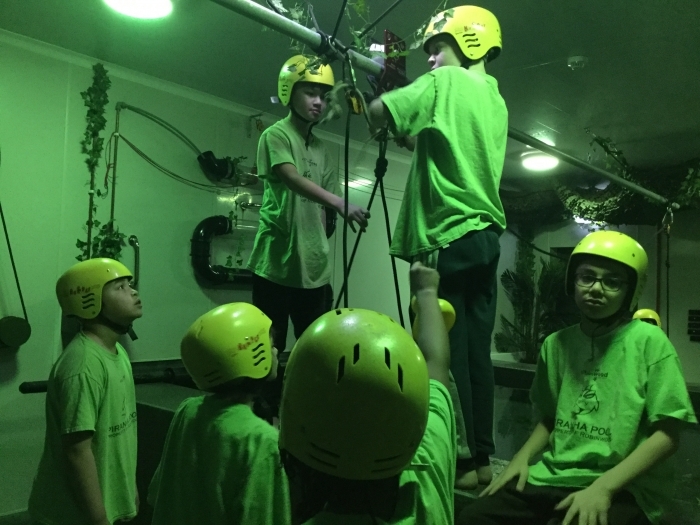 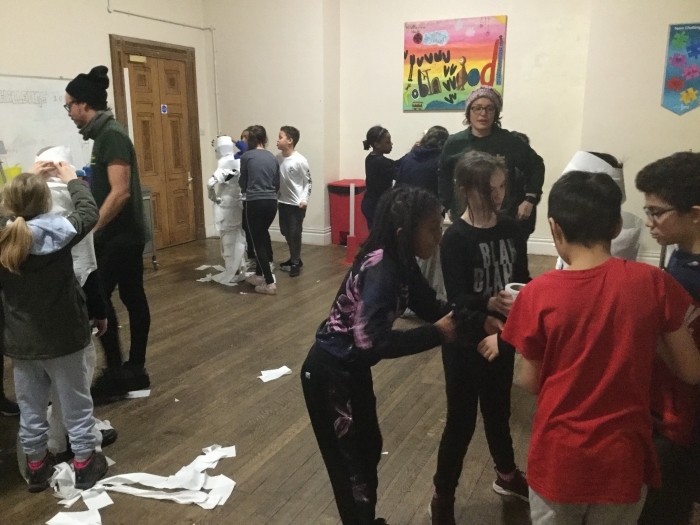 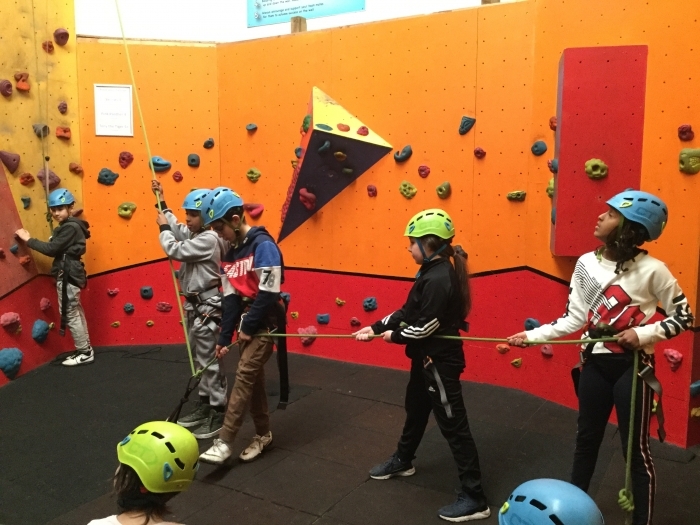 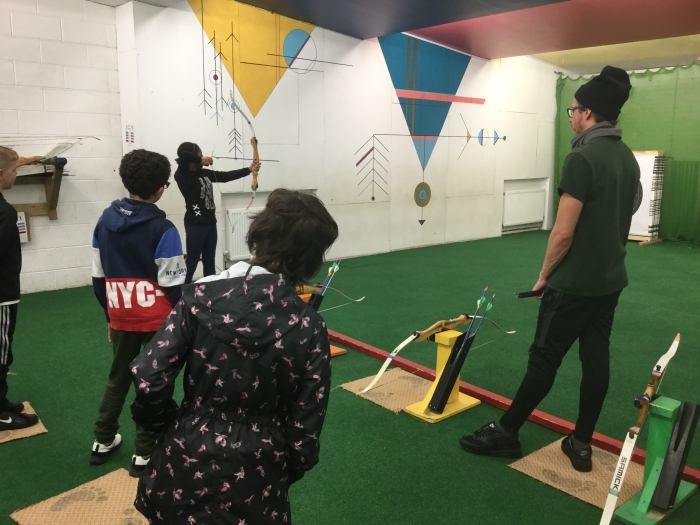 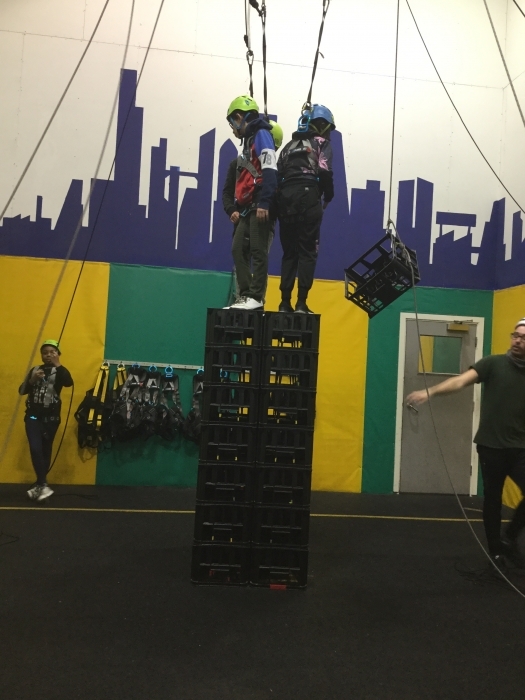 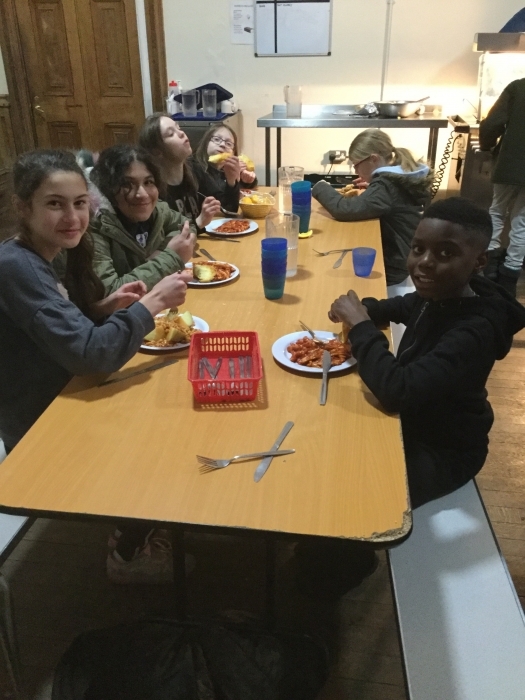 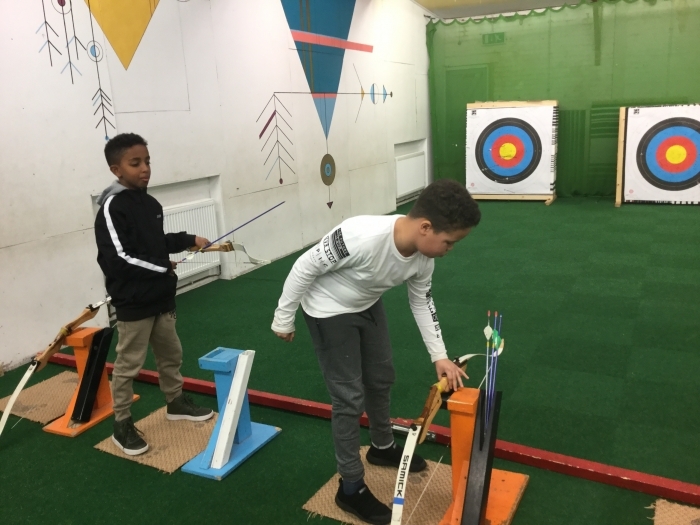 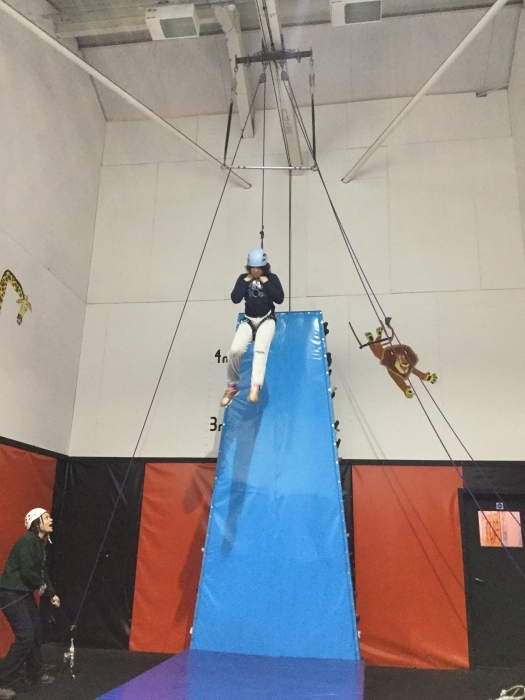 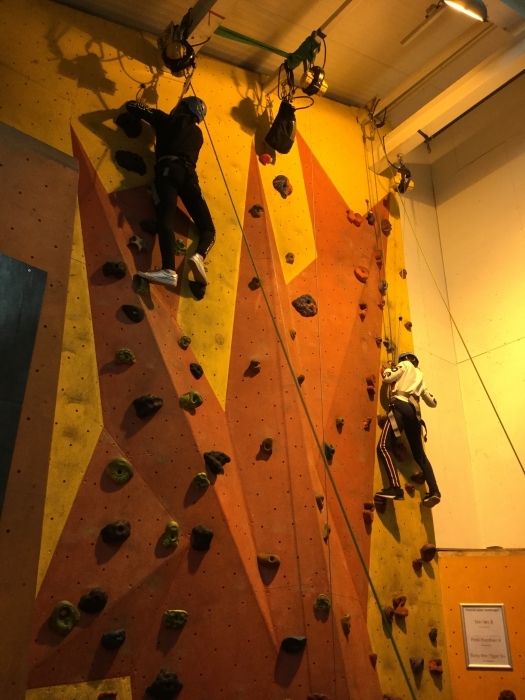 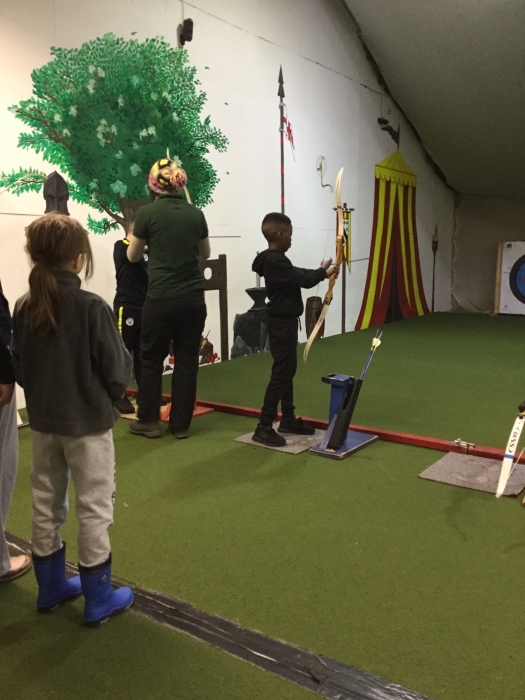 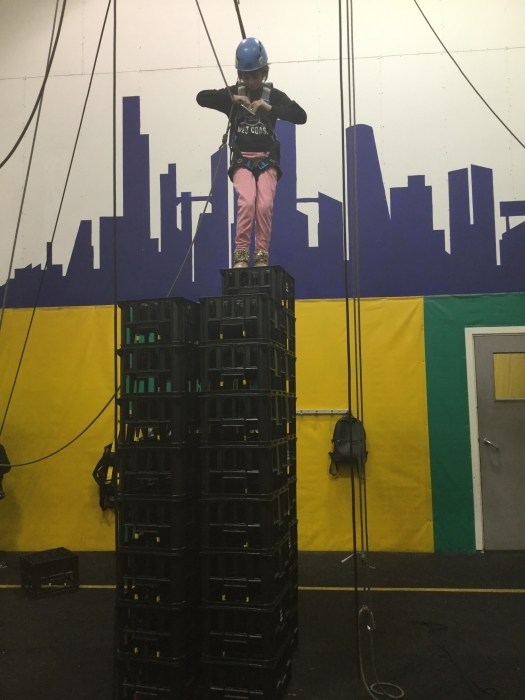 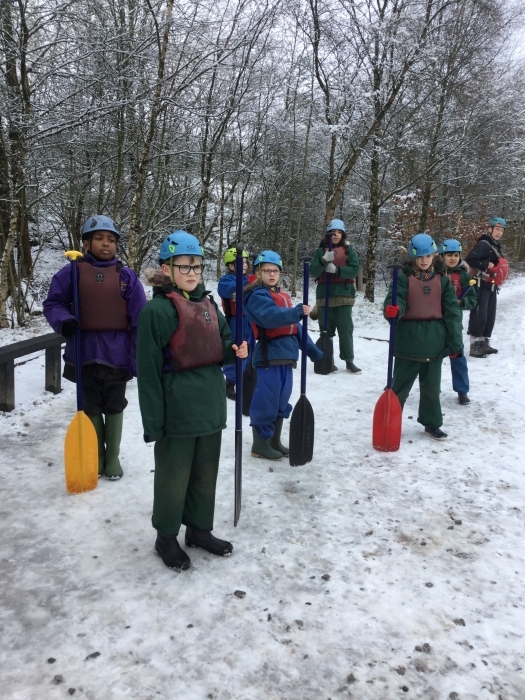 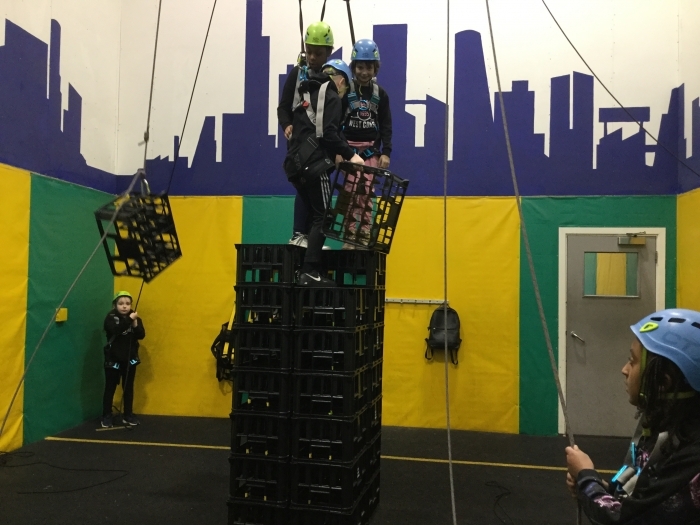 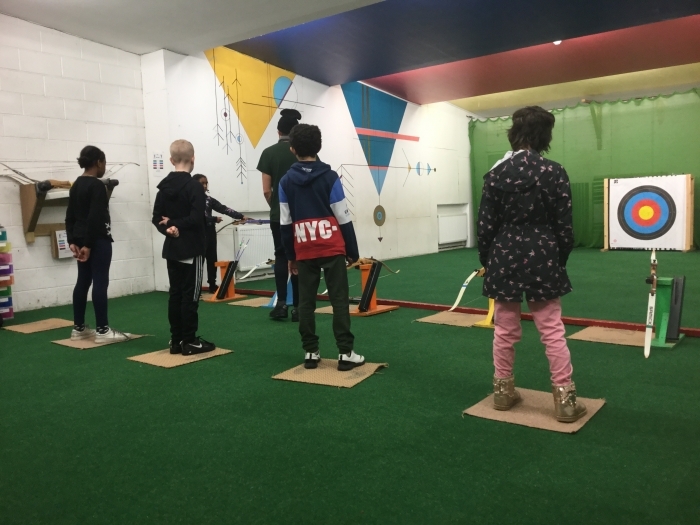 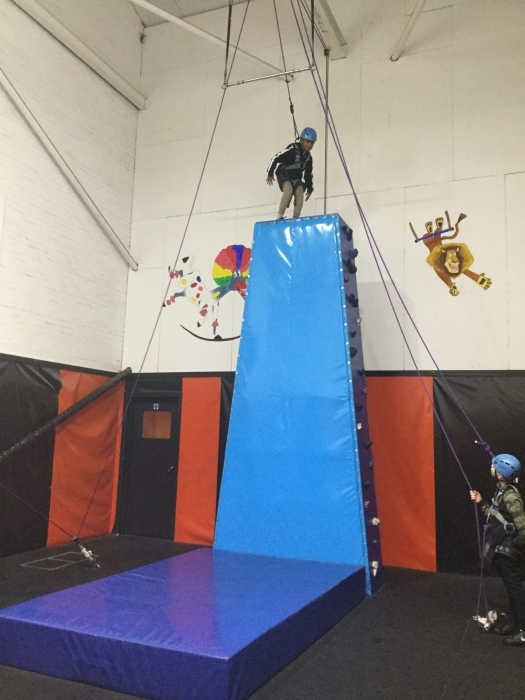 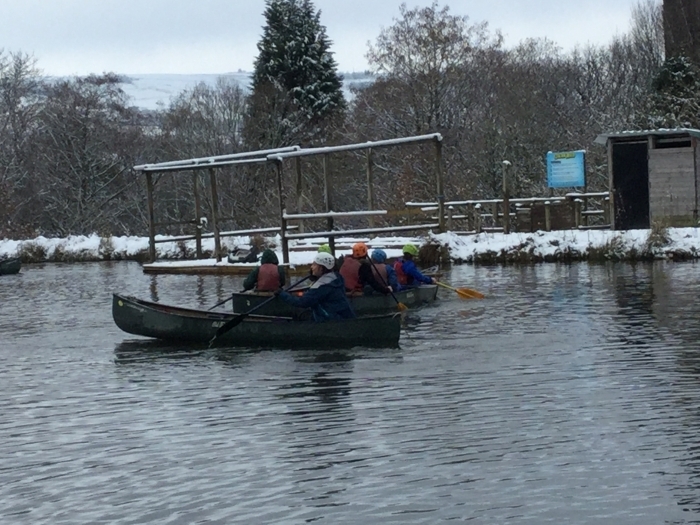 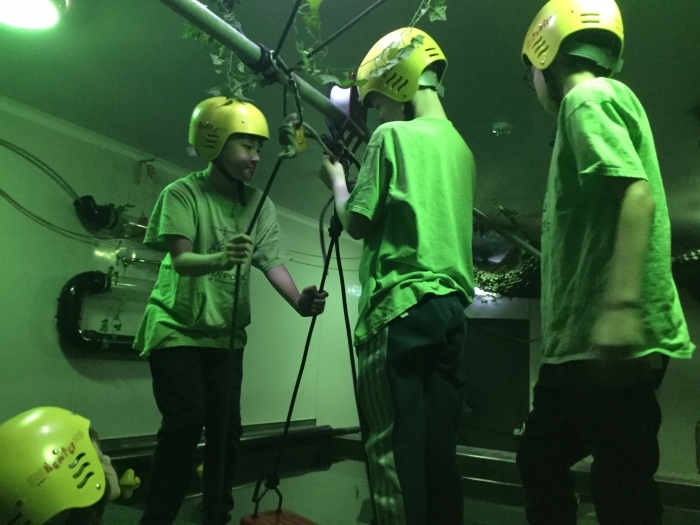 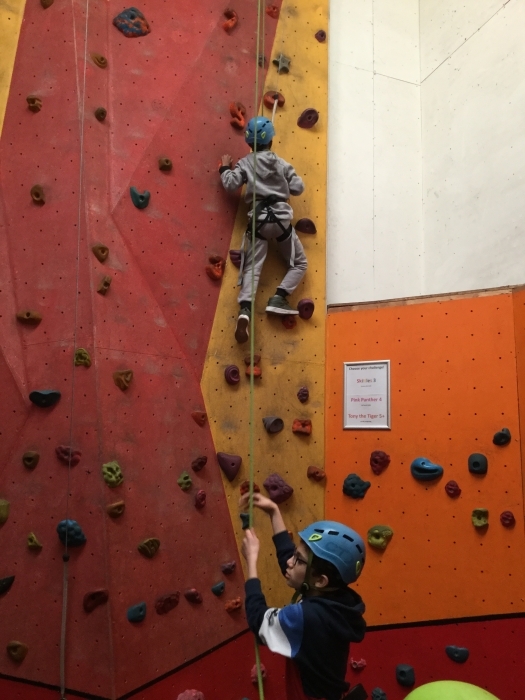 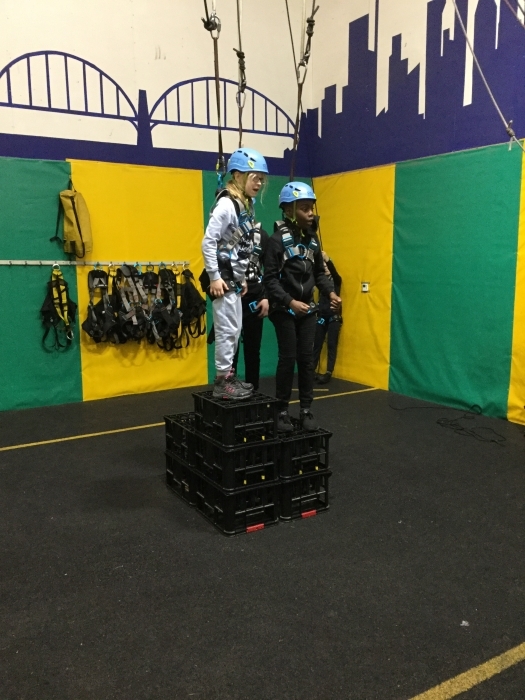 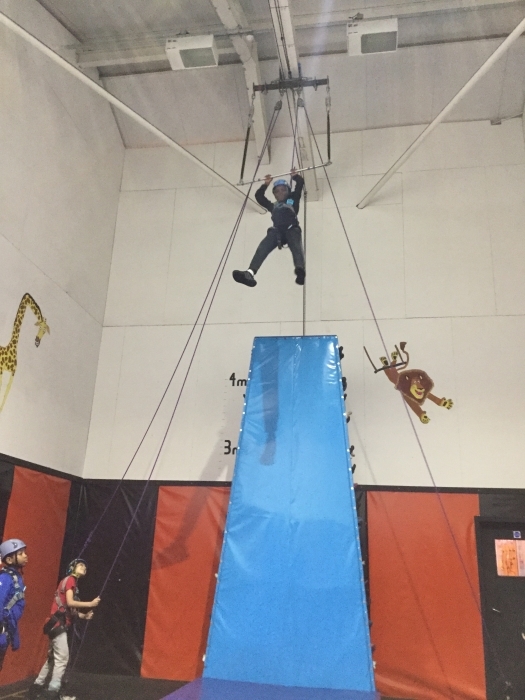 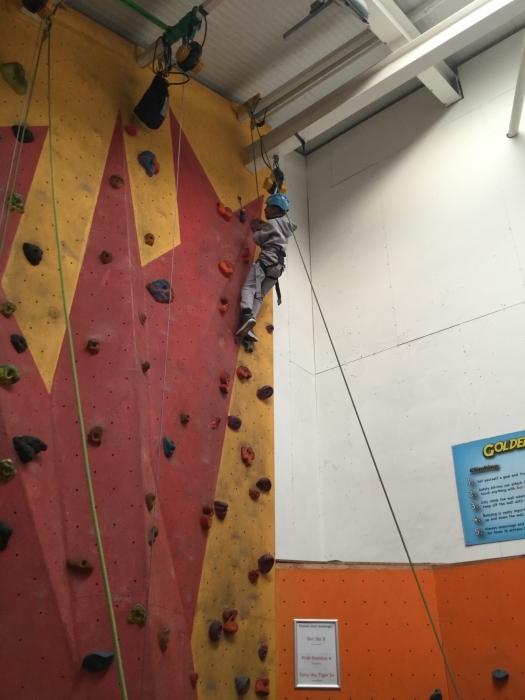 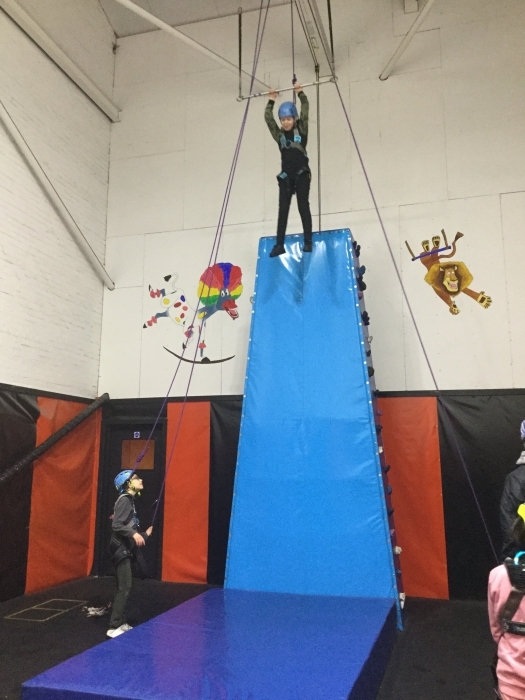 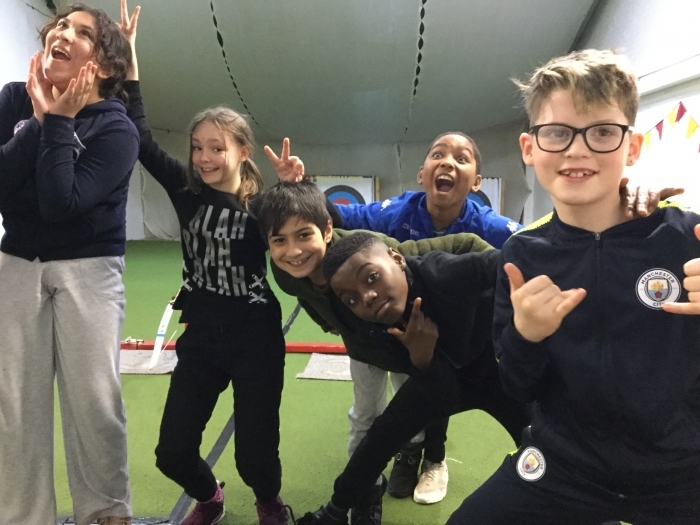 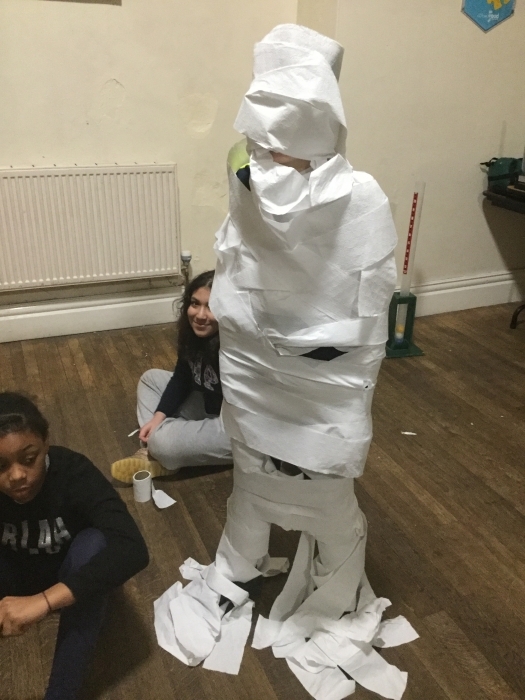 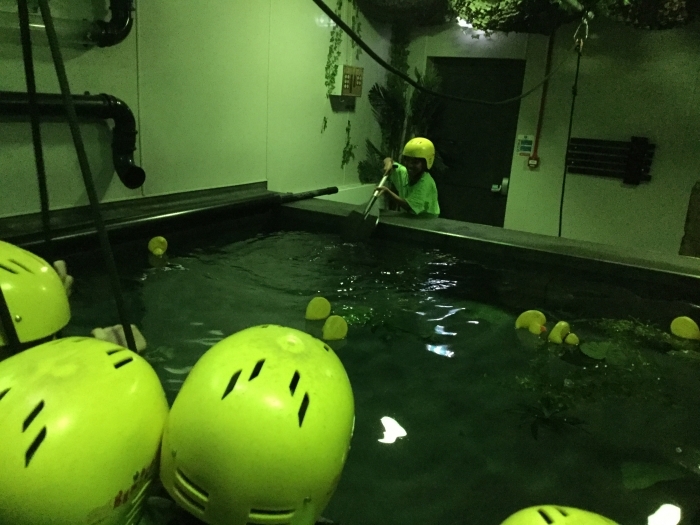 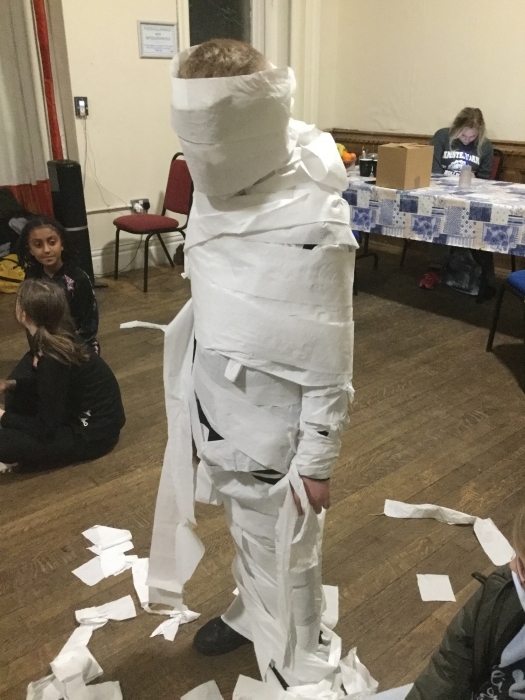 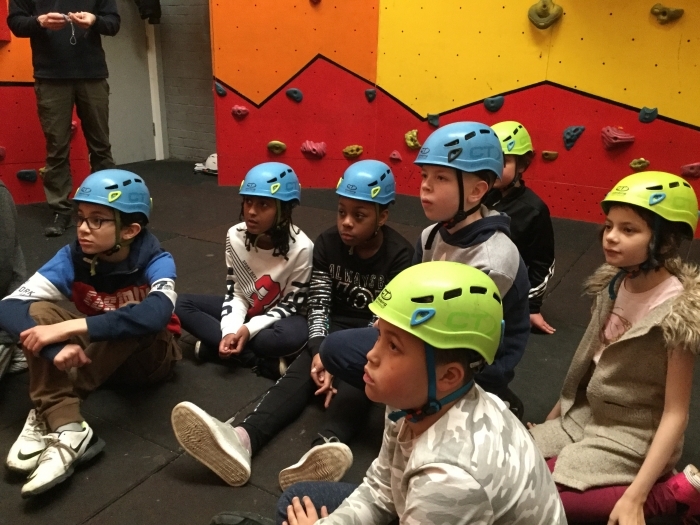 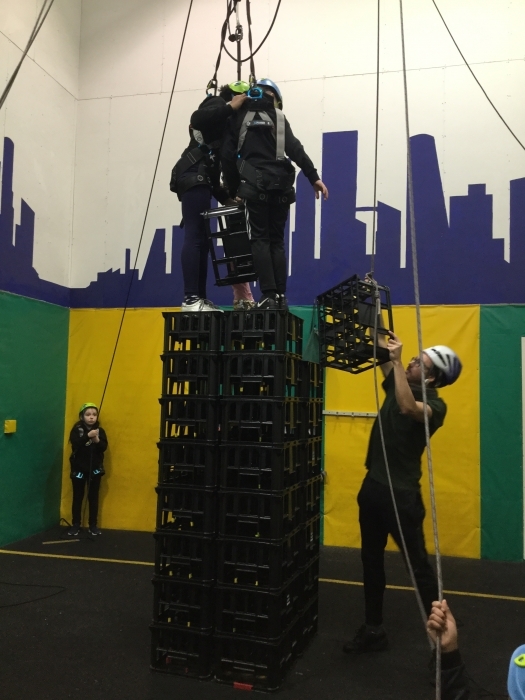 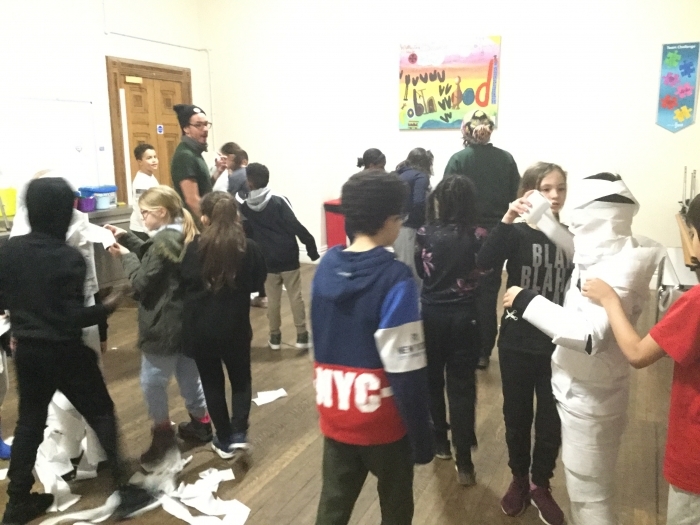 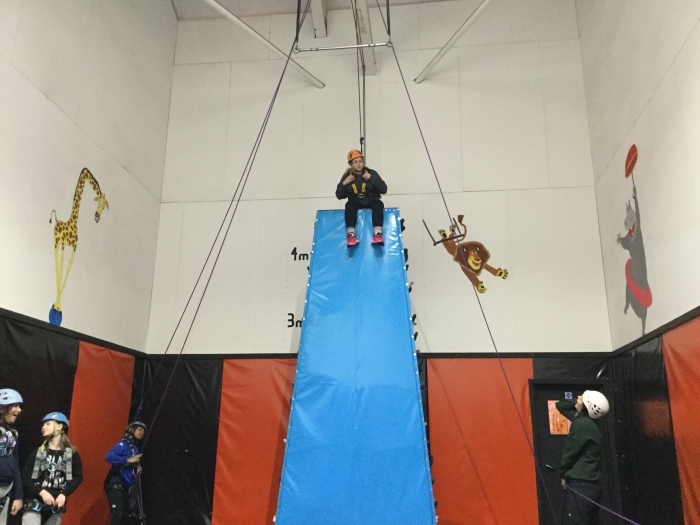 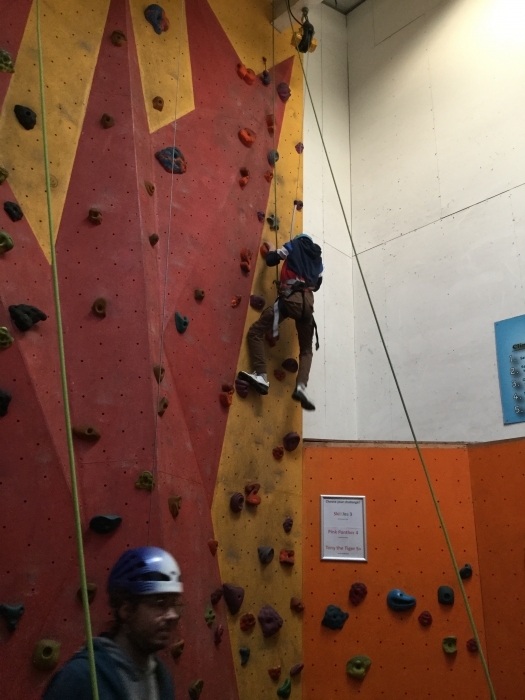 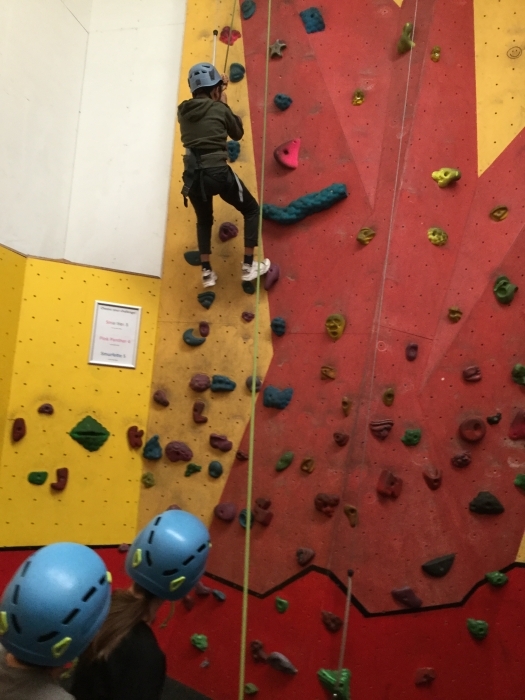 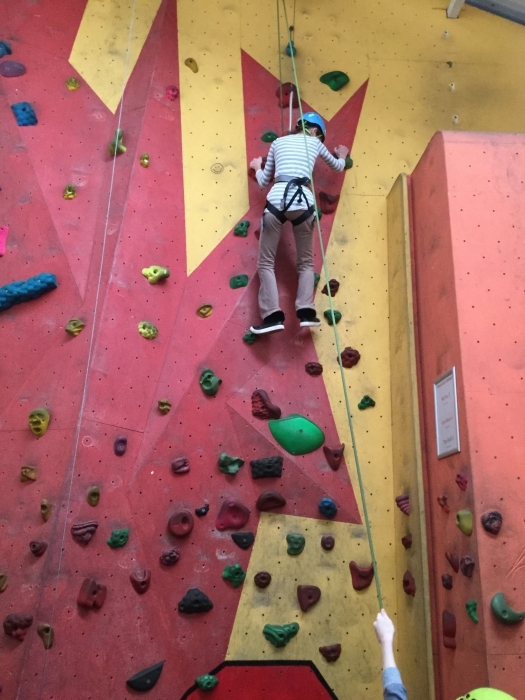 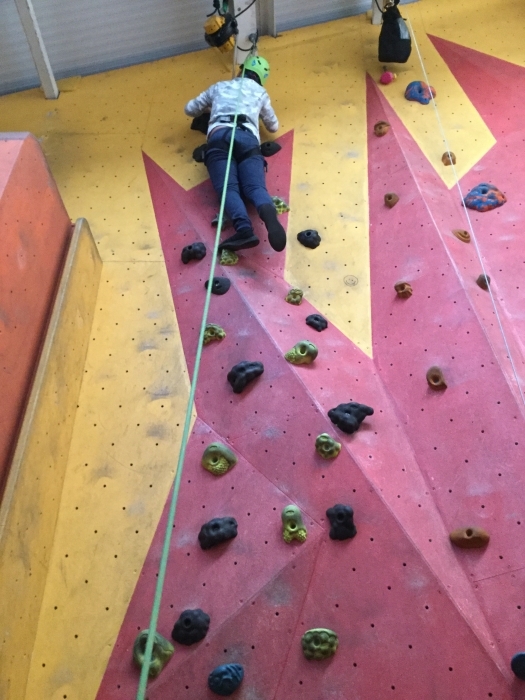 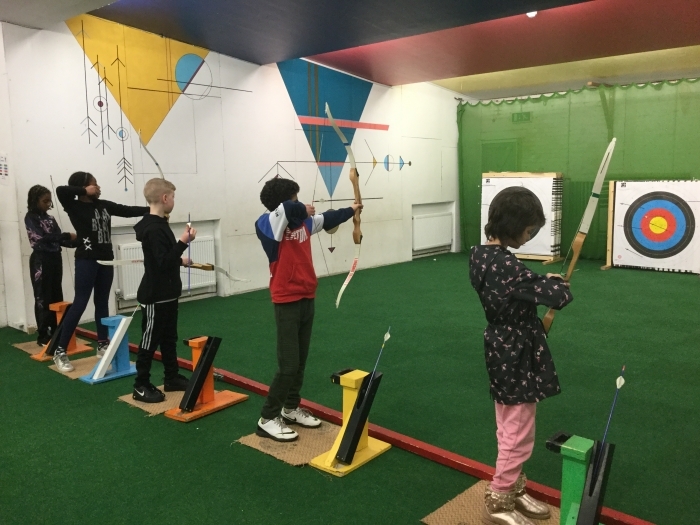 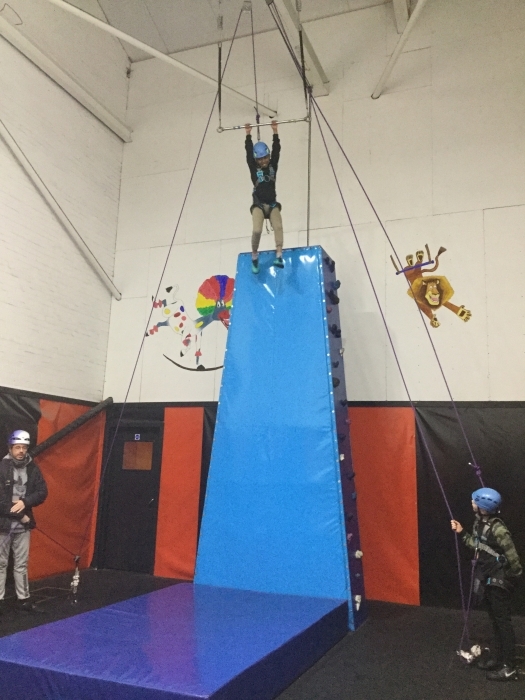 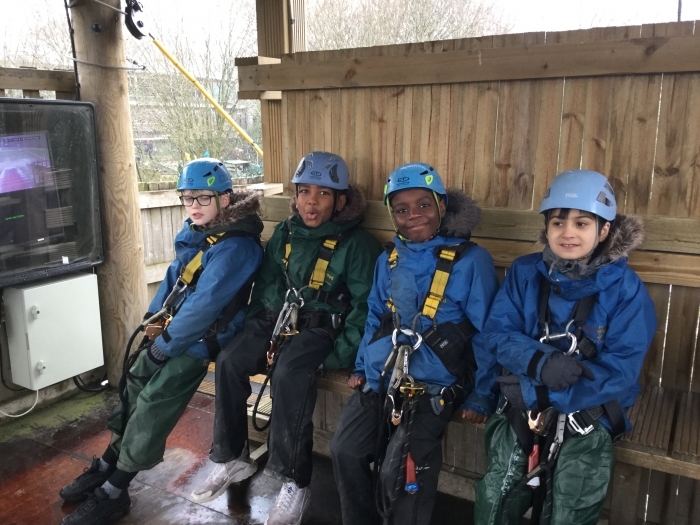 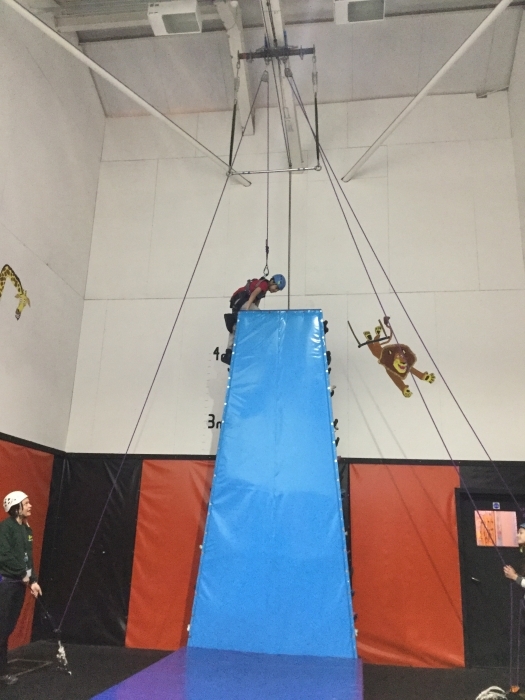 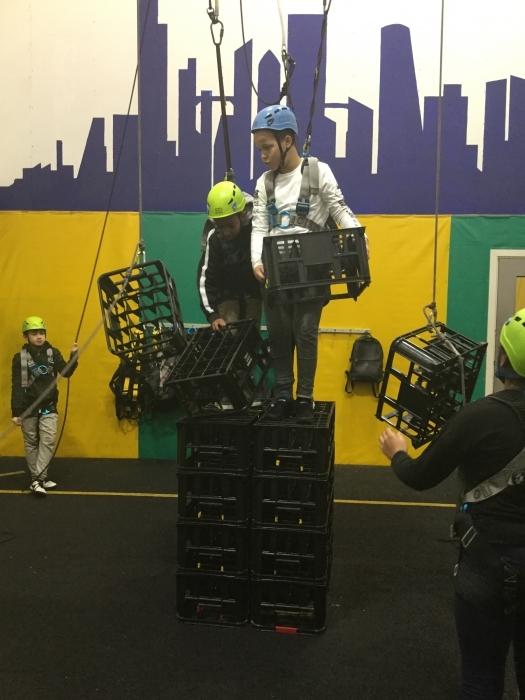 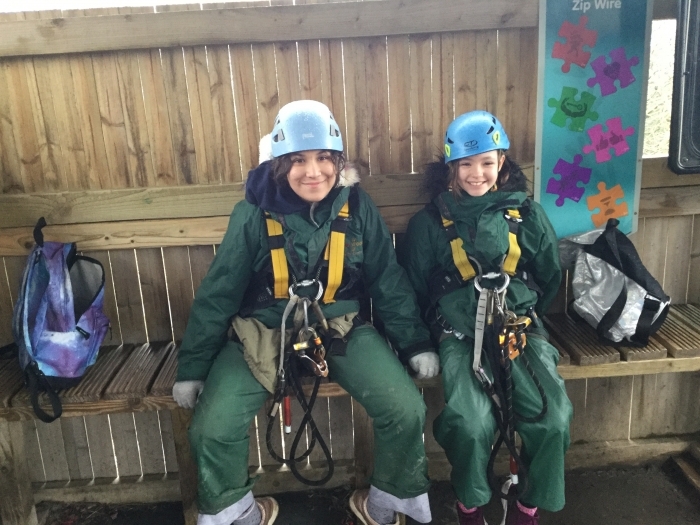 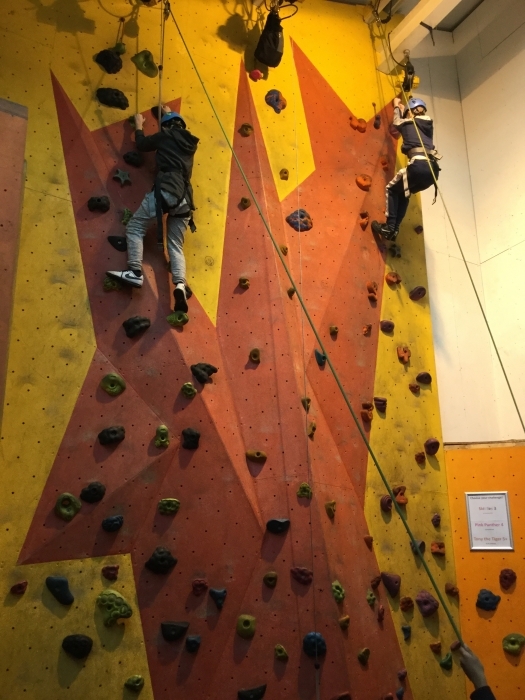 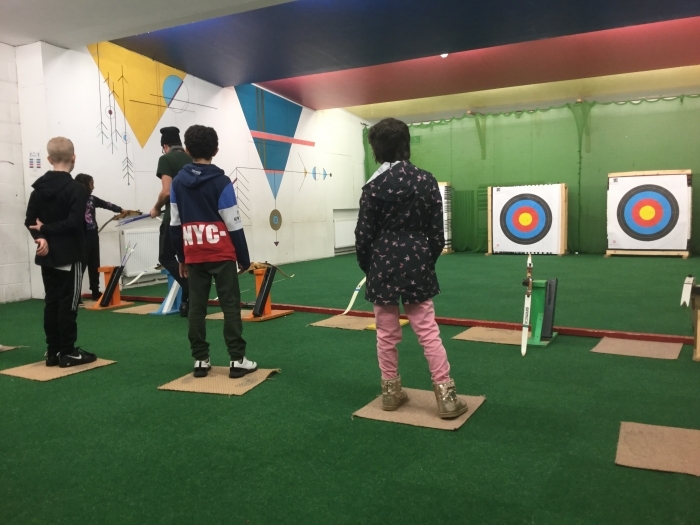 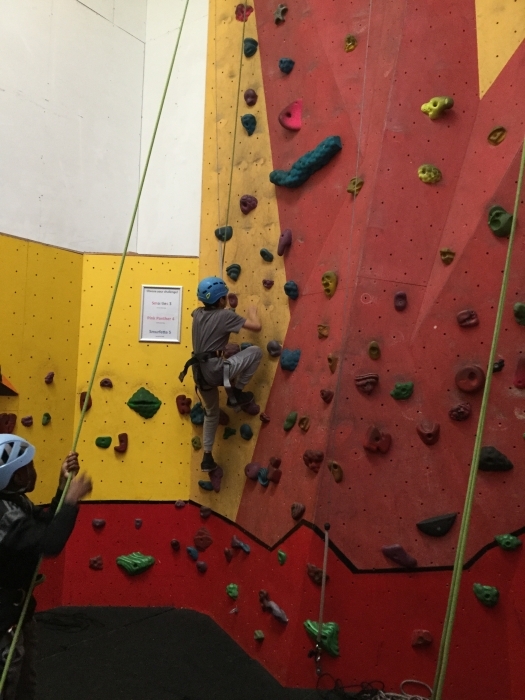 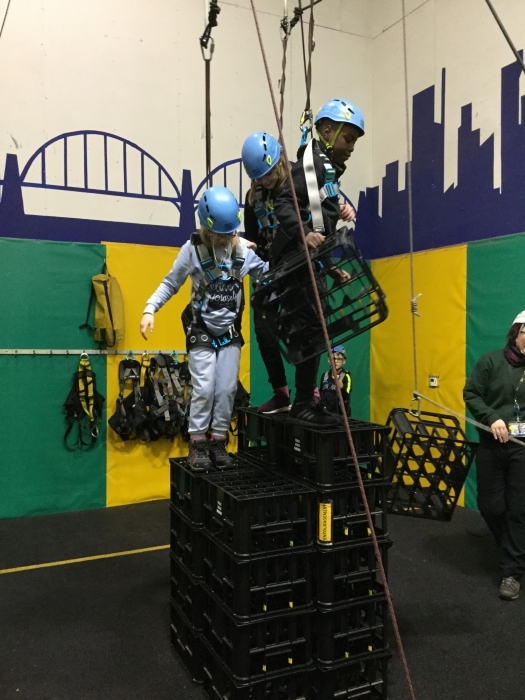 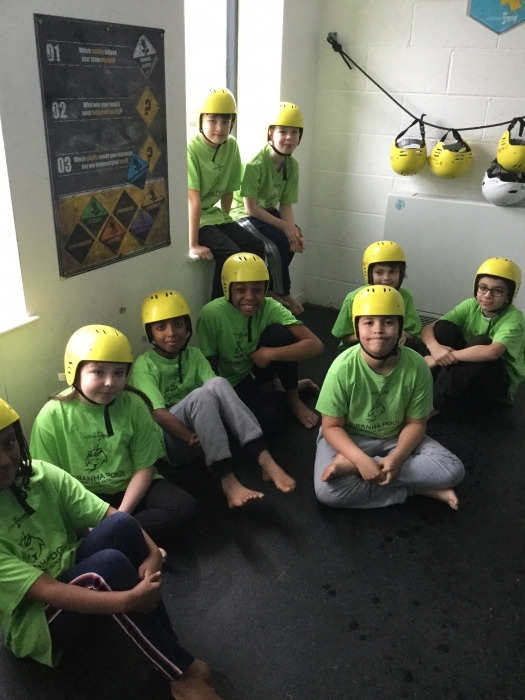 We had an absolutely fantastic time and took part in an amazing range of activities including: canoeing, rock climbing, trapeze, knights quest, caving, escape room and piranha pool! 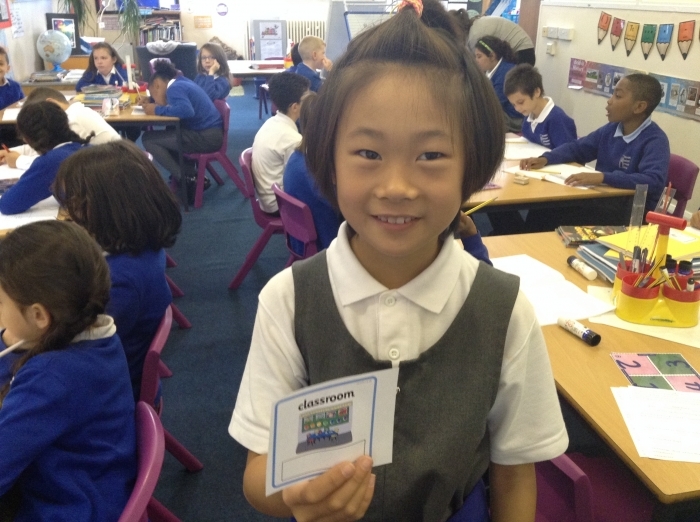 In our Reading lessons, we were looking at how to prepare poems to read aloud and to perform. 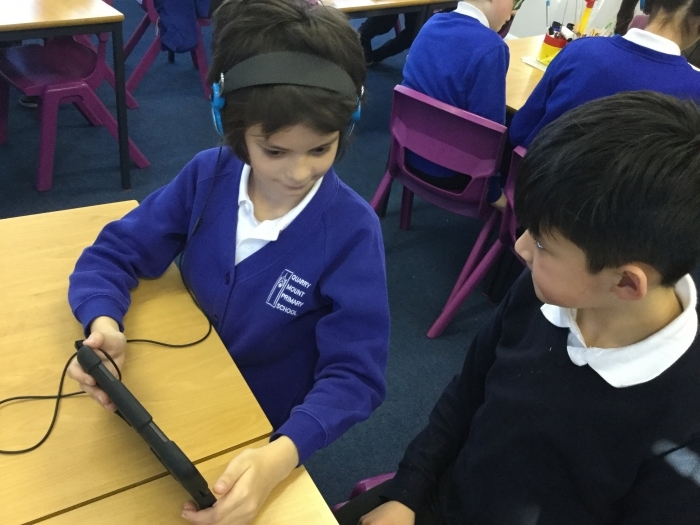 We chose "The Sound Collector" by Roger McGough. 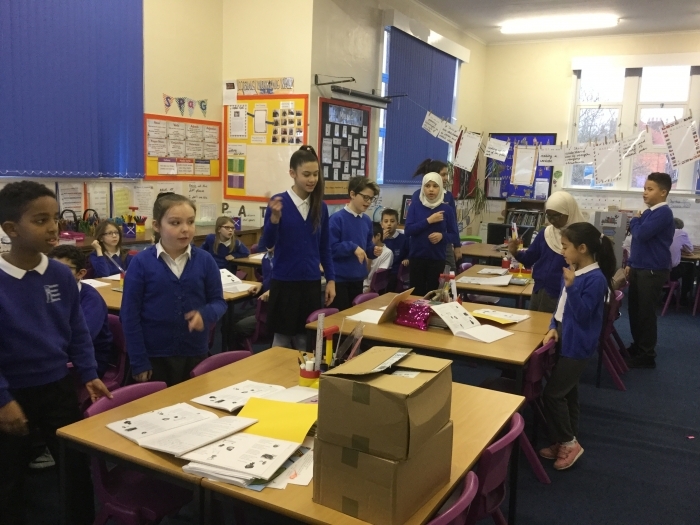 In small groups & pairs, we practised the poem and created sounds and actions to match the different lines. 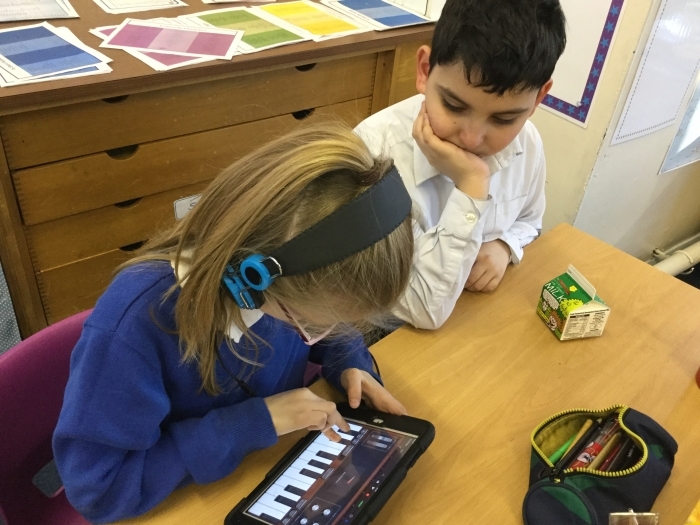 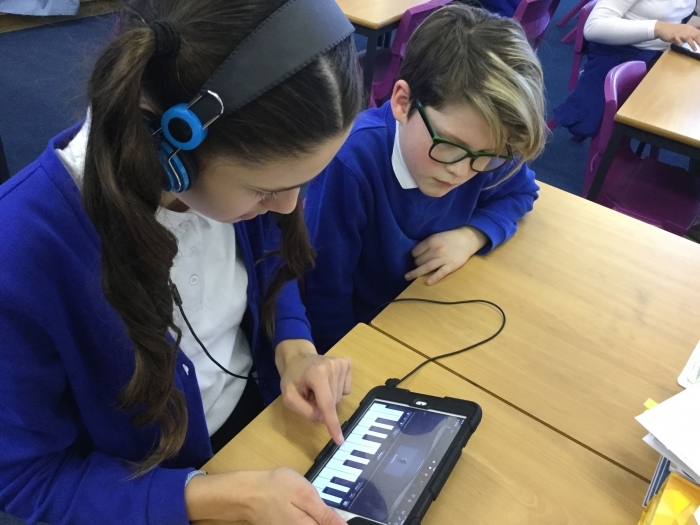 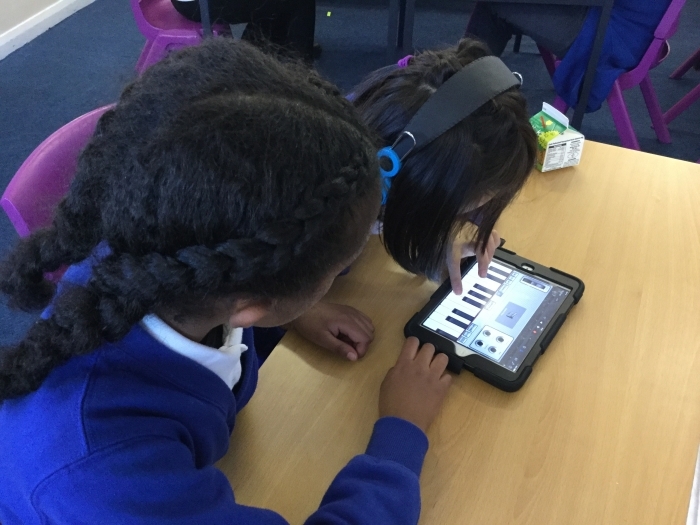 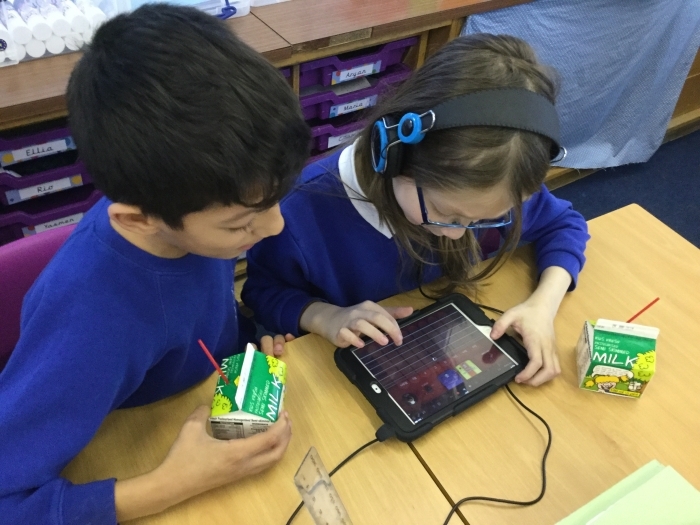 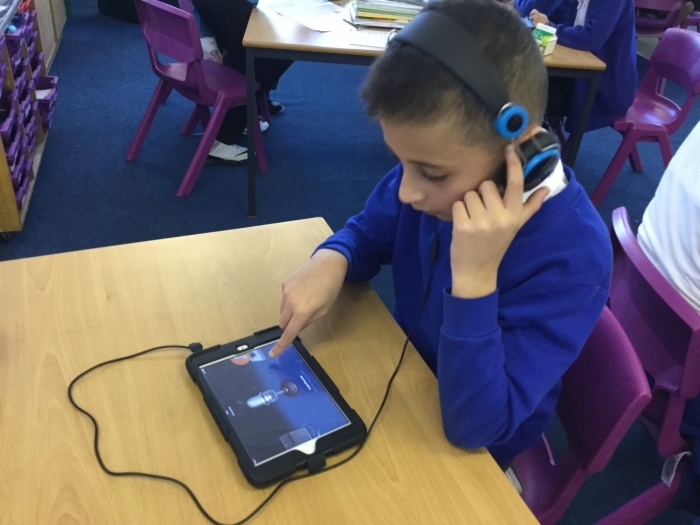 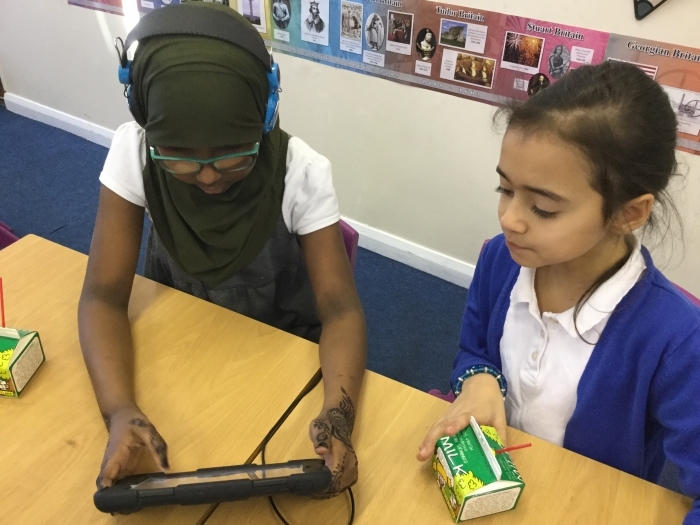 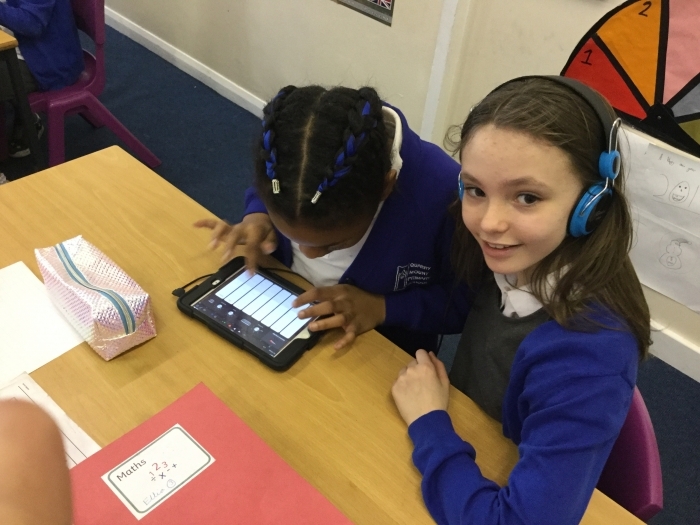 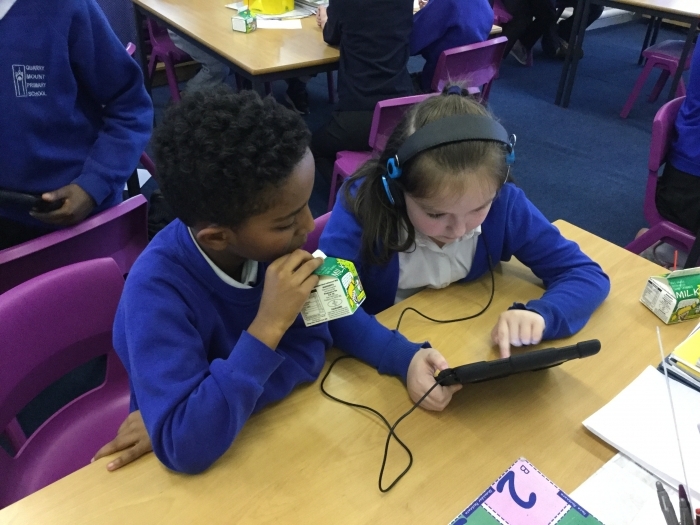 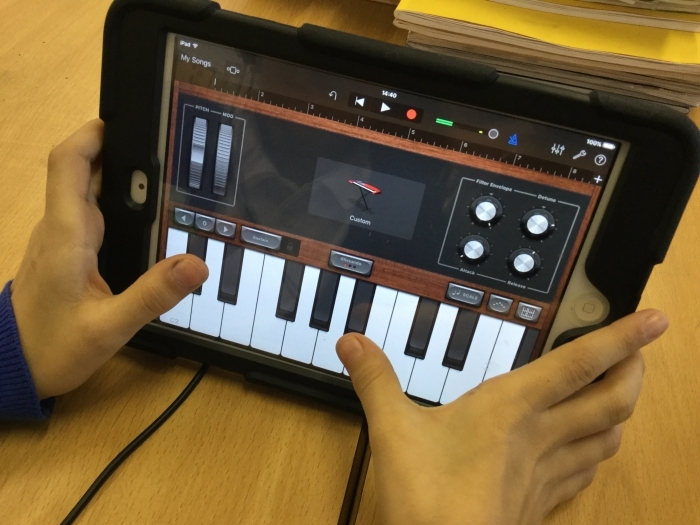 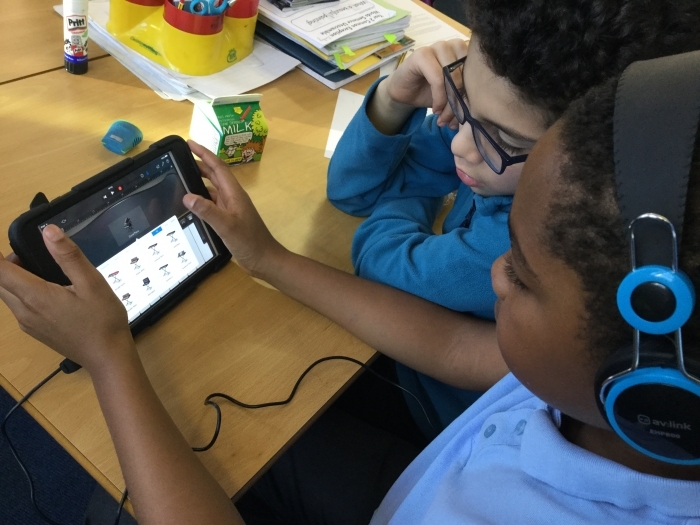 For our Computing lessons this half term, we are getting to grips with the app "Garage Band". 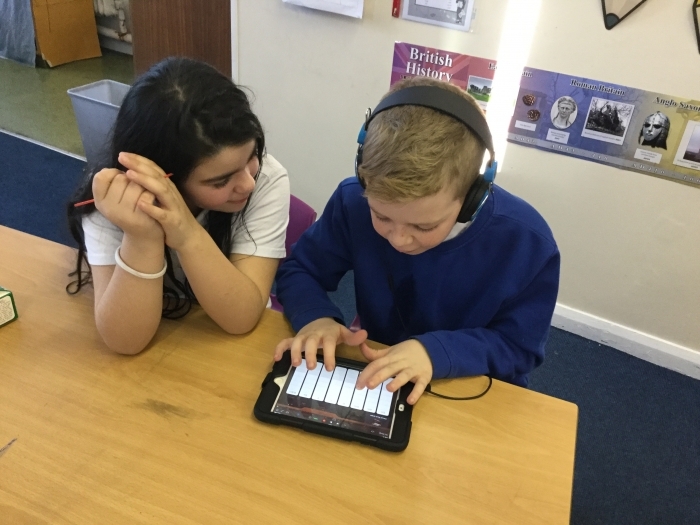 We have used it to listen to the sounds made by a variety of instruments and had a go at making some beats of our own. 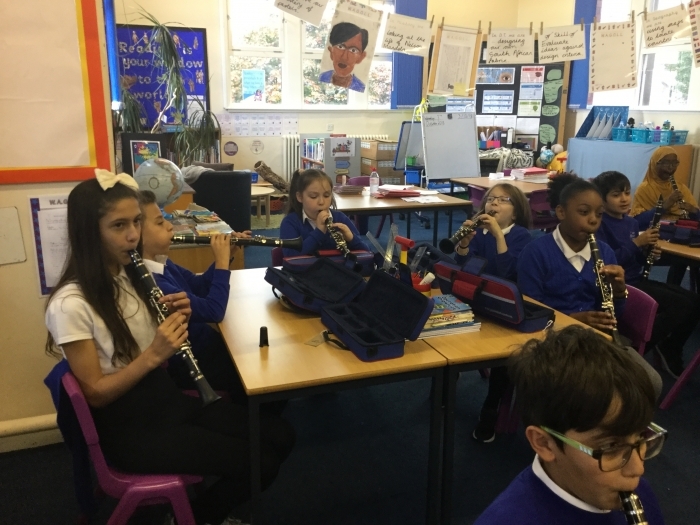 We are aiming to create a piece of music to match the characters from The Lion, The Witch and The Wardrobe (as this is our current class reading book). 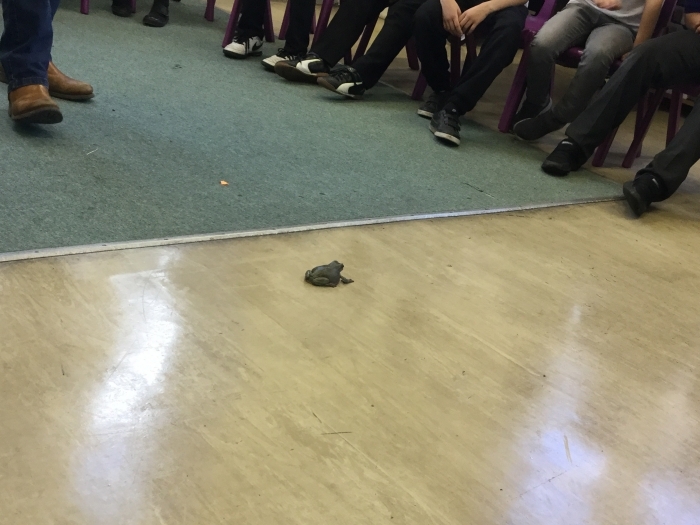 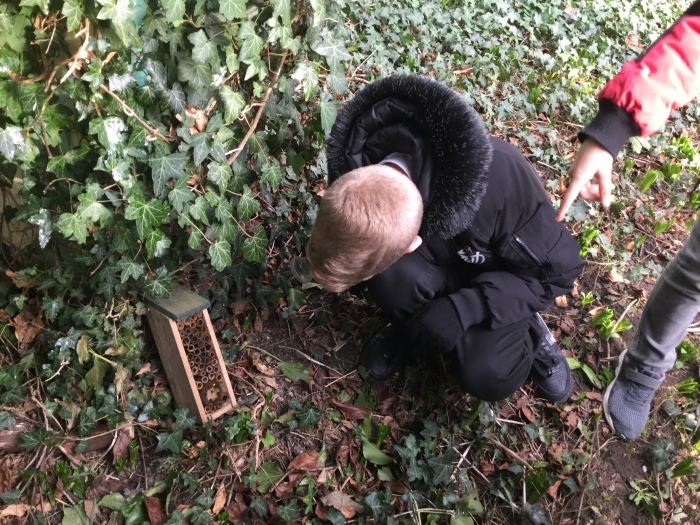 In our Bio Blitz Science workshop, we looked at the birds and minibeasts that could be found around the school. 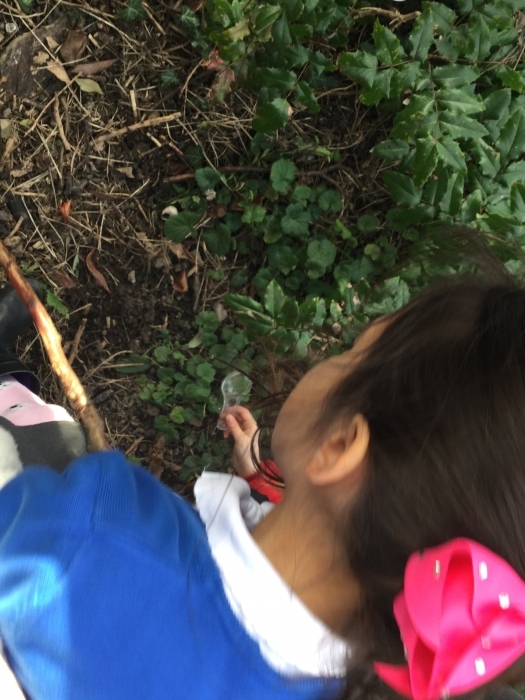 We managed to spot a variety of each, including: robins, ladybirds, earthworms and more! 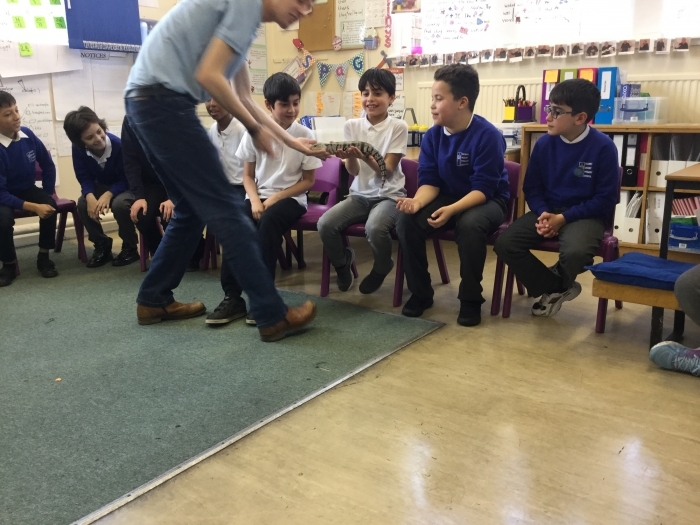 Our class reader this half term was Beowulf. 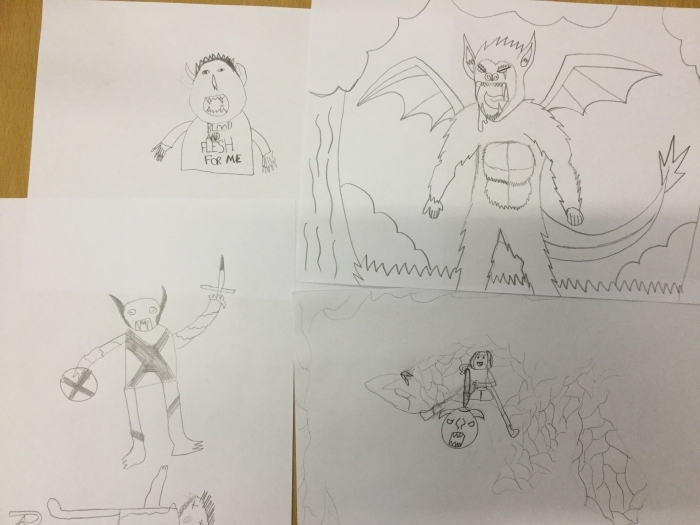 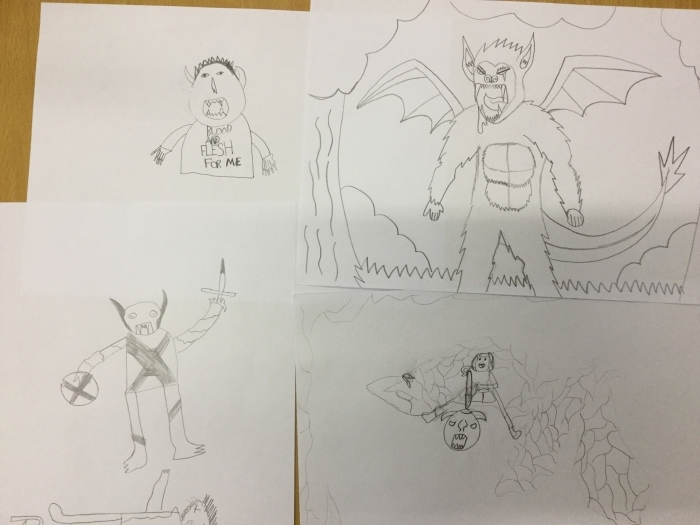 As part of our hook lesson, we created our own mythical creatures. 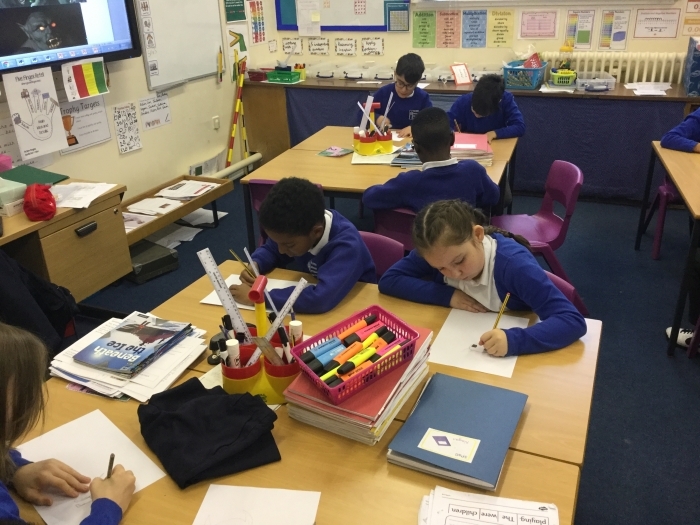 We really enjoyed reading Beowulf and writing our own newspaper reports about him. 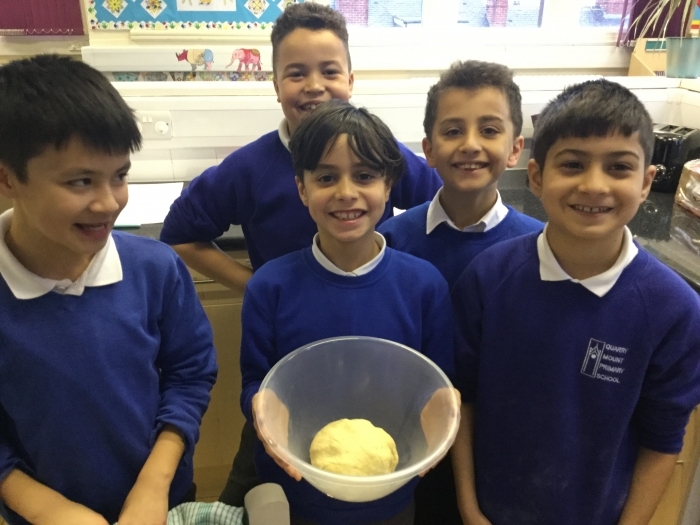 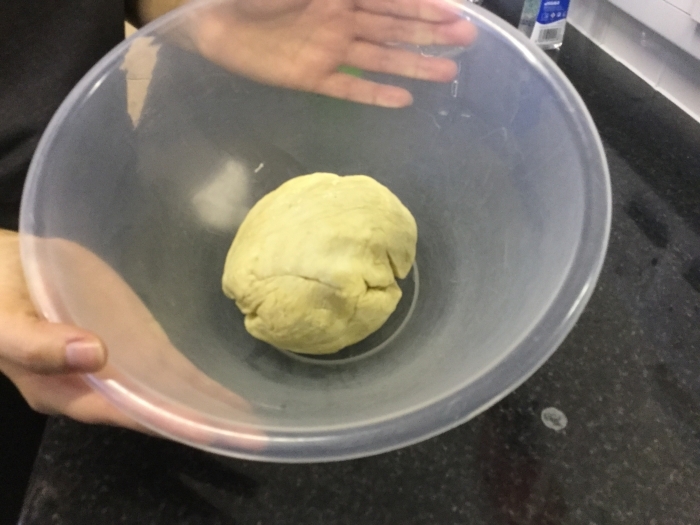 For our D.T work this half term, we baked loaves of bread. 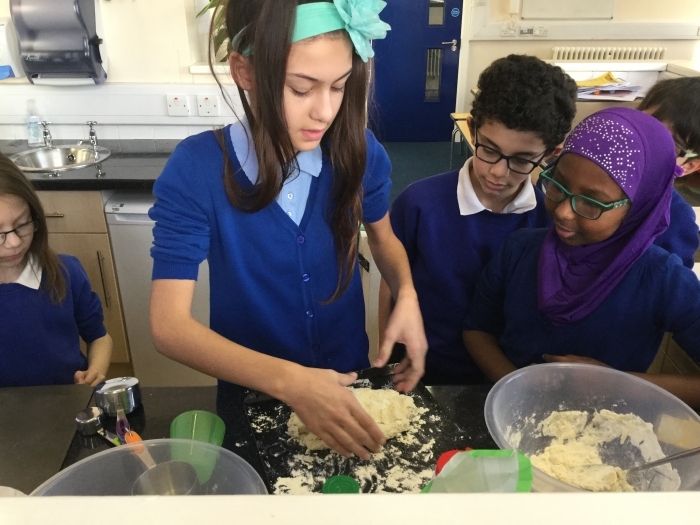 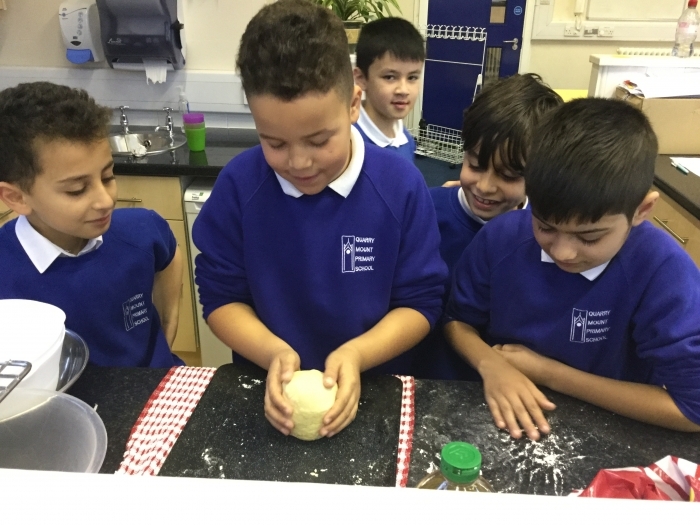 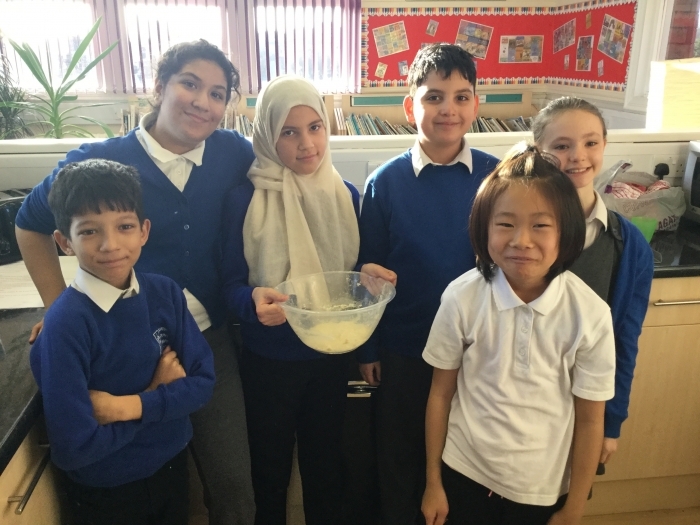 We learned about food hygiene, weighing ingredients accurately and oven safety. 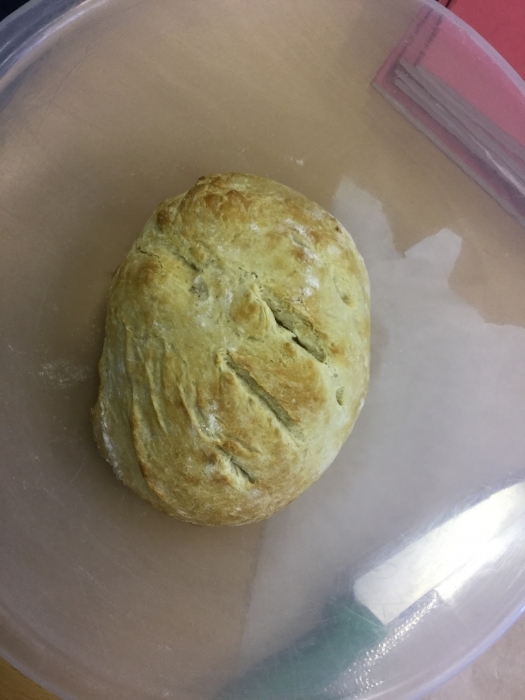 We tasted out bread at the end and it was delicious! 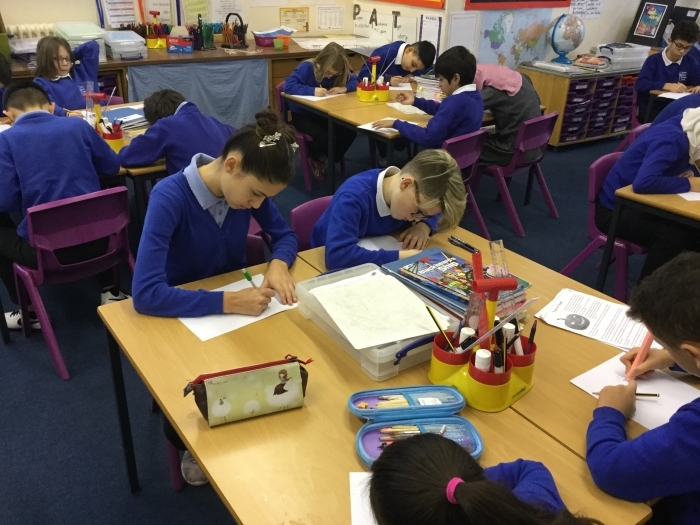 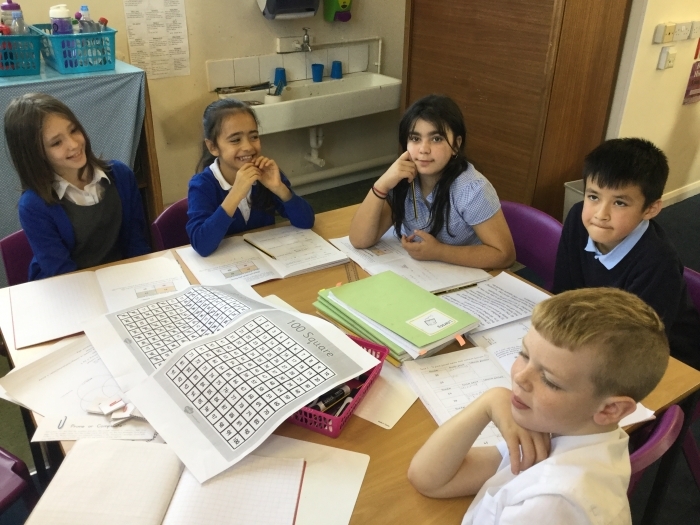 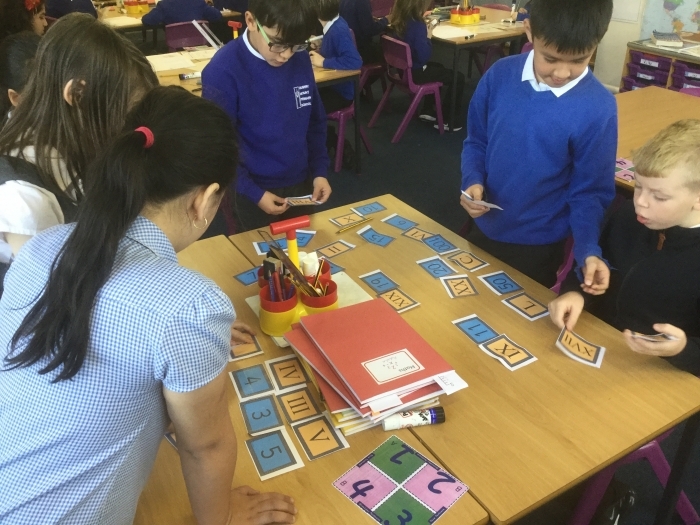 In Year 5, we always try our best. 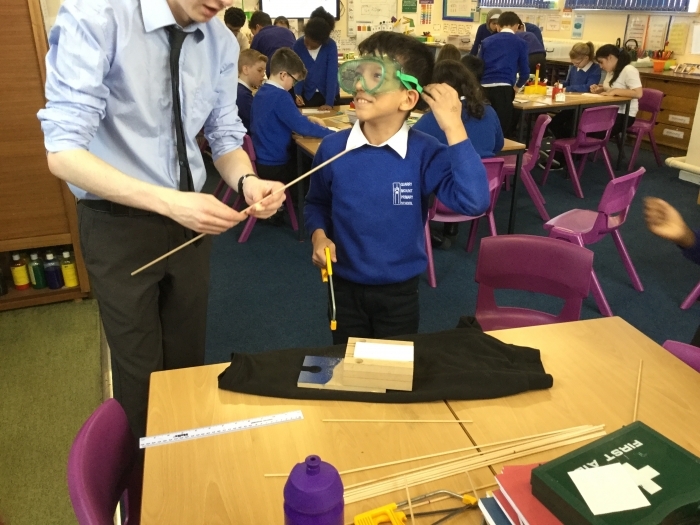 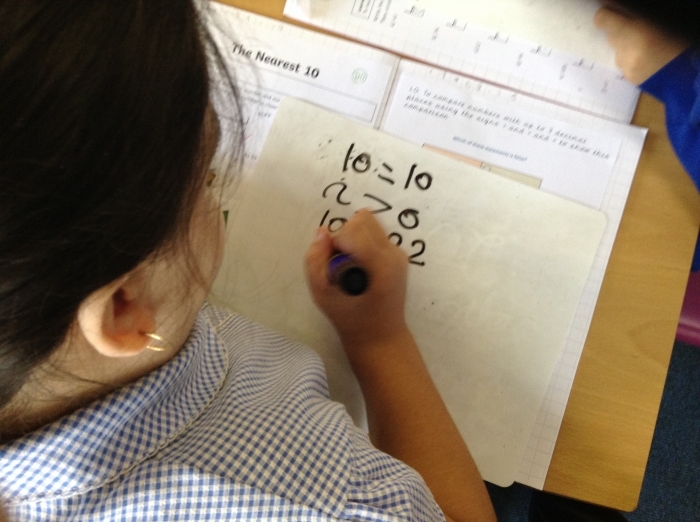 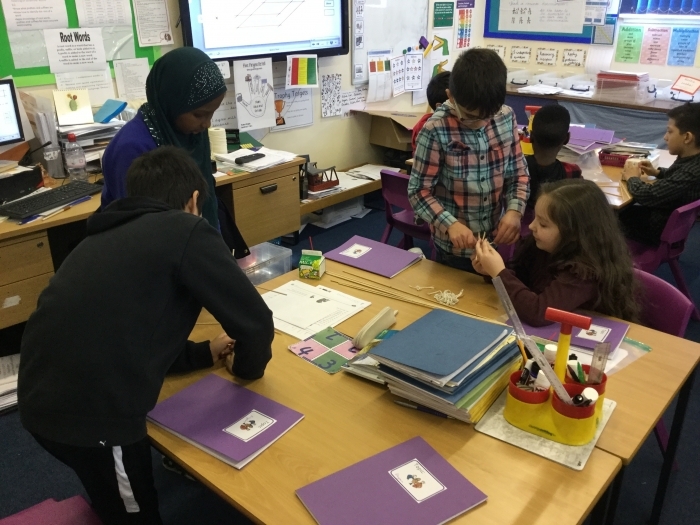 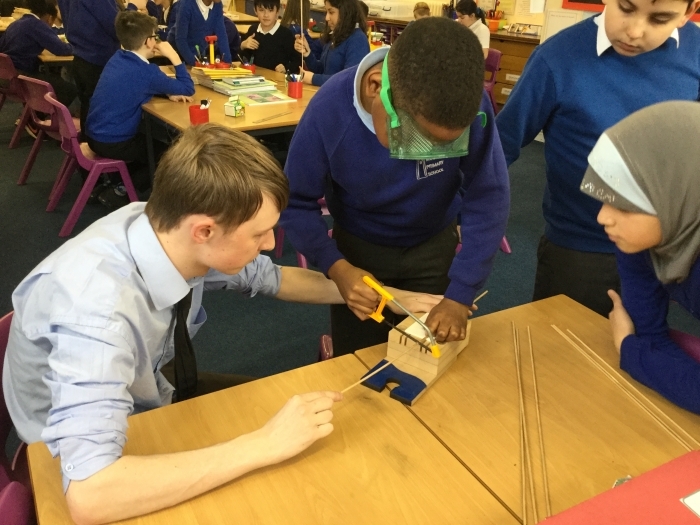 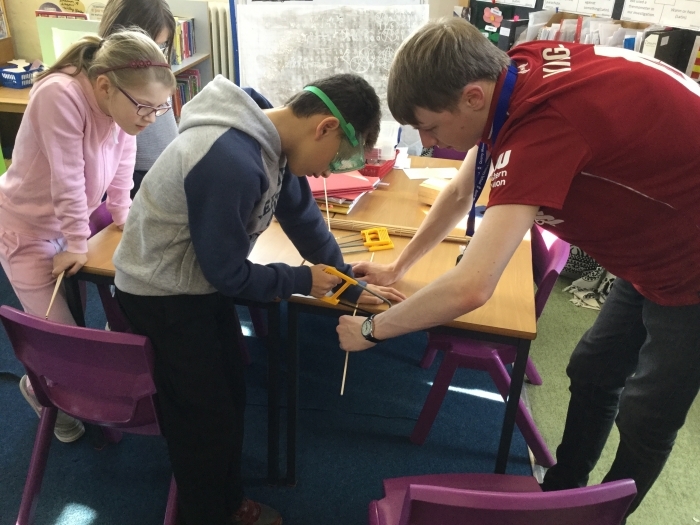 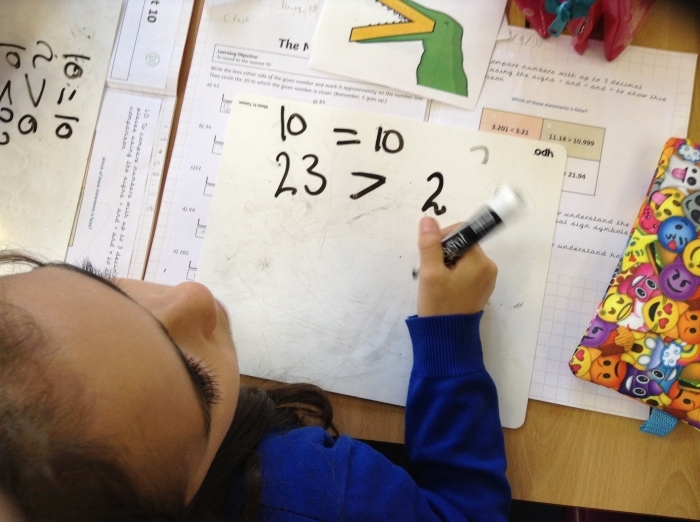 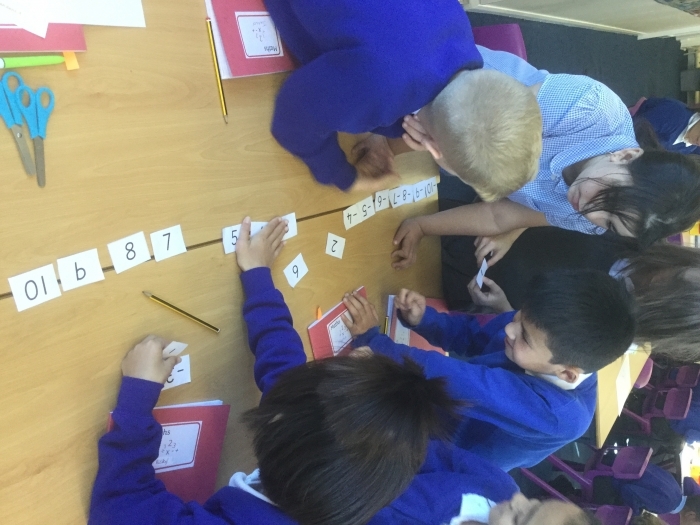 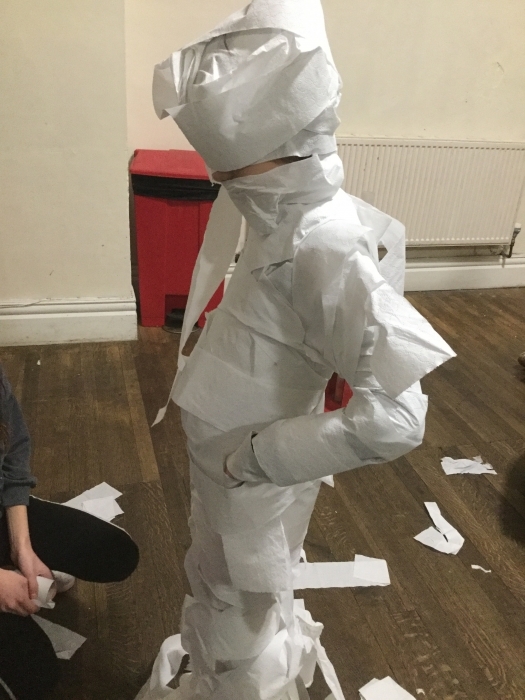 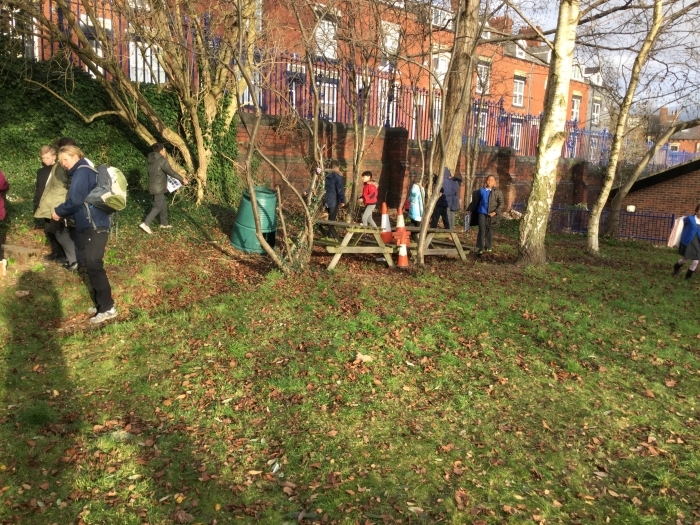 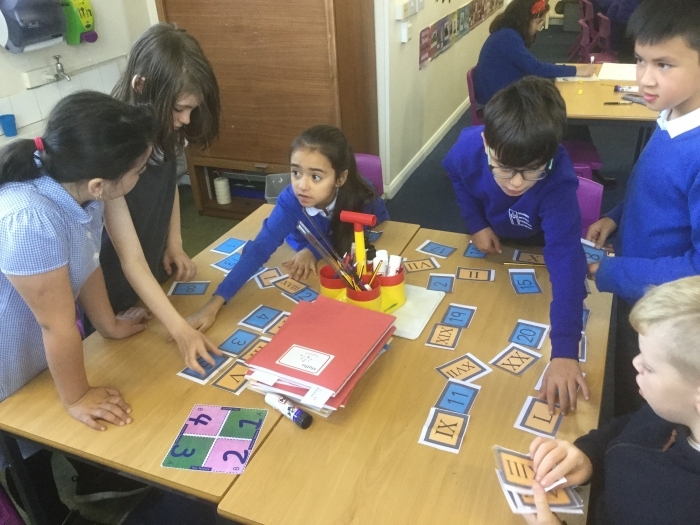 Here are some photos of doing some fantastic work from this half term. 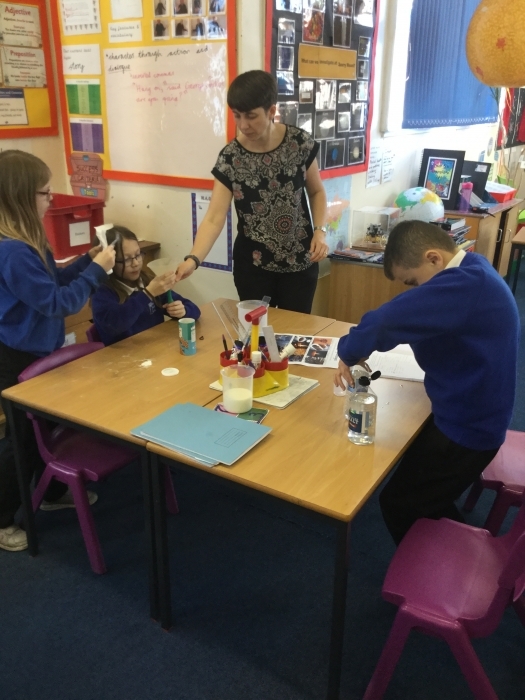 We love doing Science work with Mrs Smith. 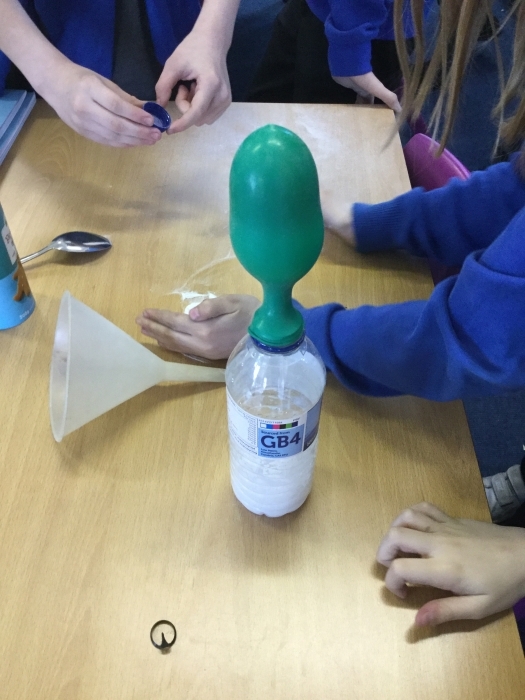 Here are some photographs from one of our many fantastic experiments. 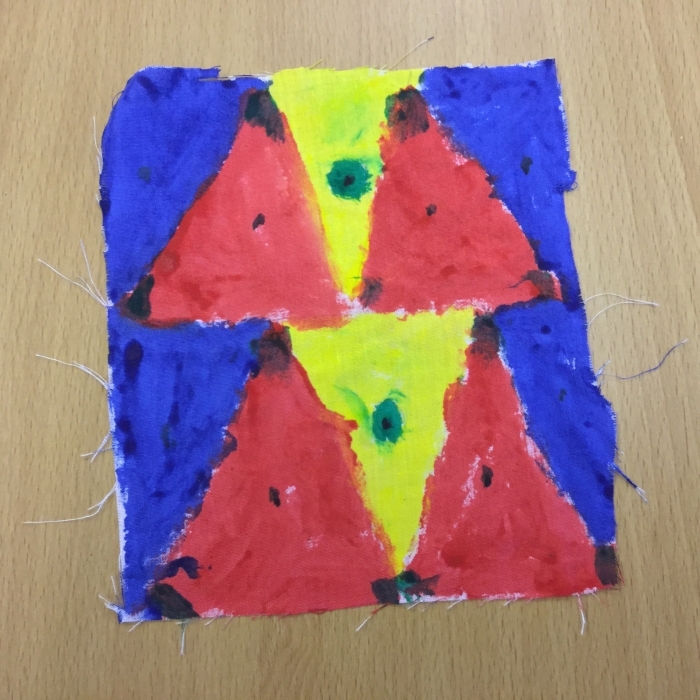 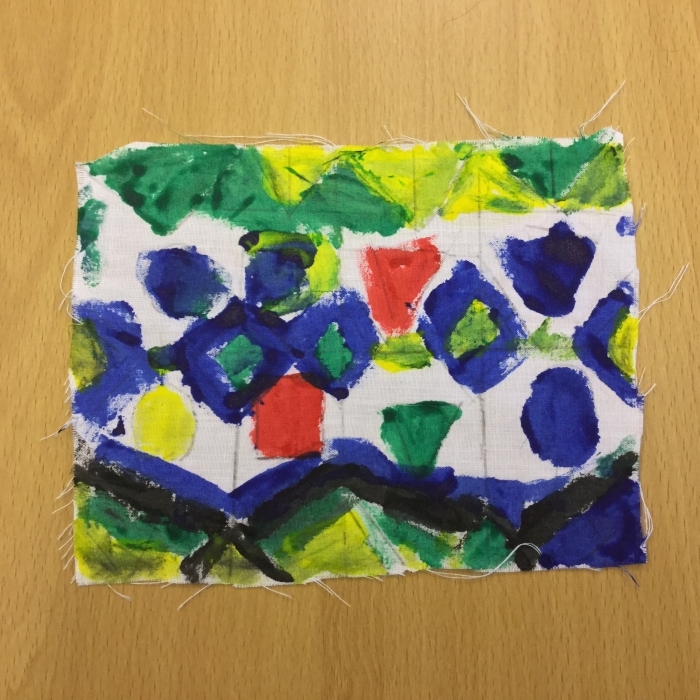 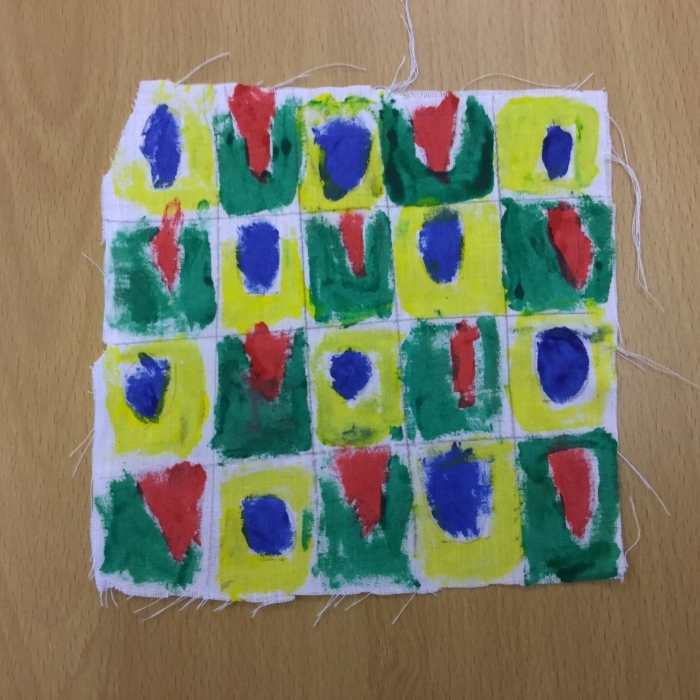 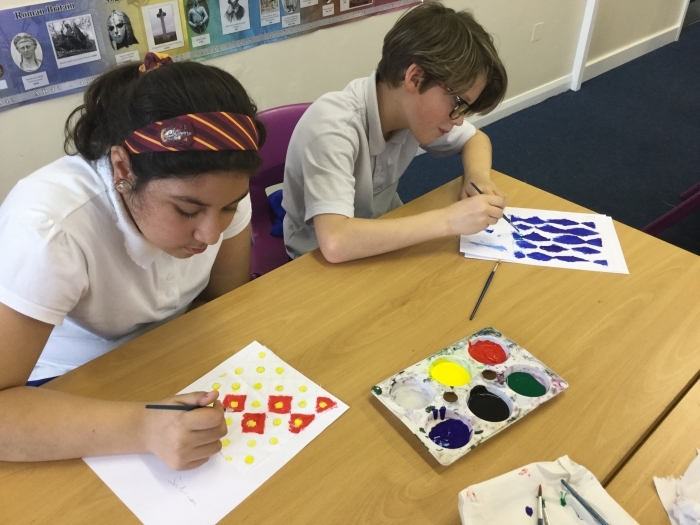 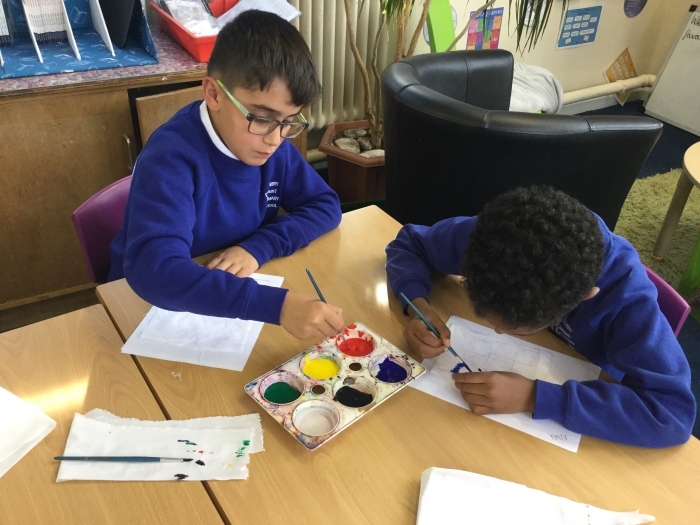 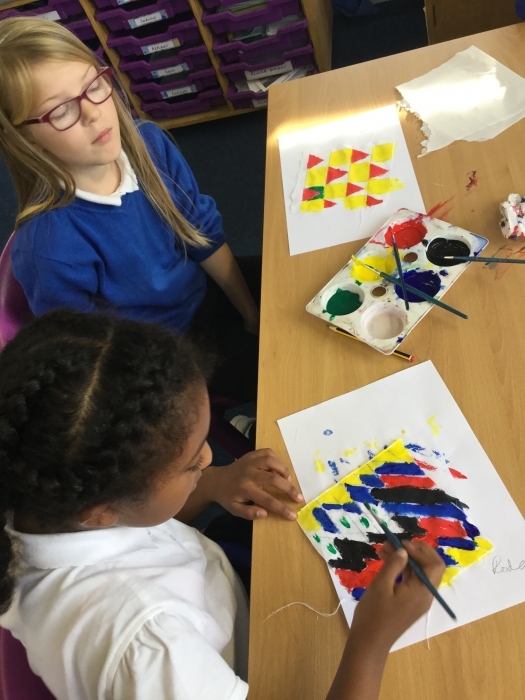 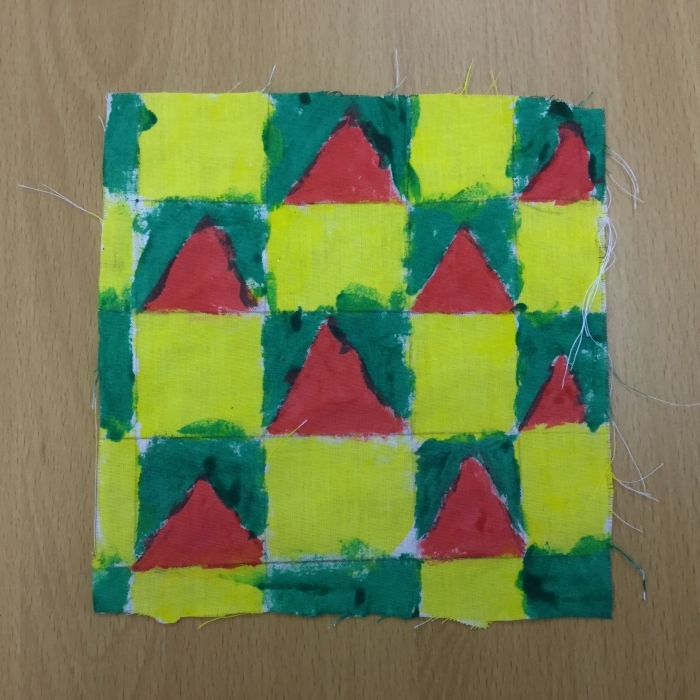 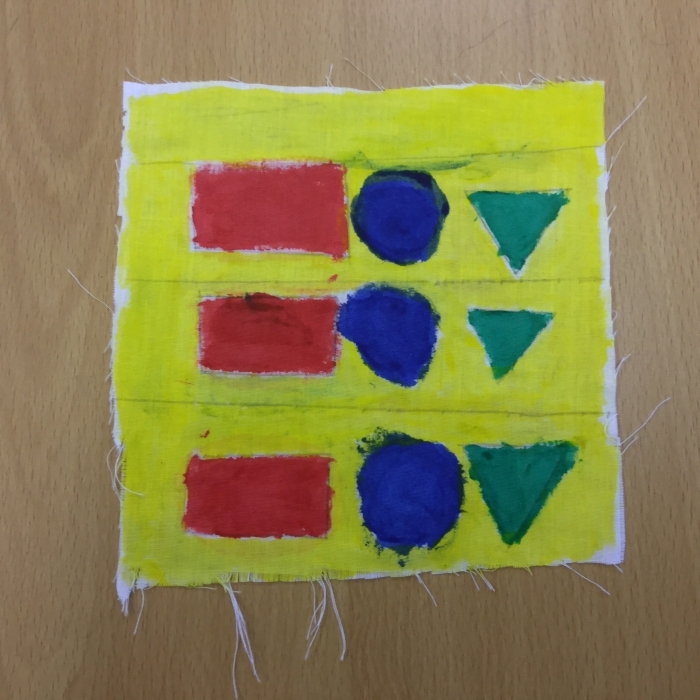 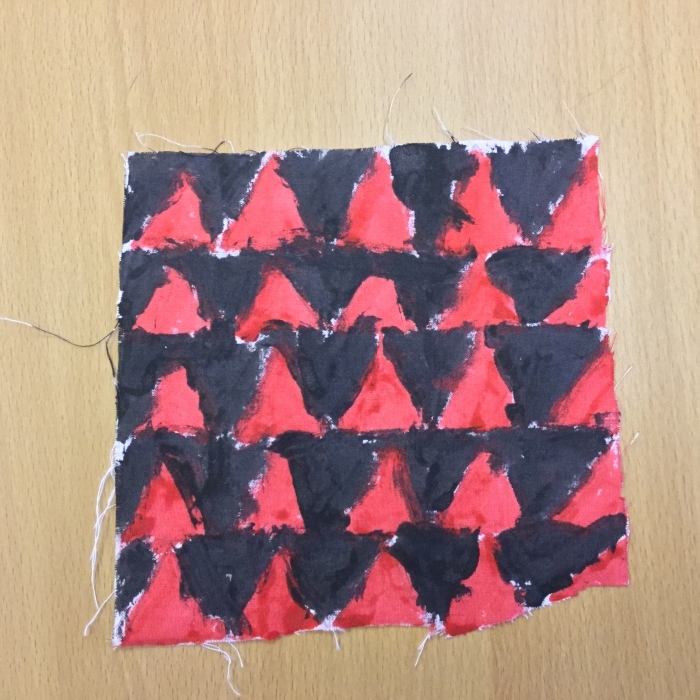 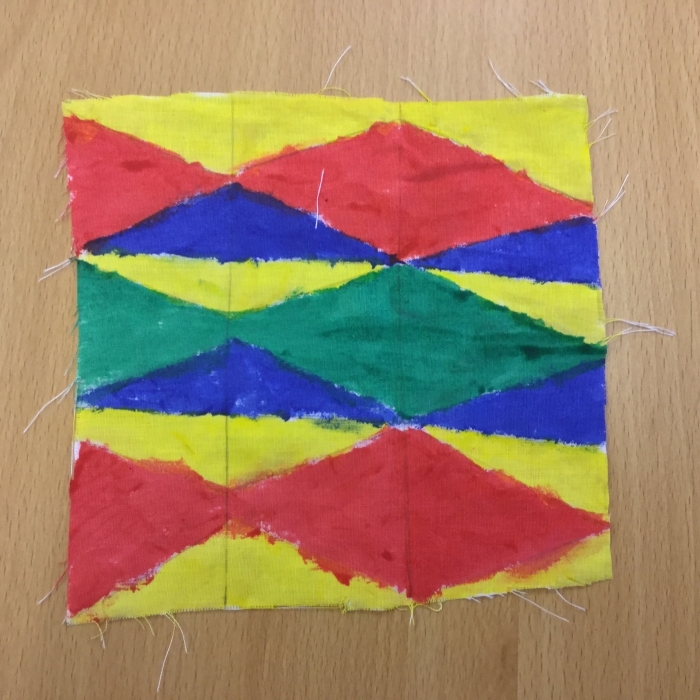 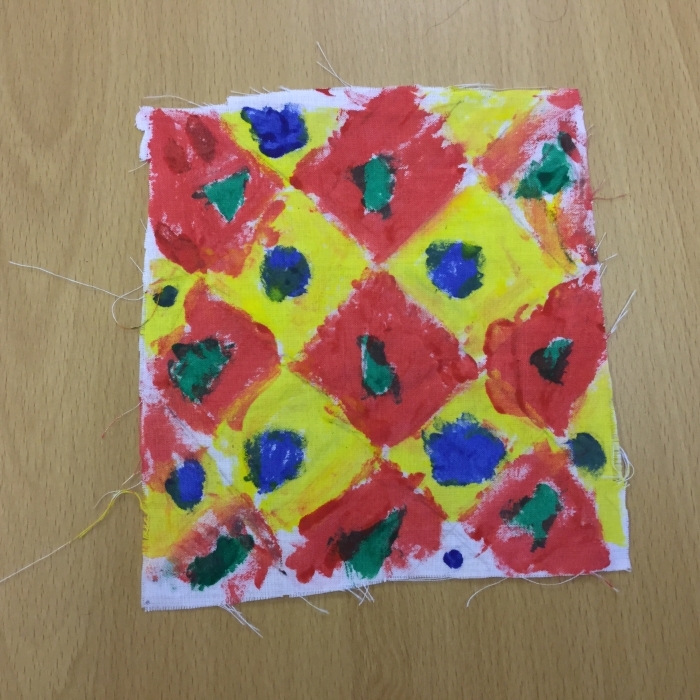 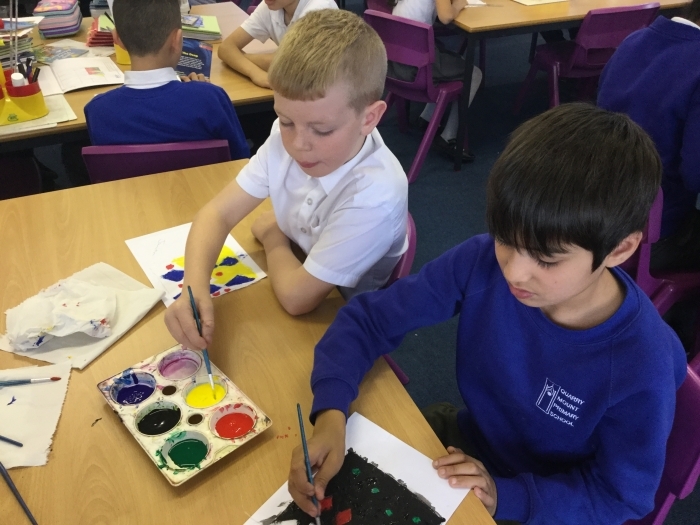 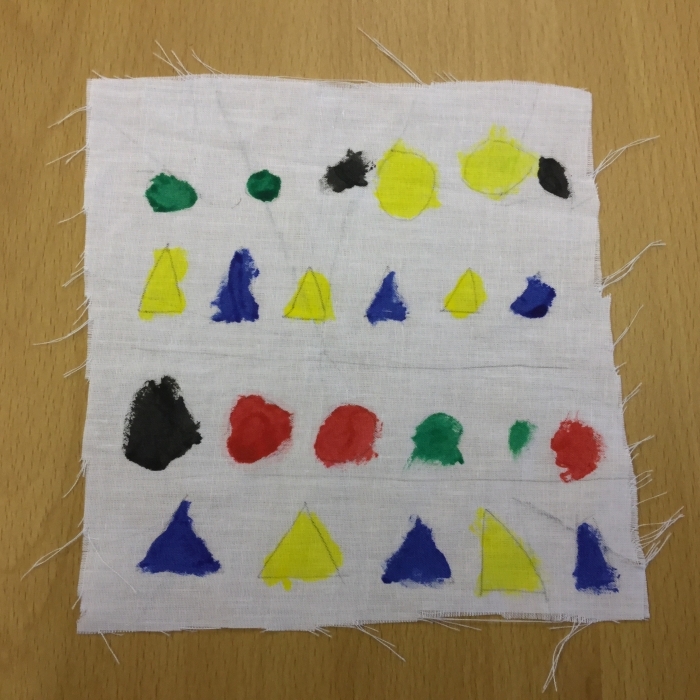 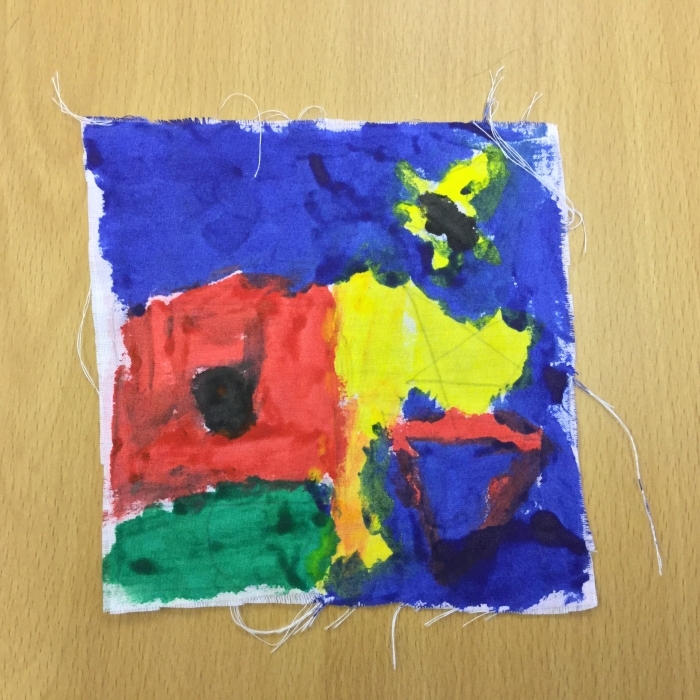 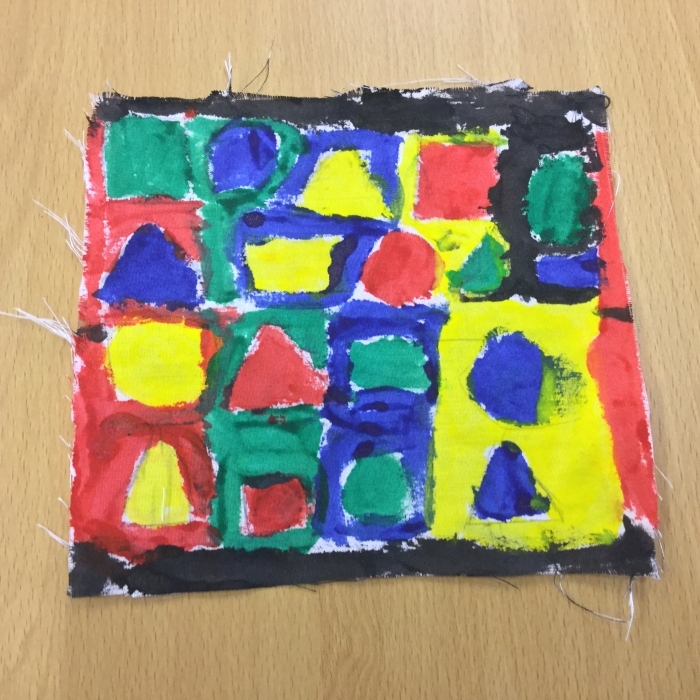 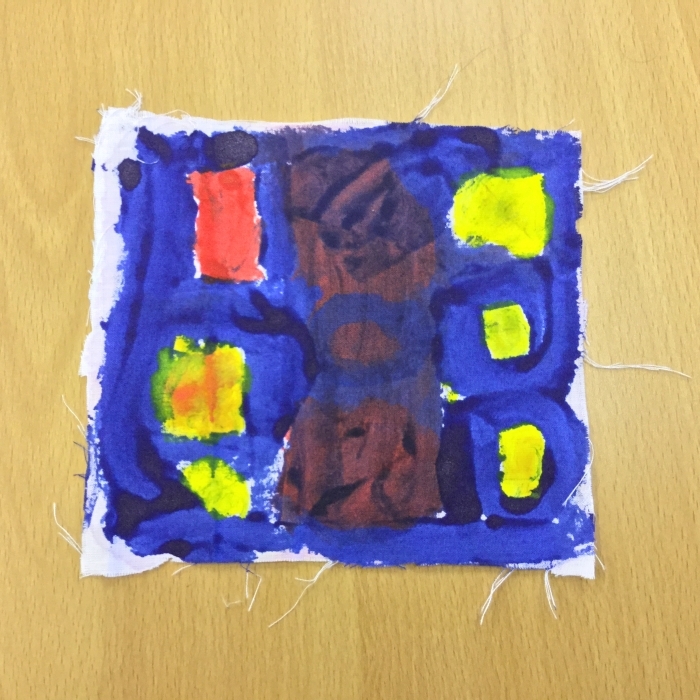 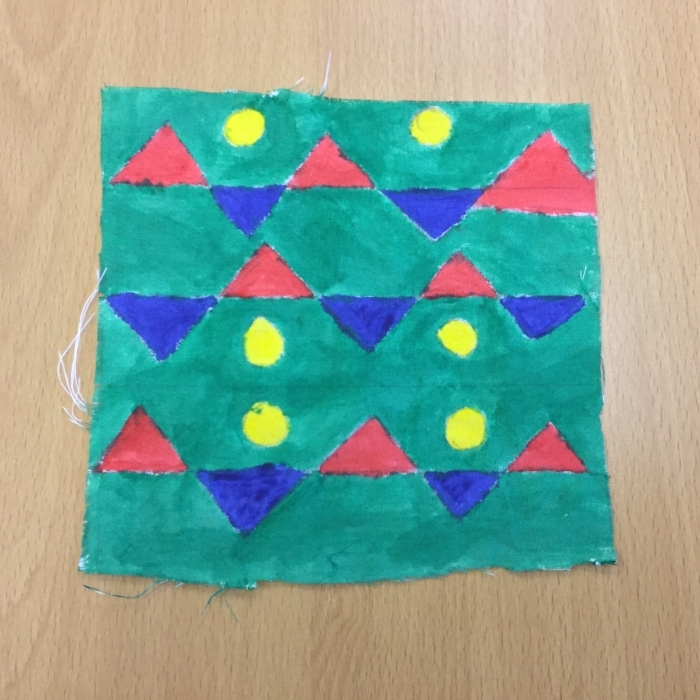 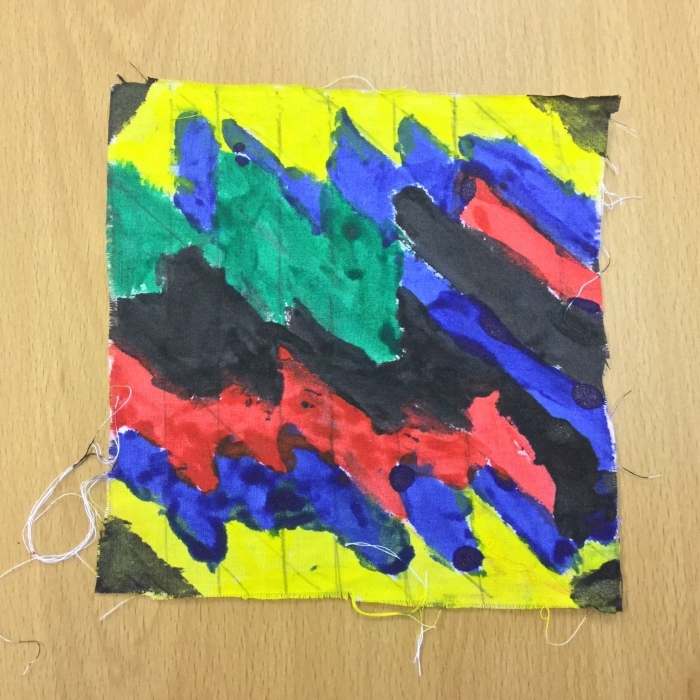 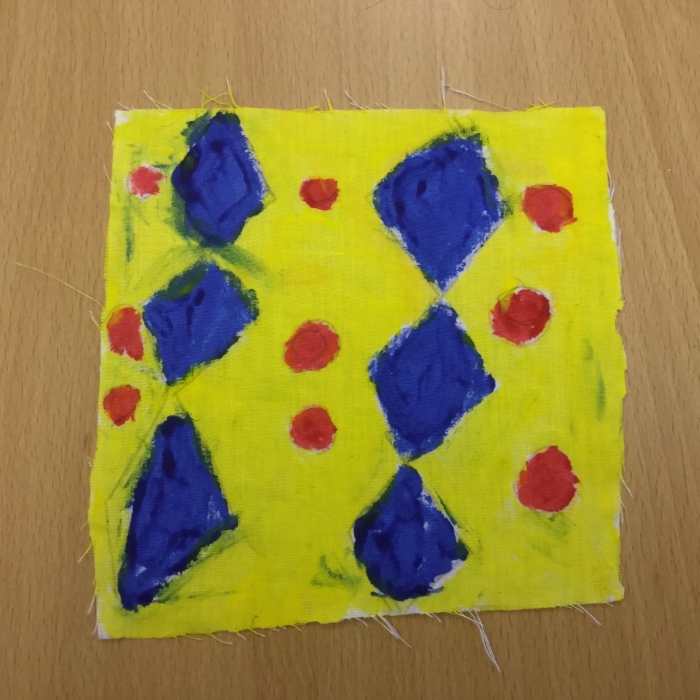 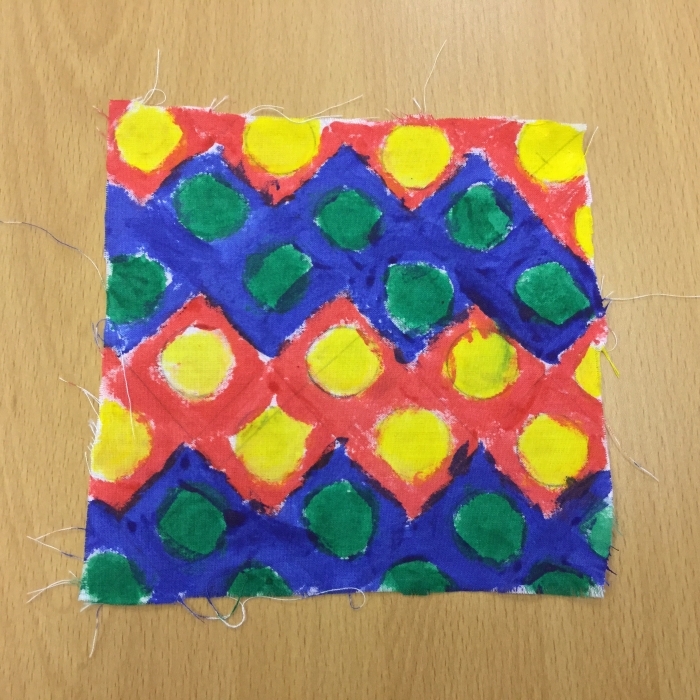 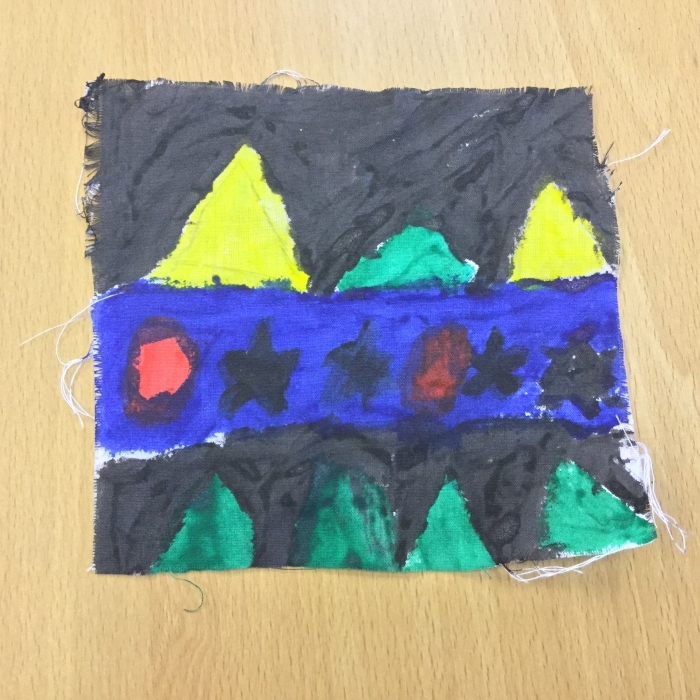 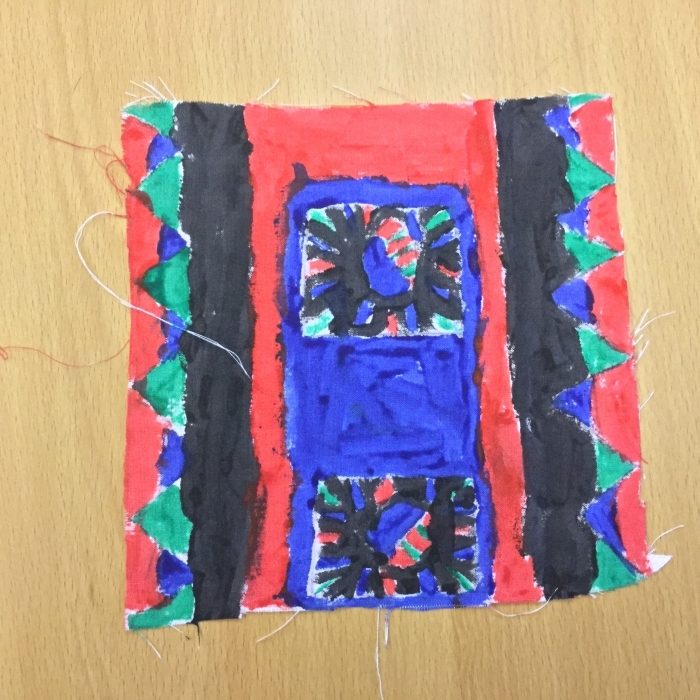 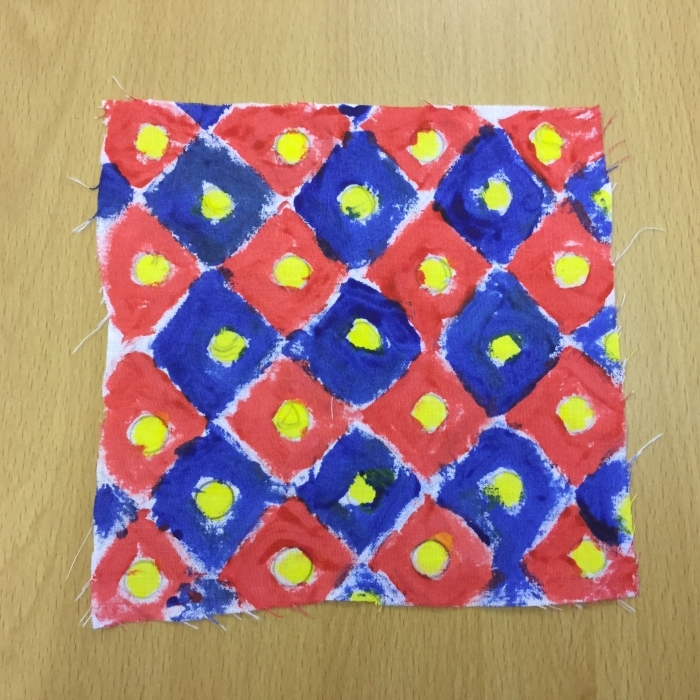 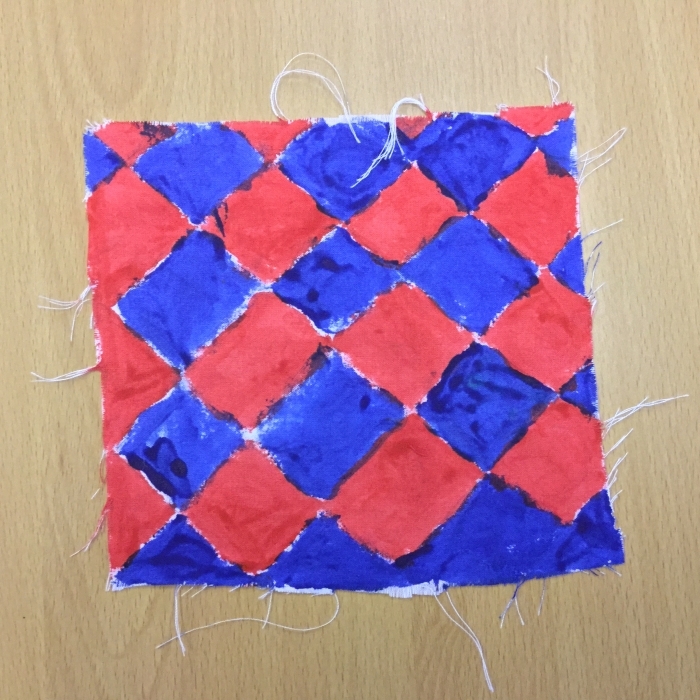 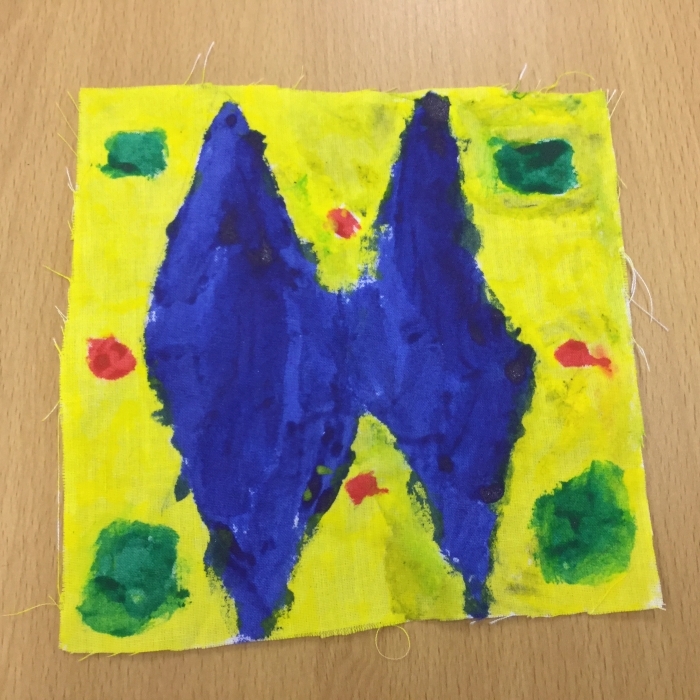 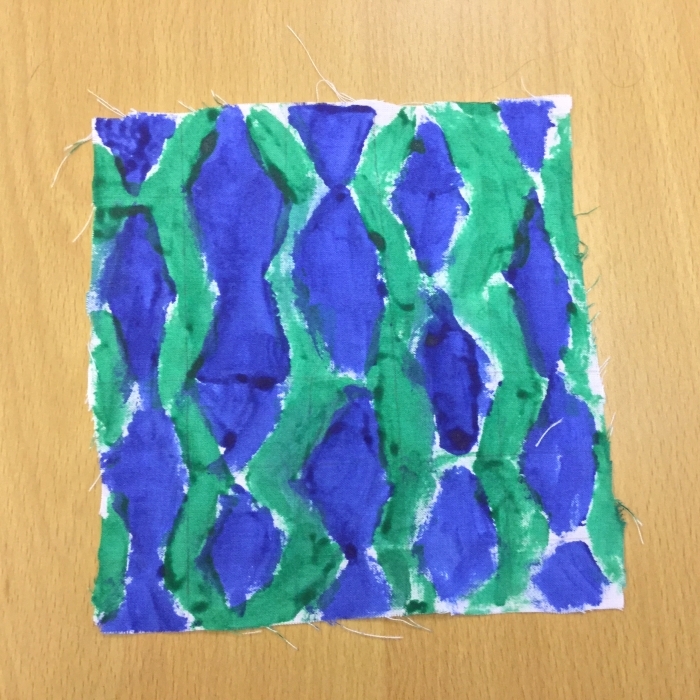 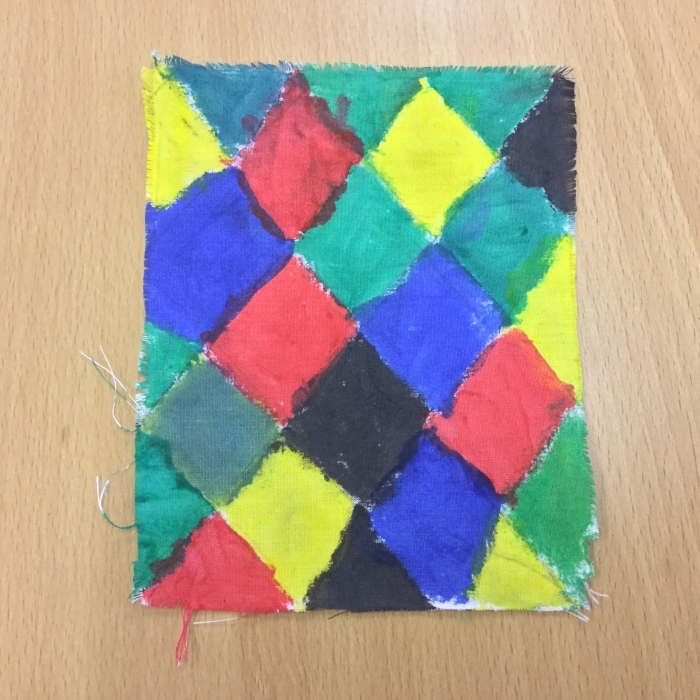 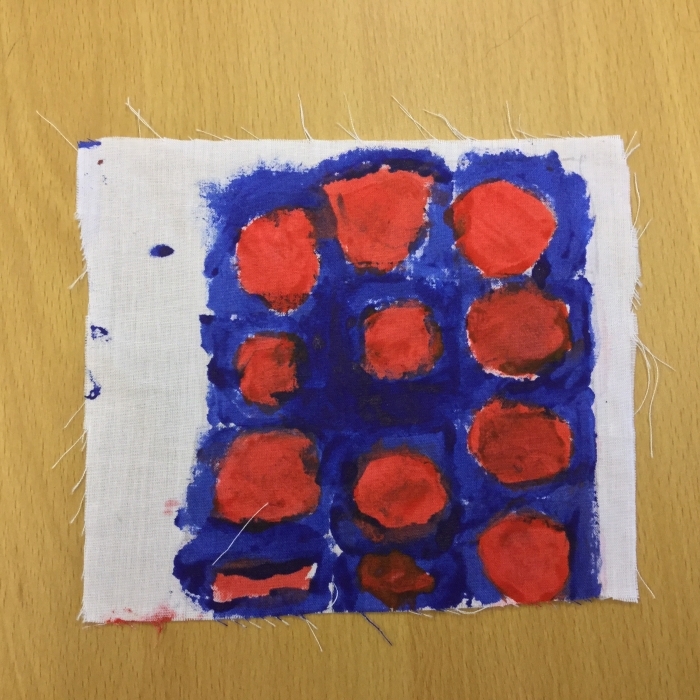 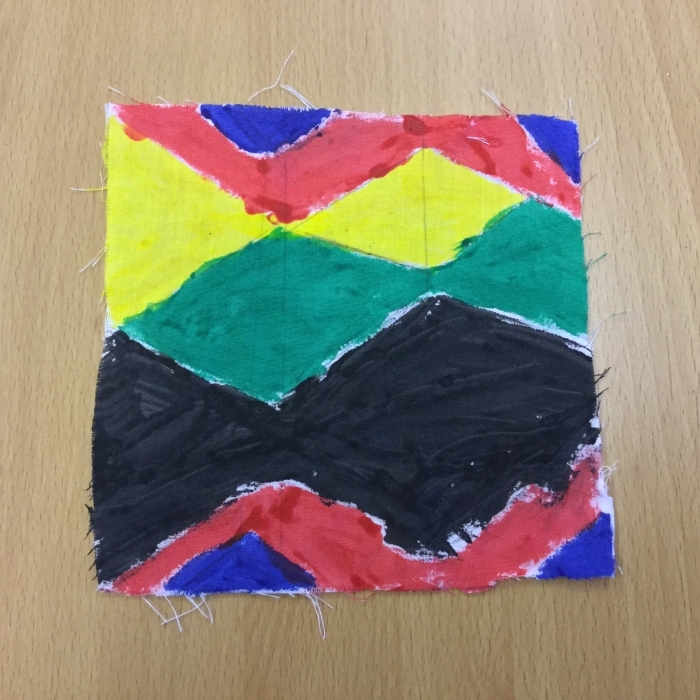 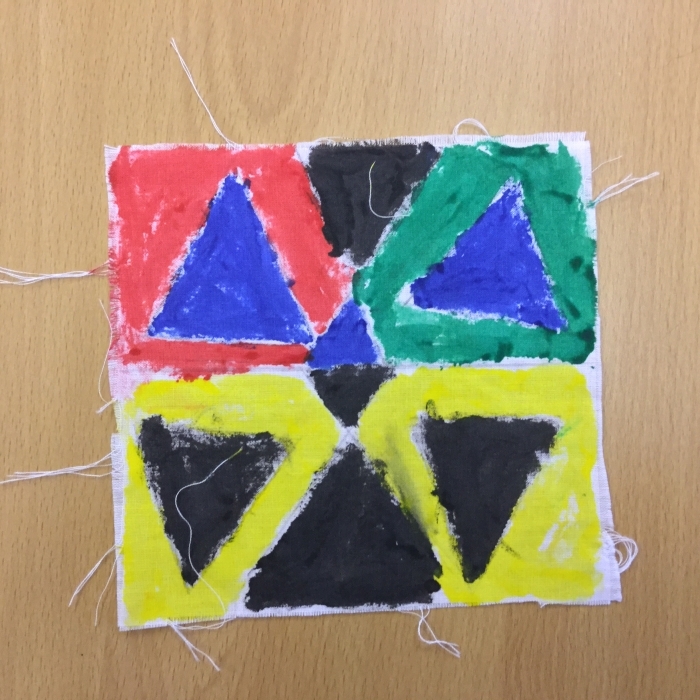 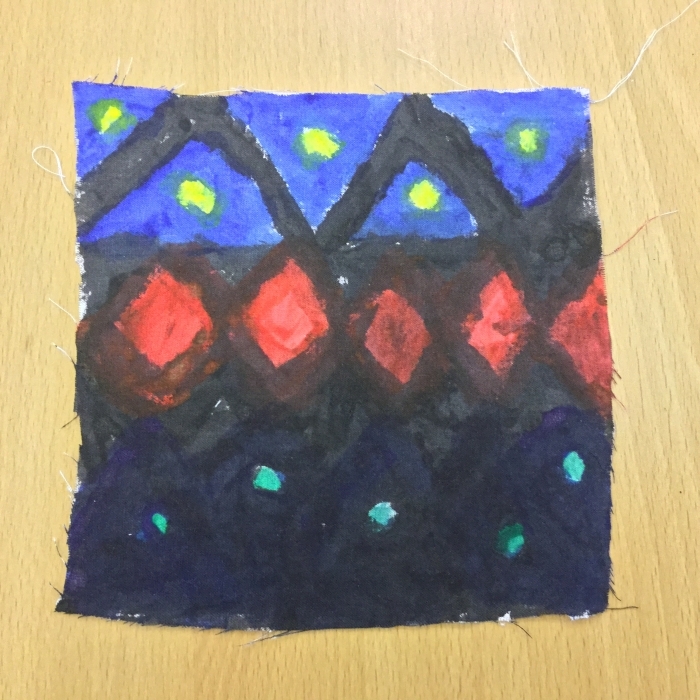 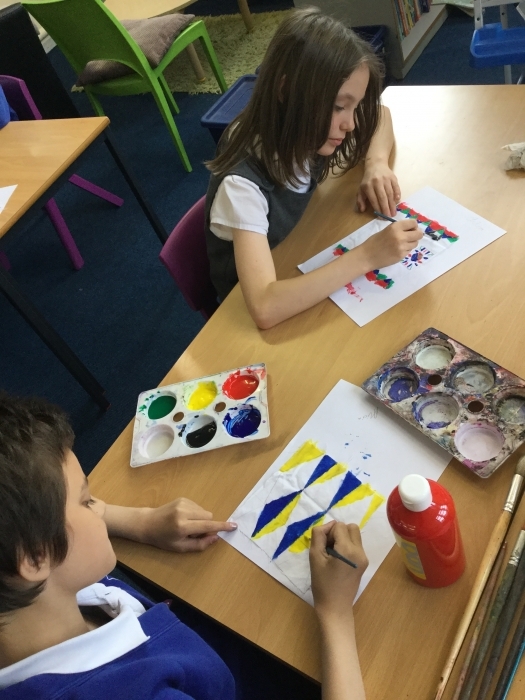 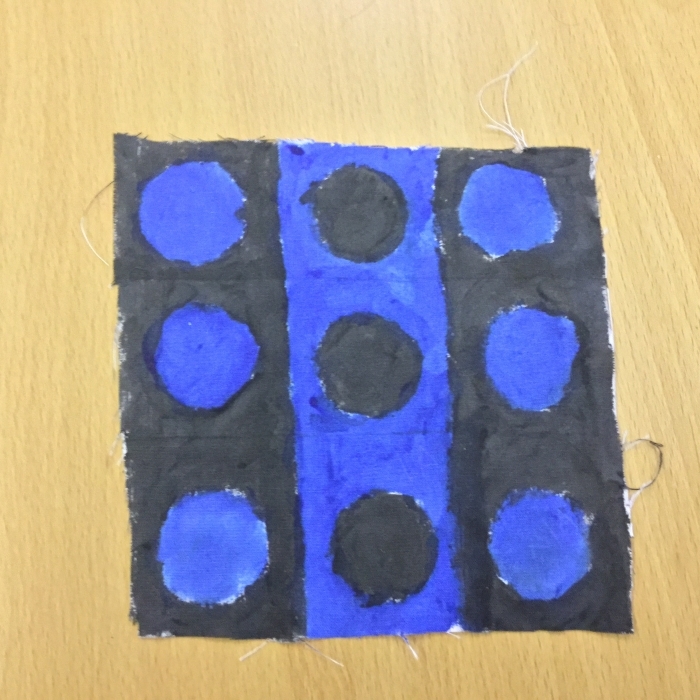 As part of our D.T work this half term, we researched geometric South African patterns & used this research to design and paint our very own patterns. 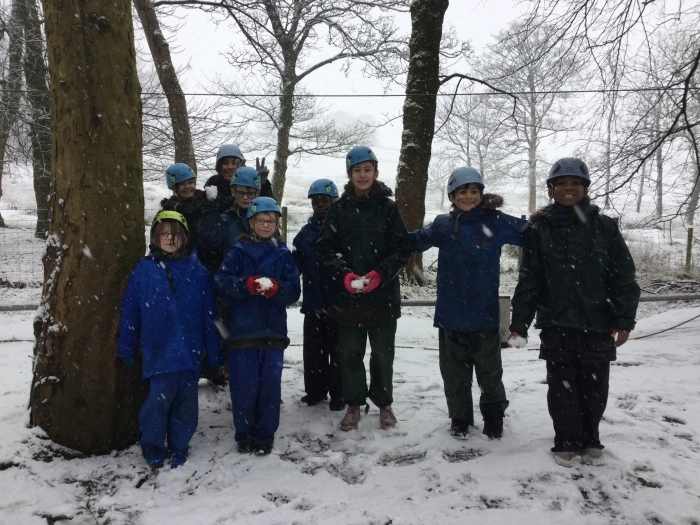 We think we did a fantastic job! 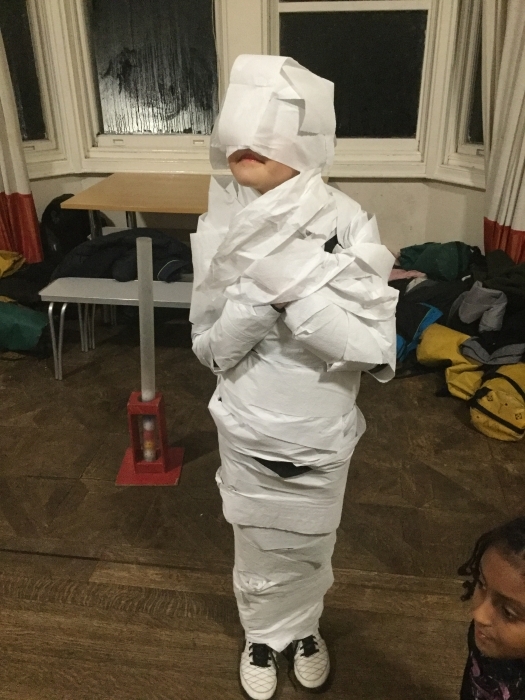 We hope you agree. 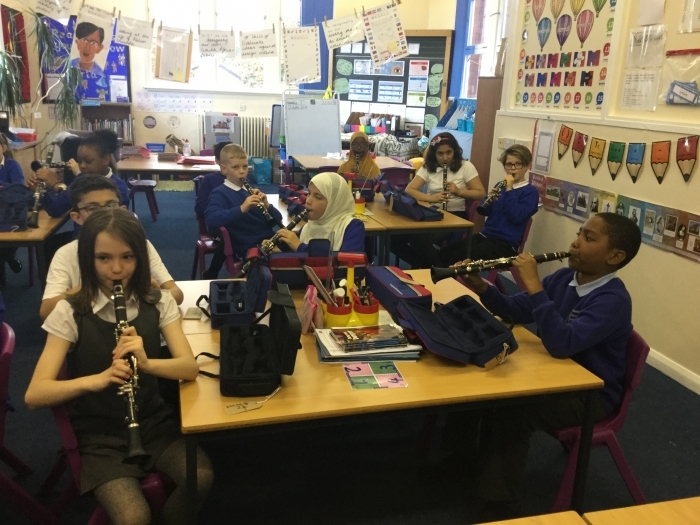 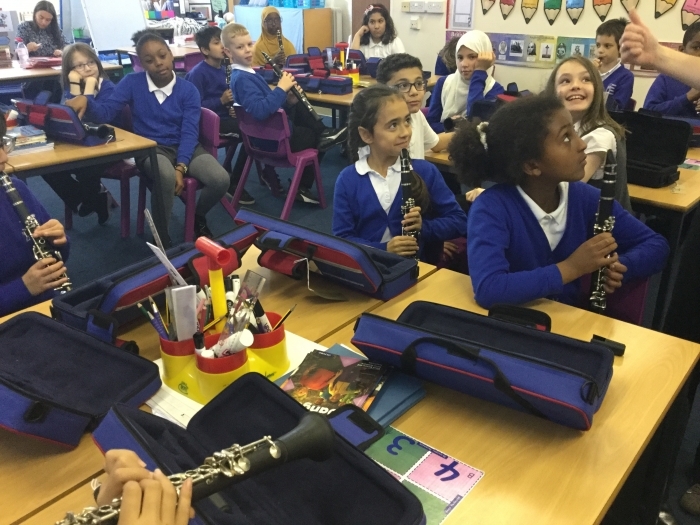 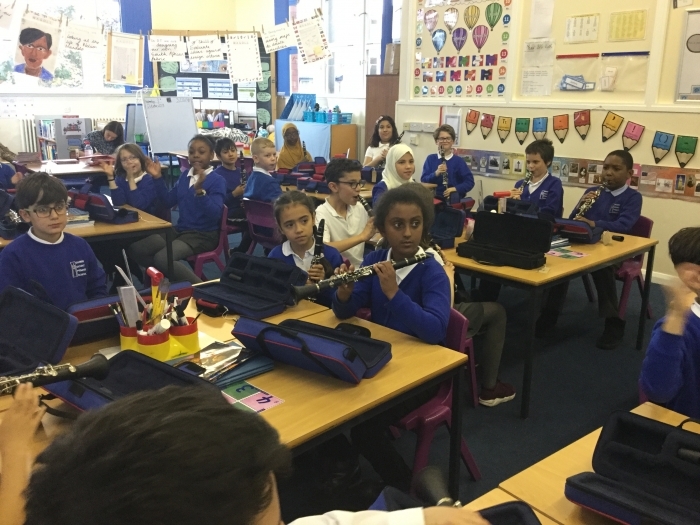 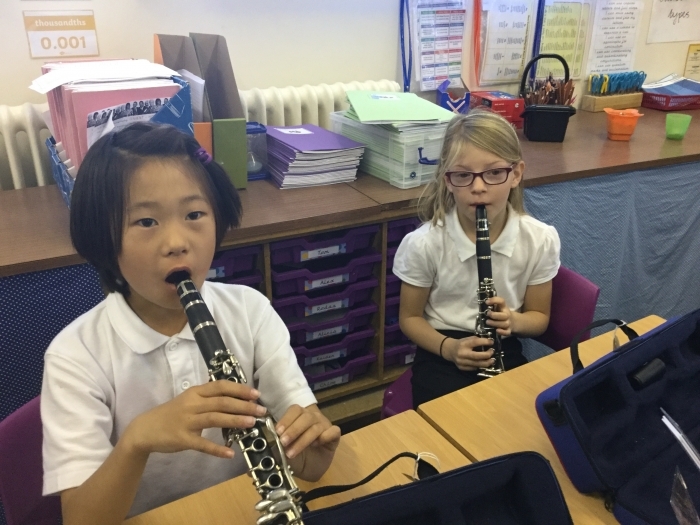 In Year 5 this year, we have begun learning to play clarinets. 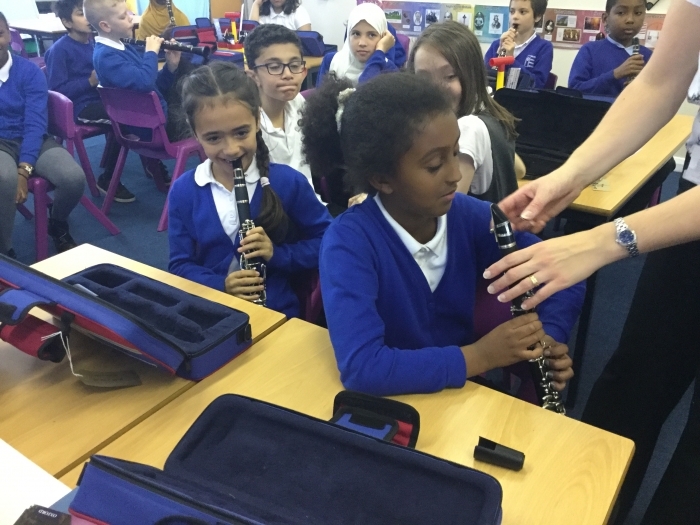 We are really enjoying it so far and we can all already play an E note independently! 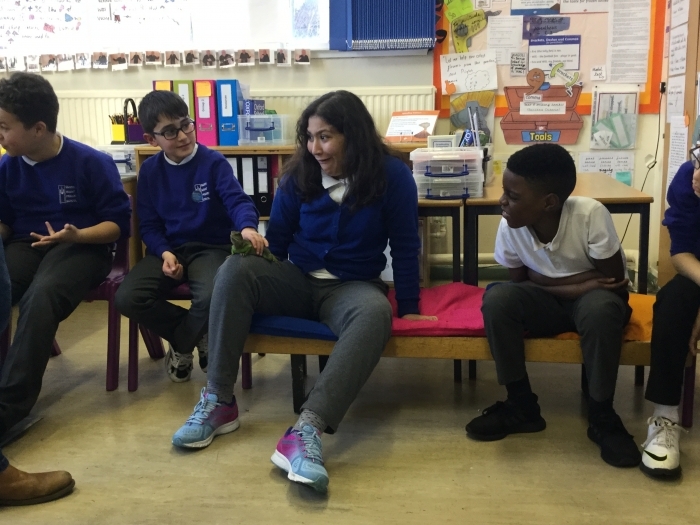 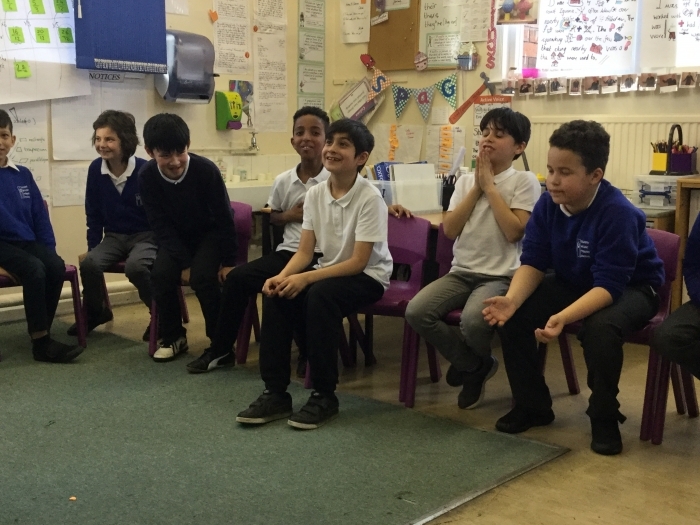 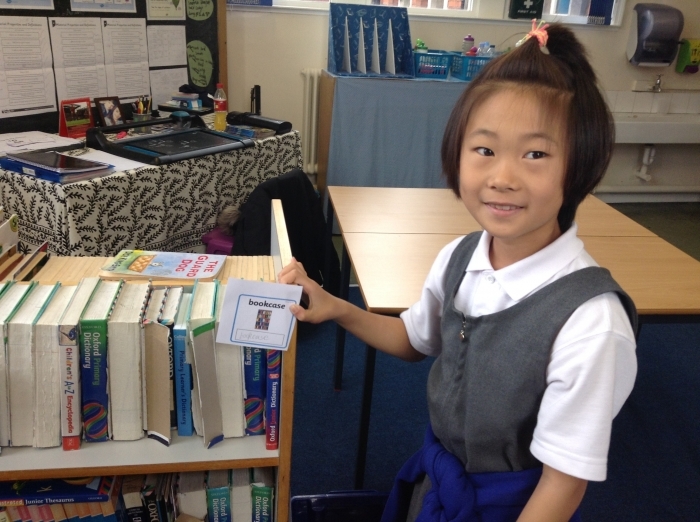 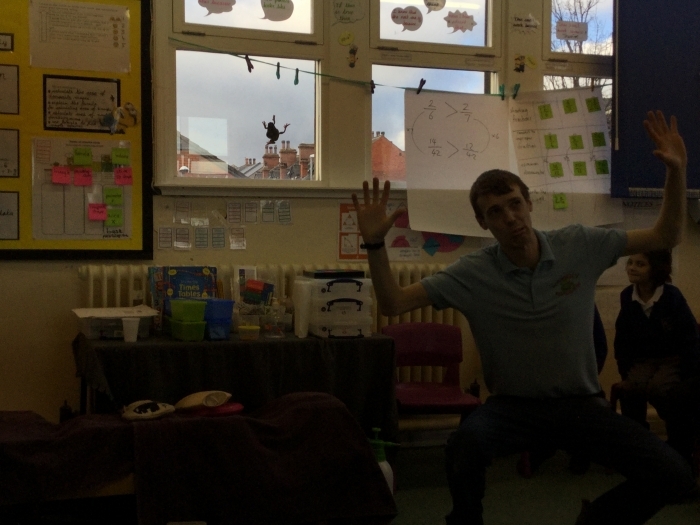 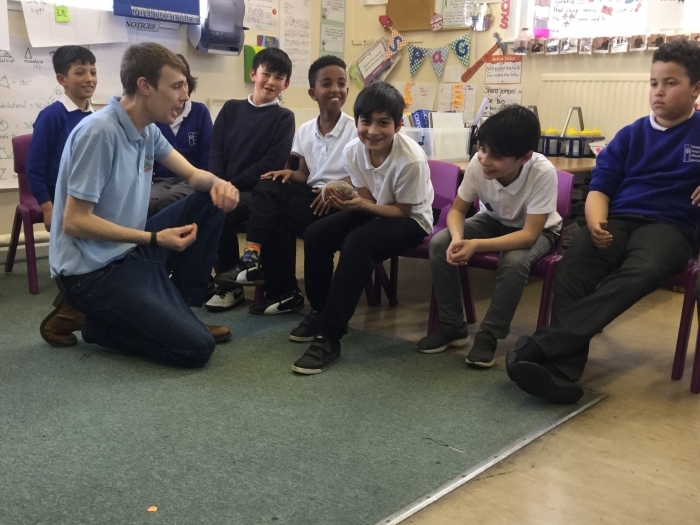 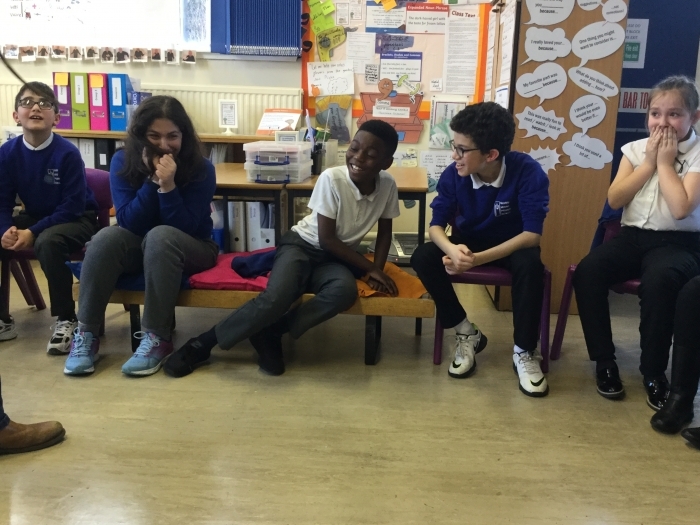 For one of our hook lessons this half term, we roleplayed as the children in our “Journey to Jo-burg” class reader. 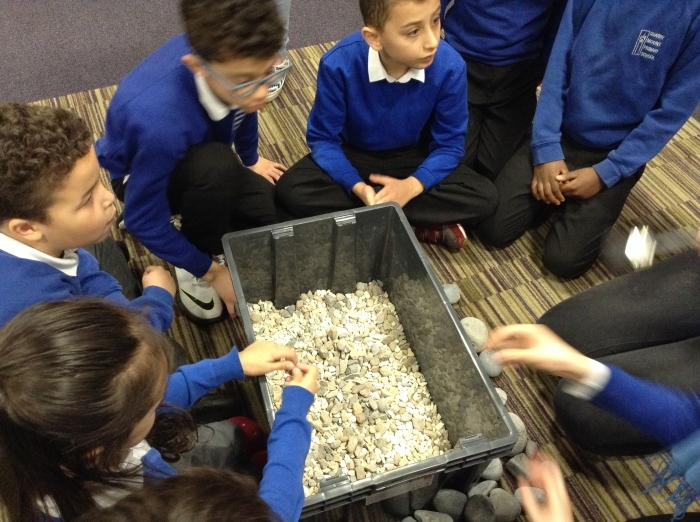 We imagined how it must have felt to set off on a daunting journey for a difficult reason. 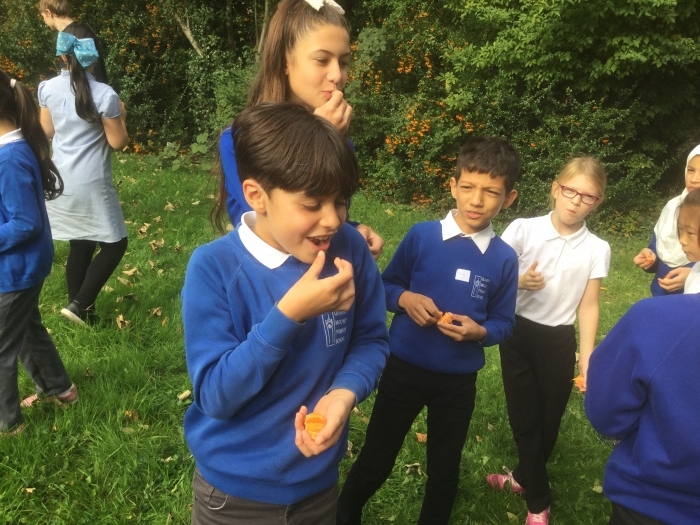 We also ate oranges and imagined it was our first time tasting them, like Naledi and Tiro. 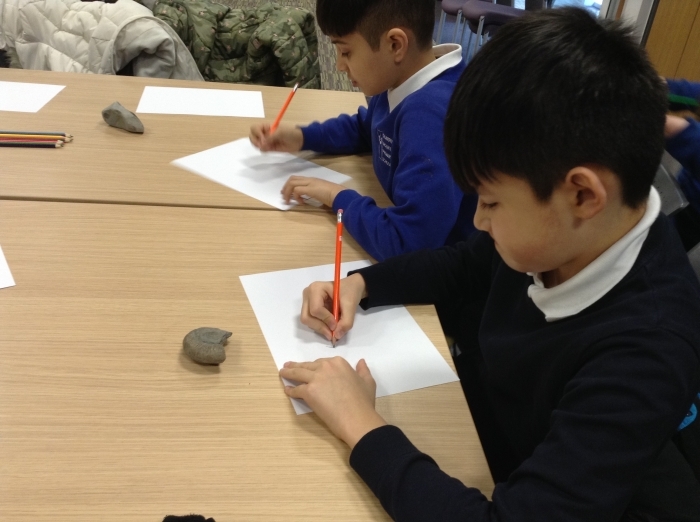 This helped us to write our own story.